When I was first indoctrinated into the X-Plane simulator (around early versions of X-Plane9) I was totally dismayed on how little was really available in the major areas of mega airports. There was a few, but most were converted 2004 FS sceneries done by devoted souls like Ted Davis. 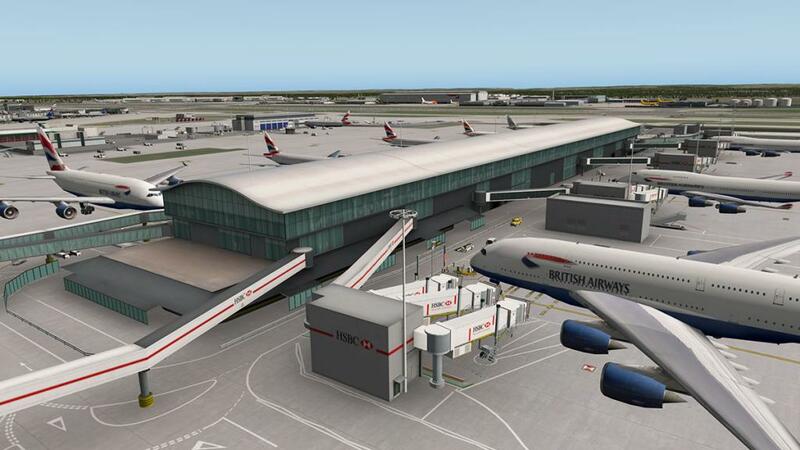 For the major London area it was really almost laughable, and the thought of not even a slightly decent London-Heathrow for the simulator was simply demoralising. 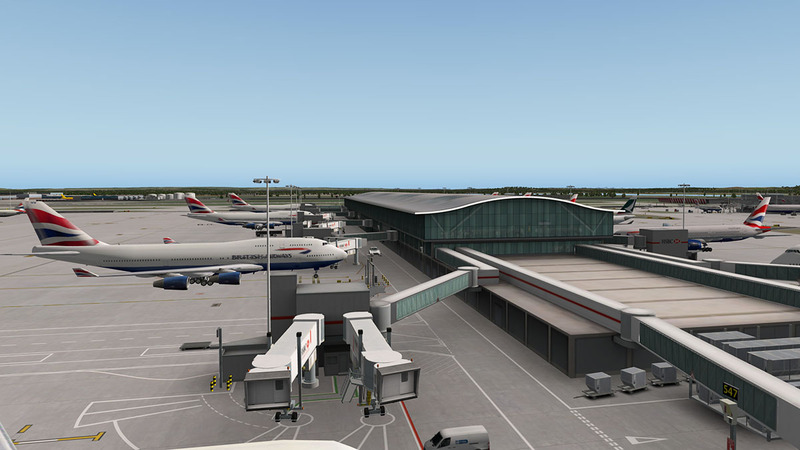 If your British then Heathrow is the cornerstone of your route flying, in the same way that KORD (Chicago) is to the Americans. 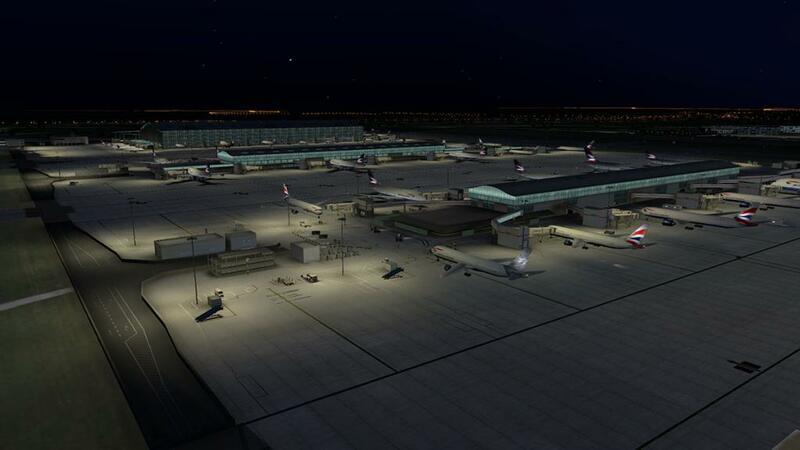 EGLL is in west London the single busiest airport in the United Kingdom and the busiest airport in Europe by passenger traffic. It is also the third busiest airport in the world by total passenger traffic, and in 2014, it handled a record 73.4 million passengers. The airport has a personal history for myself as well, as my father worked there as a chef in the central main airline and staff staff kitchens in the early 70's, and a few summers of my youth were not chasing skirt (oh come on!, those Air French stewies were WAY out of my league and I was to young anyway), but aircraft rego's from behind powerful binoculars perched up on the freezing cold Queen's Building terraces. 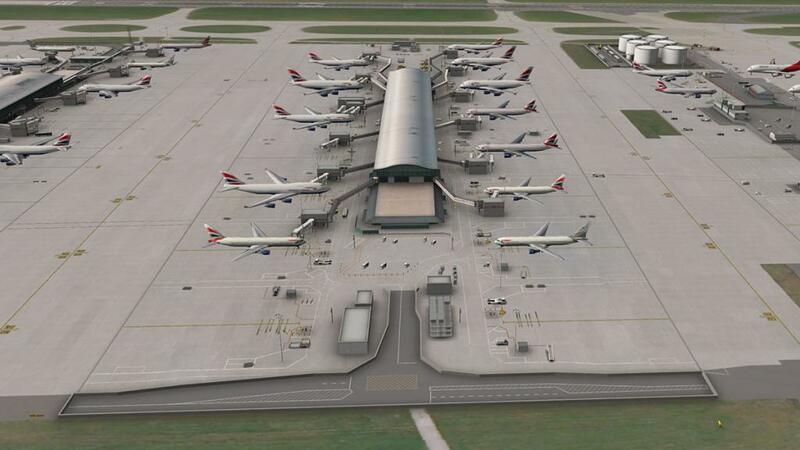 It is Heathrow and that distinctive smell of everything British. 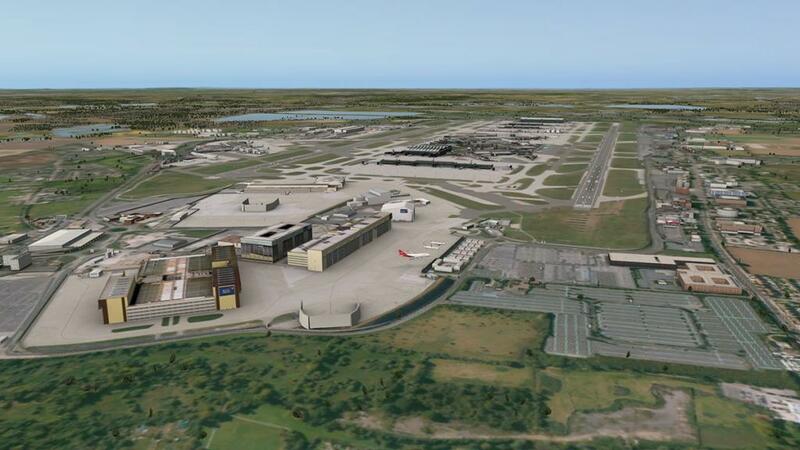 The Heathrow of today is very different from the one of childhood memories, the Queens Building and most of everything else has I knew is gone or been replaced or renovated. In confined spaces the airport is changing to meet the modern demands of today's passengers, and there is more to come. But a few areas of old Heathrow are still there as I saw while creating this review, but for how much longer is debatable as committees usually get what they want in the end. 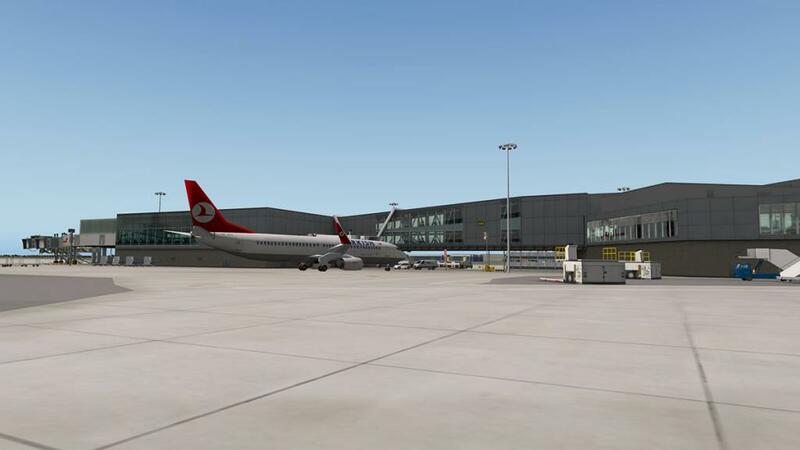 Through the X-Plane simulator I was able to do something now I only could dream about on those cold terraces all those years ago, land and takeoff an aircraft at the airport... how great is that. But then another question came and haunted me, in? Will I be disappointed, can this scenery from Aerosoft live up to decades of memories and the feeling of a place that I have transversed through so many times over most of my life. 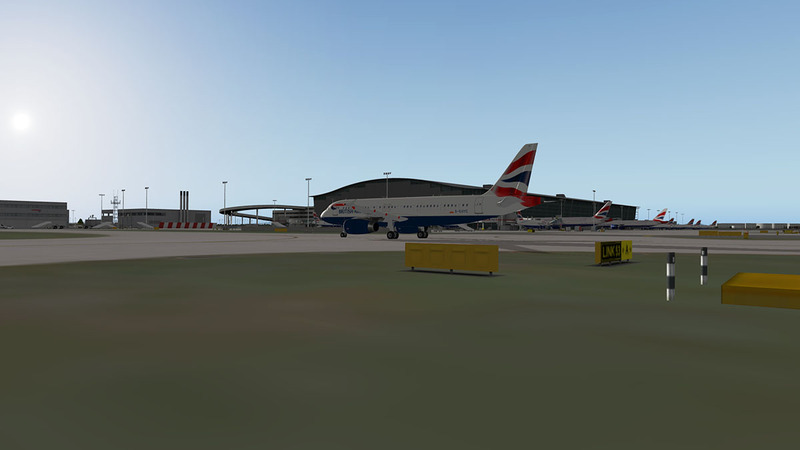 My BA699 route was from LOWW (Vienna) to EGLL (London), arrival was via RWY 09R with STAR (Weald) DETLING (DET 117.30) and EPM (EPSON 316). First sight of Heathrow is of not much. 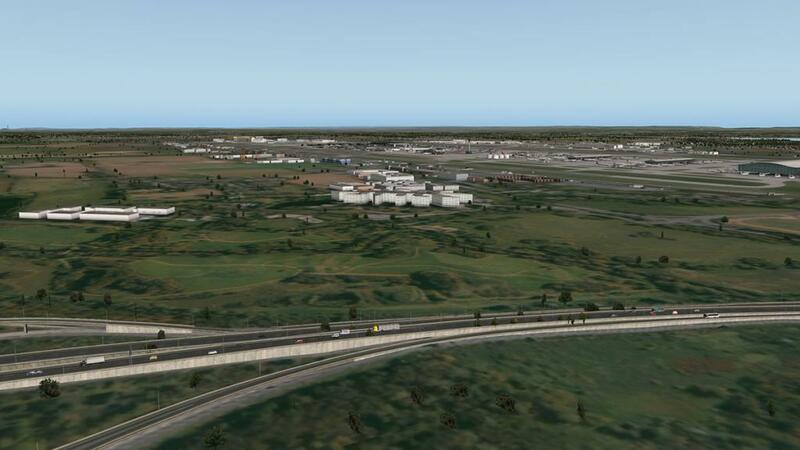 It blends in well with the default scenery as I pass due south of the airport. 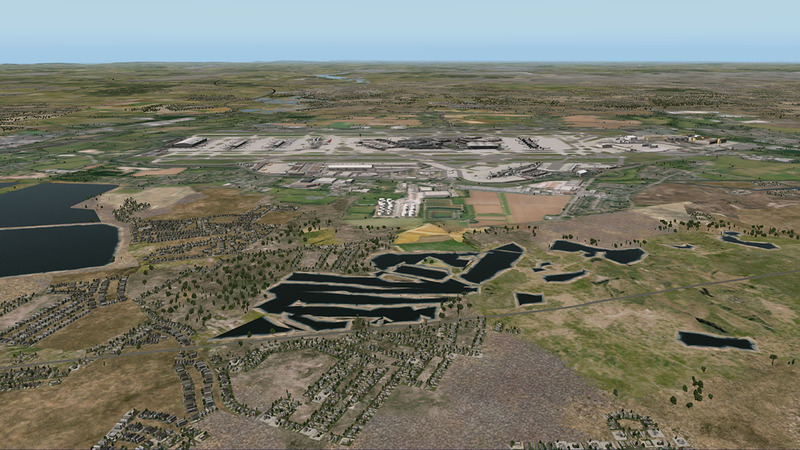 If you use Heathrow regularly then to the south and west of the airport then the huge seven reservoirs are your main visual focal points to your position to the airport and approaches to the runways 09L and 09R. Your focus soon changes on final approach as there is a then lot of buildings (if just blank objects) and a pass over the busy M25 that makeup the arrival view. 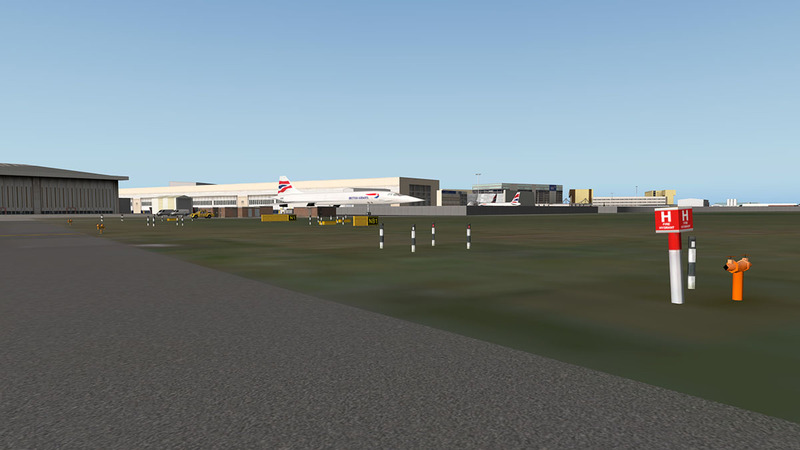 The exceptionally large Terminal 5 looms on your left with the smaller T5B and T5C terminals in line just past and the distinctive British Airways cargo building is significant on your right. After landing and aircraft cleanup your now having to consult your charts as taxiing around Heathrow is quite a complex business, nothing is noted just as A or B taxiiways (they are there of course) but are all joined together by a multitude of "links"(noted by numbers "35") and short runoff points (off the runways) noted as like "N2", "S5" or "A10W". There are also multiple important ground holding points noted as "PLUTO", "RABIT" or "OSTER" were you have to note your position to the tower. If you are on the radio it is going to be a busy place in them directing you around. 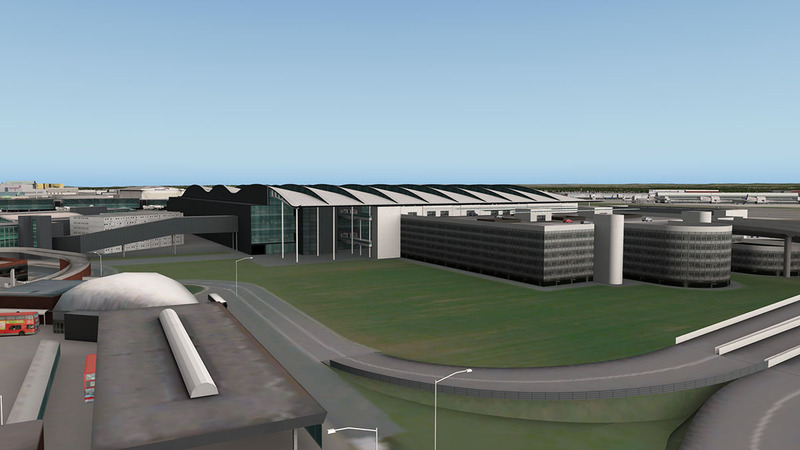 My runway departure point was "N4W" that put me directly in line with the new Terminal 2 building which was very impressive with its distinctive wavy roof. 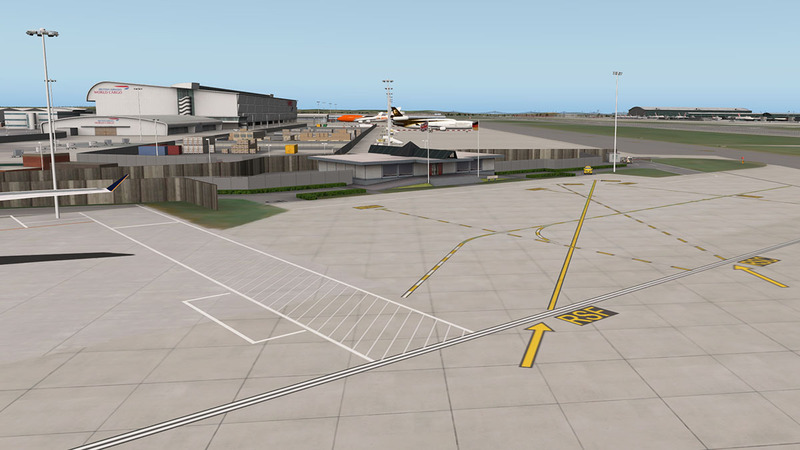 Besides the noted Taxiways A and B, there are two main sets of A and B taxiways on the north and south sides of the airport. 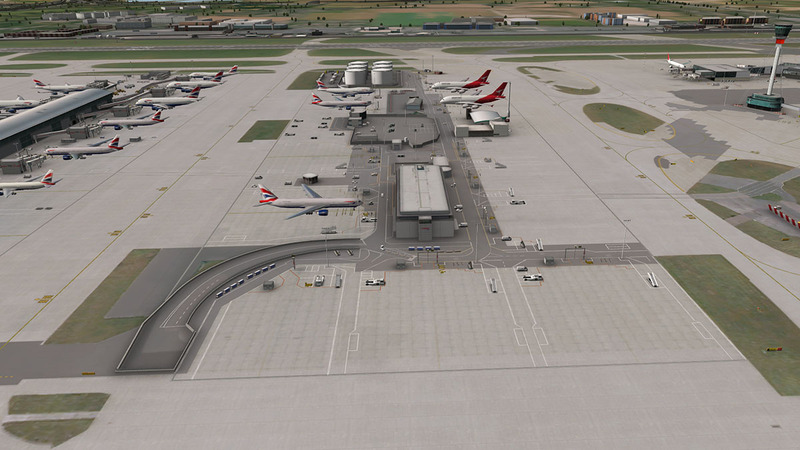 "Link 32" then directed me to main taxiway "B" for my long trundle west to the T5 complex areas. You are extremely grateful then that Aerosoft have bundled in a full set of charts (73) with the scenery that includes the ground routes, SID, STAR, RNAV and SIDPT's (Standard Instrument Departure Procedure Text) significant also are the included ground route charts for Airbus A380 movements at the airport, you can only go certain routes in your movements to a certain runway or terminal gate position with this VLA aircraft. You will keep your printer working for quite a while to study the routes on the ground to make sure you follow the correct procedures and directions. Ground signage is excellent, not only are the directions clear on one side, but the actual signage boxes are well done in design with the back as detailed as the front... high detail on the infields is also excellent with a lot of various weather, ILS, stripy marker poles and even the many fire hydrants dotted around, but no grass? which is notable feature for an Aerosoft airport scenery? 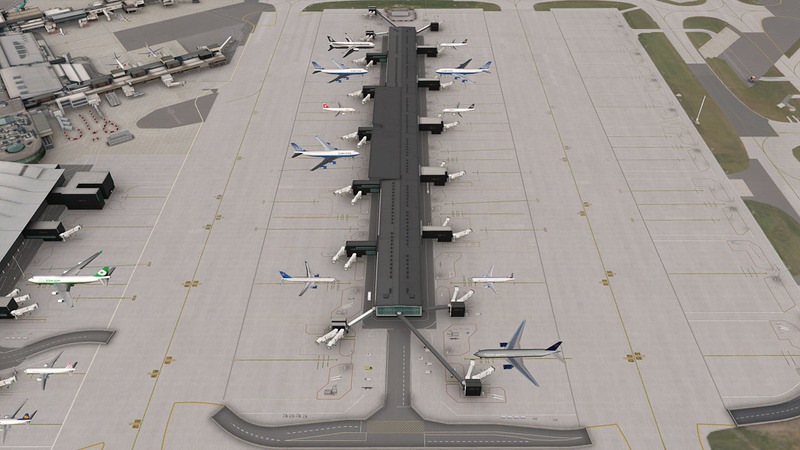 Runway, ramp and taxiway textures are excellent and so is all the taxi and ramp linage, with even great ground detailing like the drainage grates on the ramps. 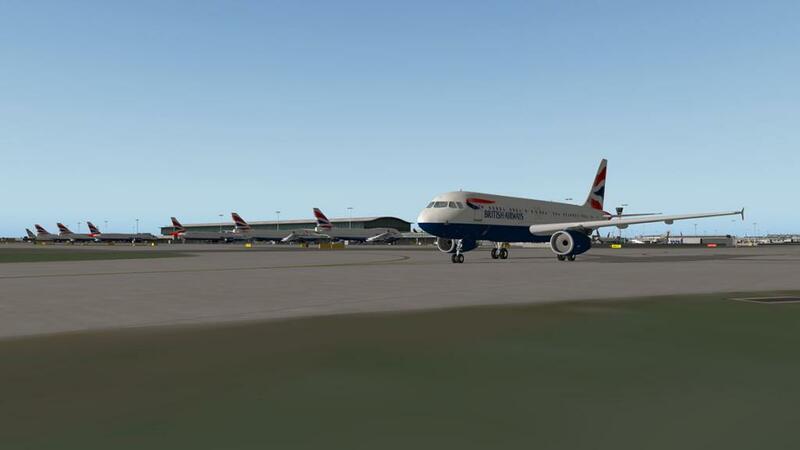 Heathrow is the United Kingdom base for its flag carrier... British Airways. And the flags are certainly flying here. 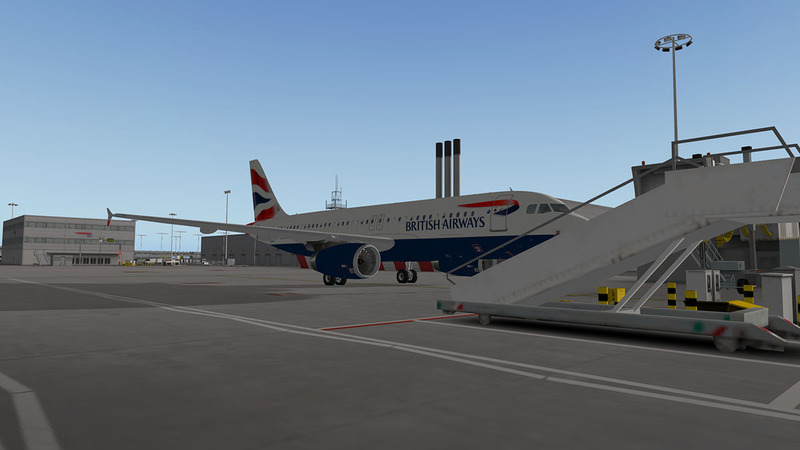 You can download an optional comprehensive static aircraft file to fill EGLL out with a lot of static aircraft (OpenSceneryX is required) and very well done it is, but note that if arrive with your BA A380 you will be very hard pressed to find a gate to dock to? They are all filled up already, so a little editing is required to make a few gates available for use, even with the A320 I was taxiing, I was finding it hard even to find an open BA gate to berth in? 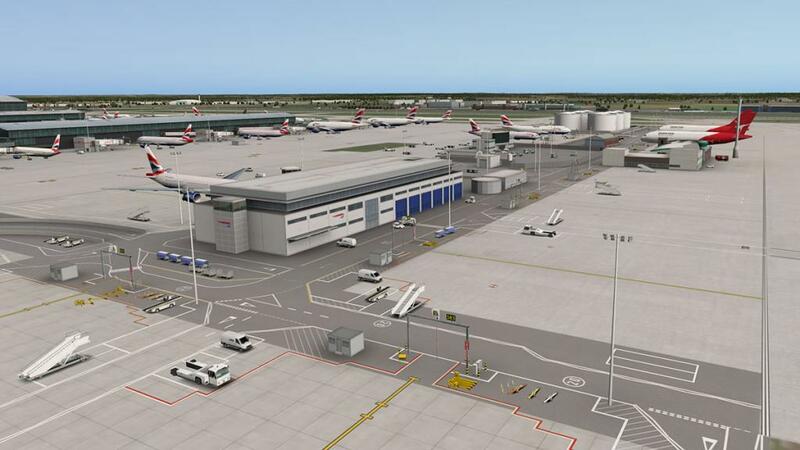 Aerosoft's EGLL-Heathrow is extremely well populated with every imaginable piece of airport equipment you can think of, this airport is full, totally! 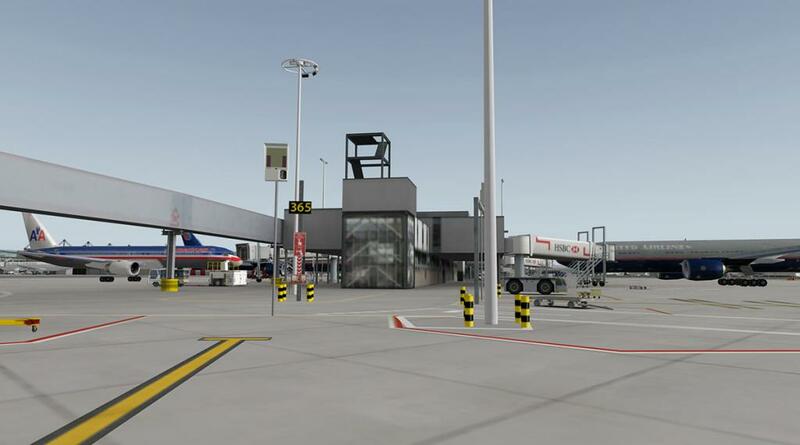 You are surrounded by a perfect airport landscape and the detailing here is simply beyond believable, the surrounding areas are highlighted by the airports vehicle animated traffic, which is very expertly done, baggage carts dart, food trucks pass, buses bus, security survey in totally realistic surroundings, very impressive. My Gate is 523, nudged right up at the end of the most western southern end of the huge monolithic T5(A) Building. 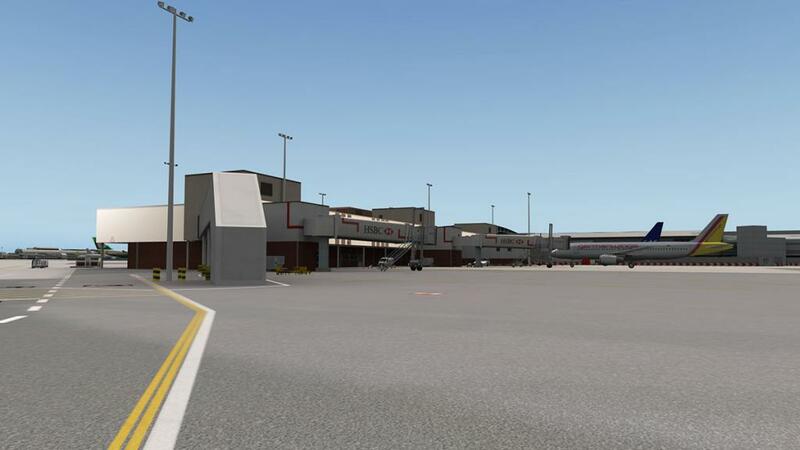 It is very impressive close up and when turning into the gate the full range of ramp equipment is waiting for me... the gate areas are extremely well appointed and the best replicated gate areas I have seen to date. 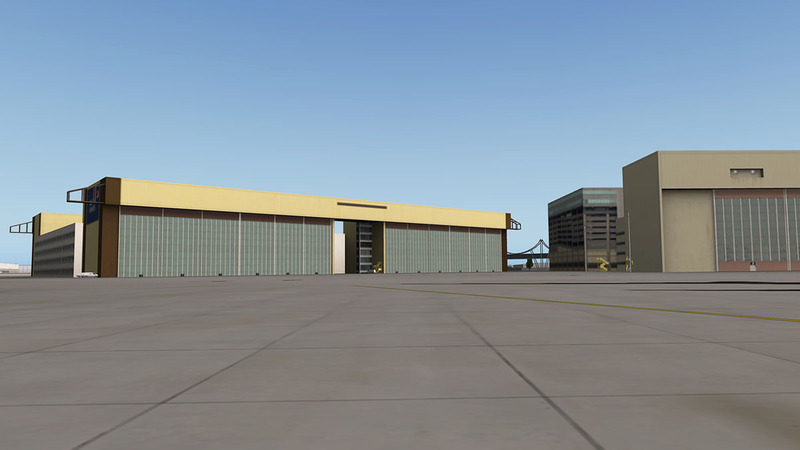 You do have the "safedock" option, that will guide you in and on every gate or stand in the airport, but the airbridges don't actually dock with the aircraft? 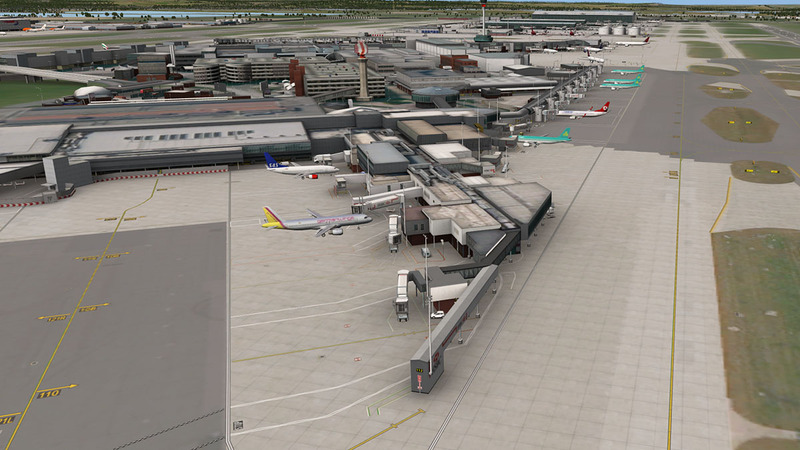 Just even a few working ones on each terminal would have been nice. 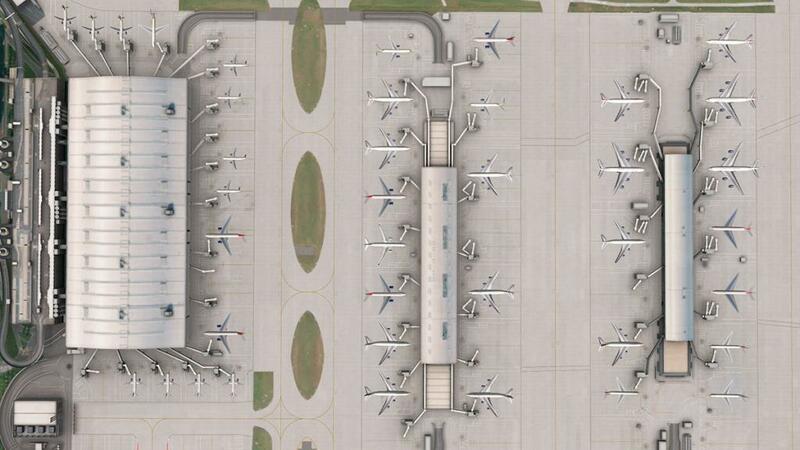 Another feature is that every gate and remote parking stand is selectable via your X-Plane airport menu, that is a lot of choices! 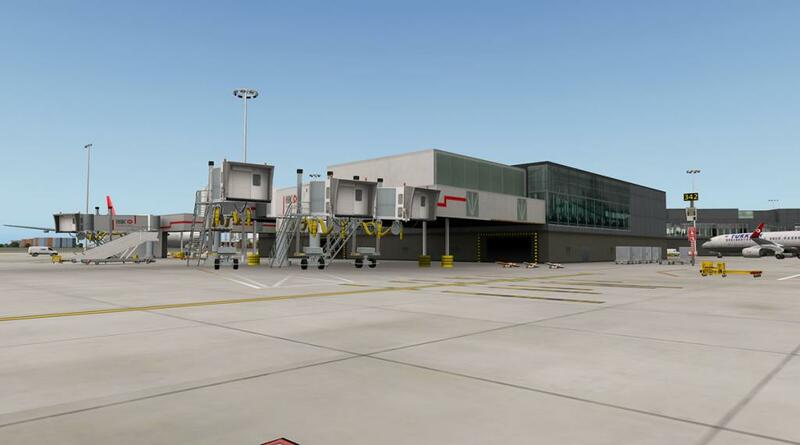 But the gates are well marked to select the one you want, notable is that there are very few gates that are without an airbridge? If you arrive with a regional aircraft and want your passengers to deplane via your stairs, then you will be taxiing around here forever trying to berth your aircraft... there are actually a few available and I will list them as well when we go through the different terminal areas, and I would note them down if you can. 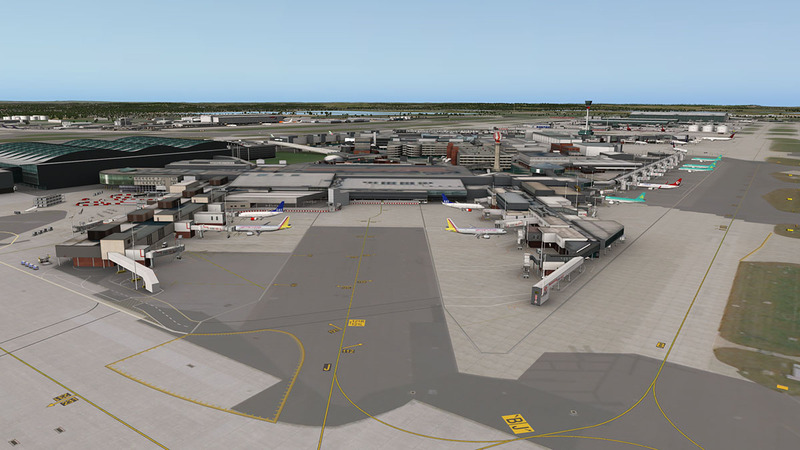 From the air Aerosoft's Heathrow looks a little empty from a distance but once into the scenery you will want for nothing in a visual sense. 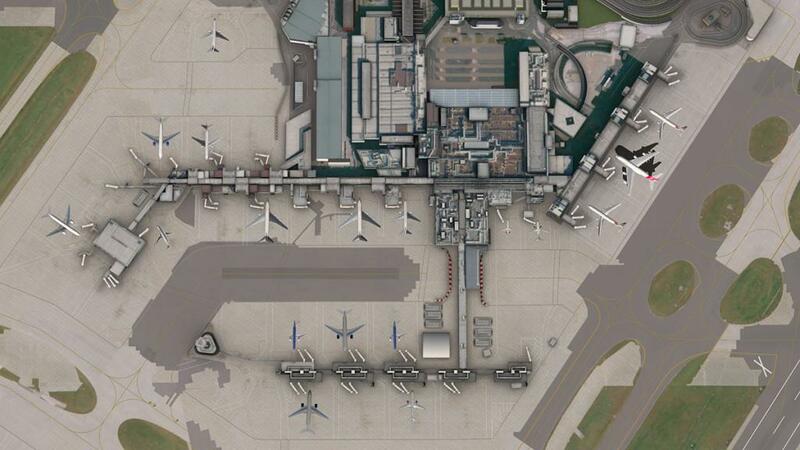 It is overwhelmingly good on the ground, but there has to be compromises, this is a very large area of airport to cover, if every single detail was covered your computer would simply grind to halt, so that is an issue to deal with first. Airports like EGLL-Heathrow get a triple killer whammy in simulation. 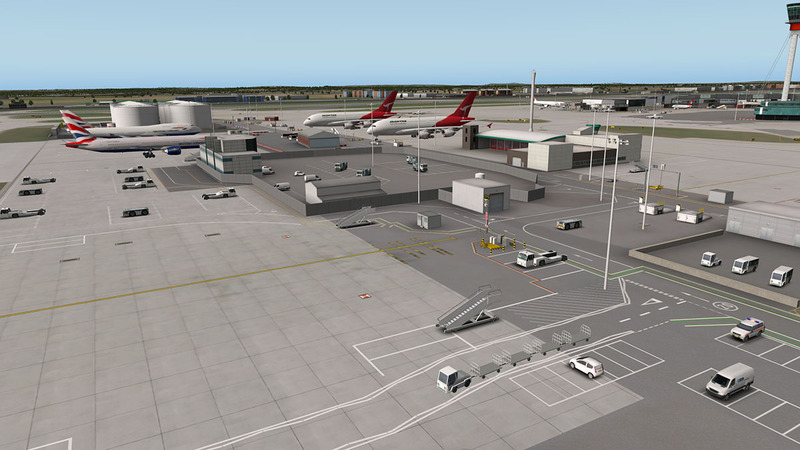 First is that the airport scenery area to be covered is usually huge and complex with a lot of objects. The second hit is that usually the airport is surrounded by a dense city, in this case London and its suburbs, which translates to a lot of default "autogen" and even cityscape buildings, roads and god knows what else. 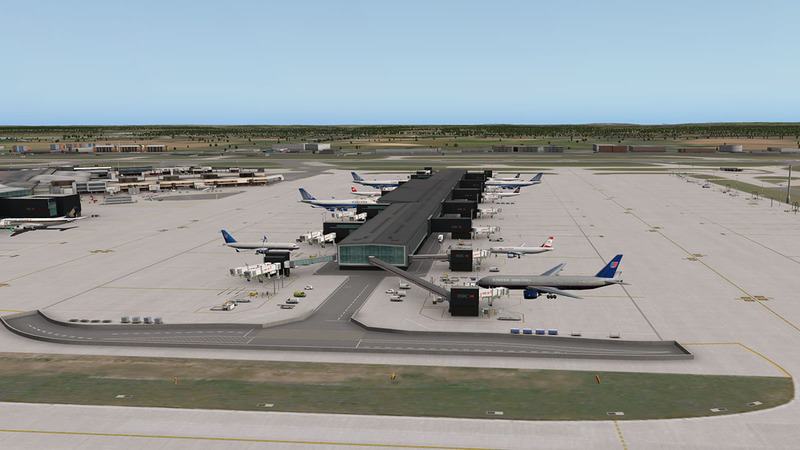 The final whammy is that certainly in this case the airport requires a lot of very heavy metal, there are no GA or even private jets in here... it is all the really big stuff, A380s, B777s, B747s, A330s and even a lot of A320/1 and B737 series aircraft. 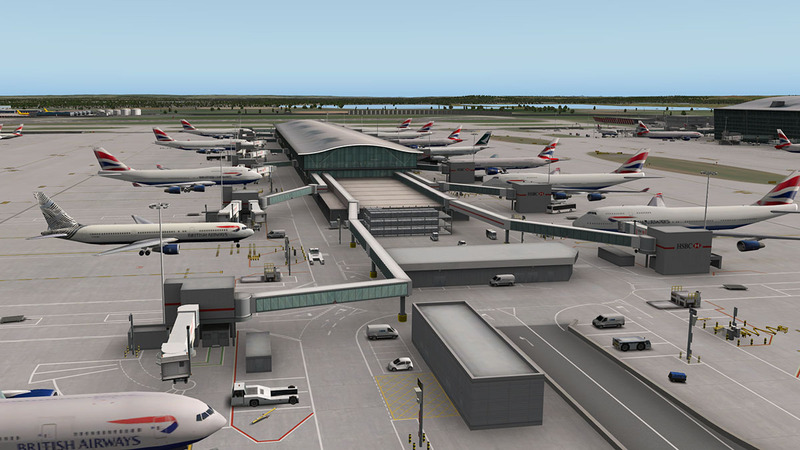 And you want your serious (payware) heavy to work in here. My biggest concern when these huge airport sceneries are announced or released is not if they are any good, but can I actually run in them? Aerosoft's very good X-Plane EHAM (Schiphol - Amsterdam) is one in question, brilliant scenery no doubt but I can't fly there unless I am in a really light (note boring) aircraft and my texture resolution settings are set to almost zero, which defeats the whole idea of great scenery. So the biggest question of this review, is not if this scenery is very good scenery... but can I actually even use it without any serious compromises? 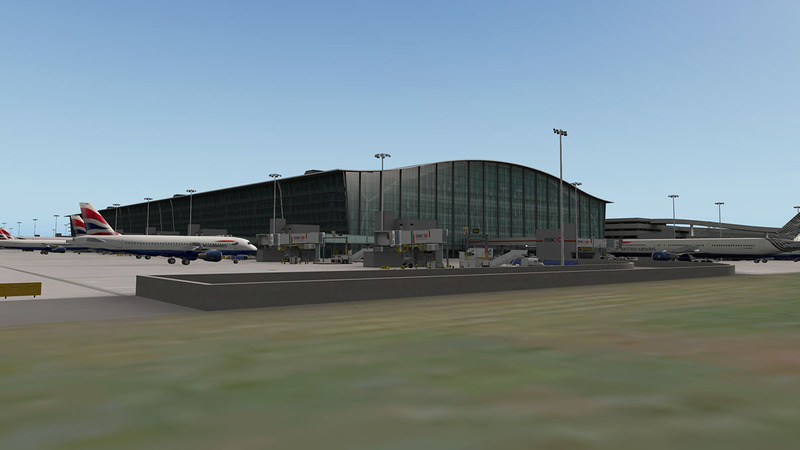 My first impressions for Aerosoft's Heathrow were actually very good. Close to the line in around the low 20s (with Peters Aircraft A320), but with still with a high texture resolution setting is very impressive. 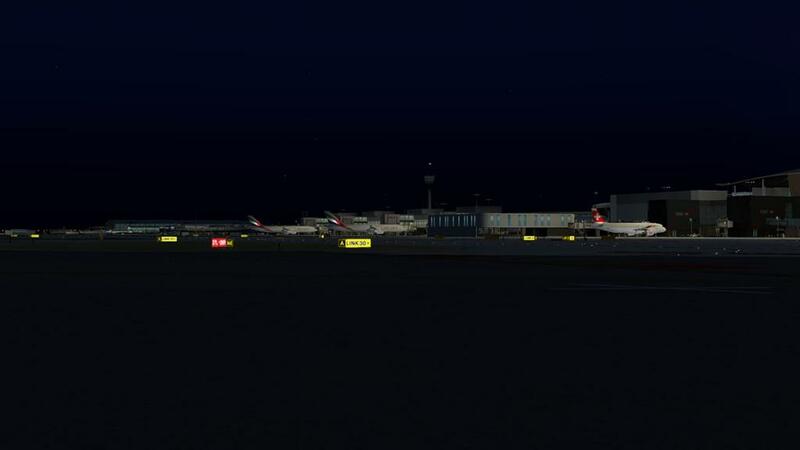 Peters Aircraft A380 was very,very marginal at around 20-19 frames as was JARDesign's A330. 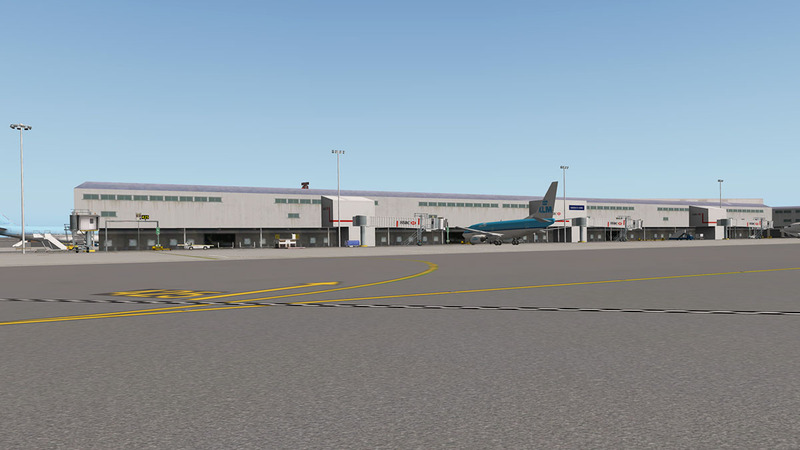 So for my computer performance then EGLL is useable, but marginal. 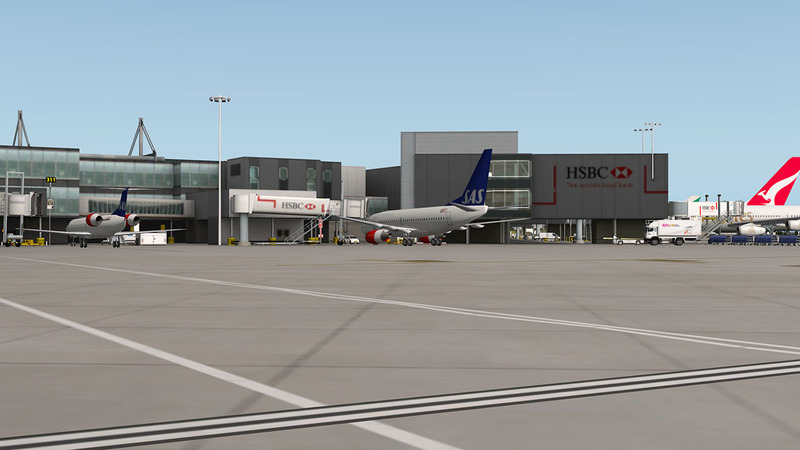 But still far, far better than EHAM, which I checked out by flying the A320 from EGLL - EHAM on the same settings and got a 12-13 frames there in contrast to EGLLs low 20's. 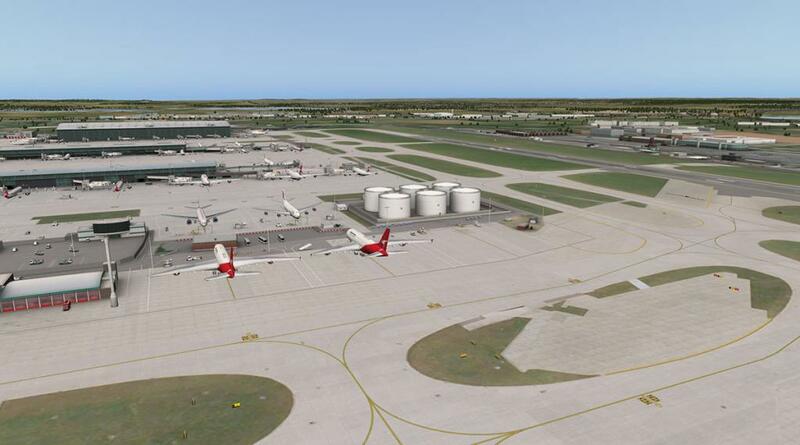 For the power users then EGLL will be great and for the rest of us, it is actually still usable... there is a trick though to use! And I will show you how to later in the review on how run the most heavy of payware aircraft with no major compromises. 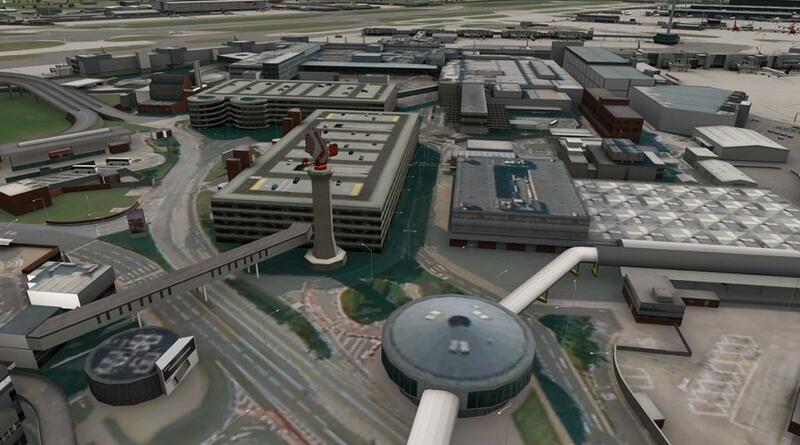 London's Heathrow airport is best visualised as three different areas. 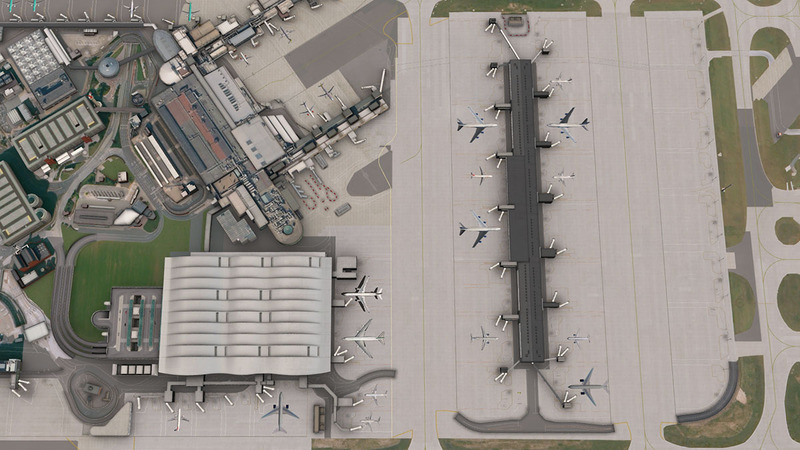 First is the Terminal 5 complexes of A, B and C. Then the (Older) central area with the new T2/T2B Terminals and finally the T4 Terminal on the south-east boundary of the airport layout. 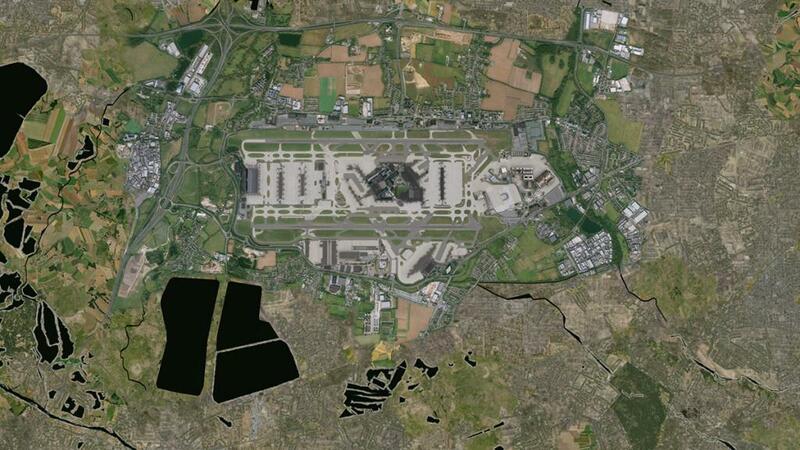 In fact Heathrow is three airports grouped around two runways. BA maintenance (or as the British say "Engineering") dominates the eastern area and Cargo is in the south. 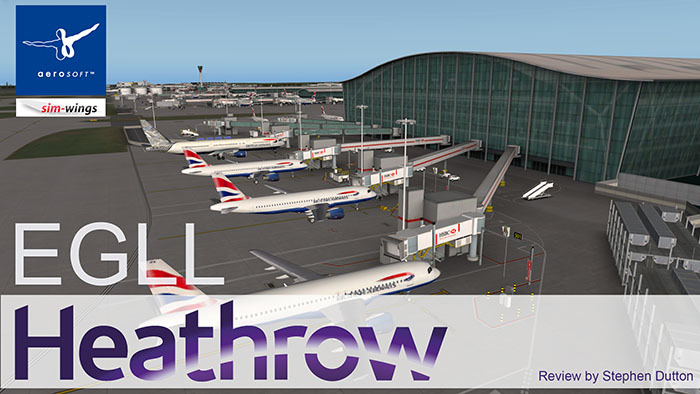 Heathrow Airport started in 1929 as a small airfield (Great West Aerodrome) on land south-east of the hamlet of Heathrow from which the airport takes its name. Heathrow area as a very big airfield started in 1944: it was stated to be used for long-distance military aircraft bound for the Far East. But by the time the airfield was nearing completion, World War II had ended. Croydon in South London was London's original aerodrome site, but when civil operations closed for WW2 and the airport was used as an RAF fighter base, Croydon was deemed to small for expansion after the war and so the title "London Airport" was moved to the new west London location in 1946 and then renamed Heathrow Airport in 1966. 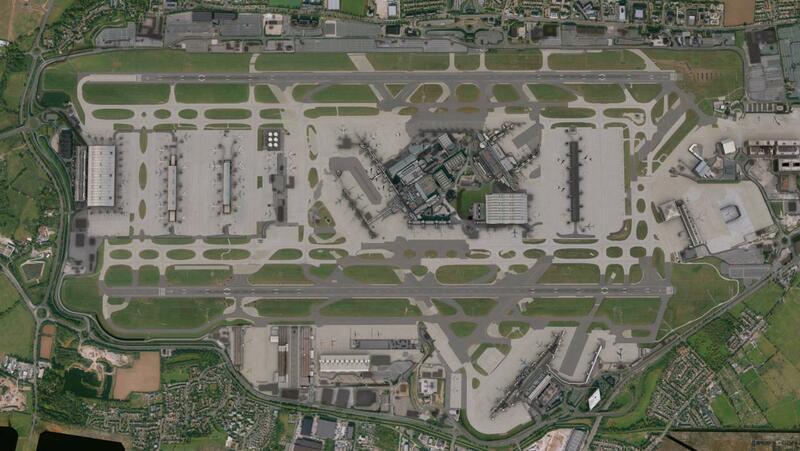 In the 1950s, Heathrow had six runways, arranged in three pairs at different angles in the shape of a hexagram (✡) with the permanent passenger terminal in the middle and the older terminal along the north edge of the field; two of its runways would always be within 30° of the wind direction. 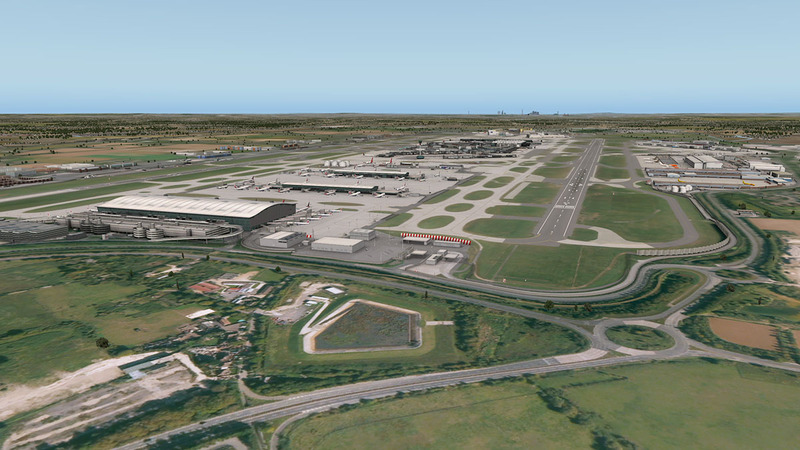 As the required length for runways has grown, Heathrow now has only two parallel runways running east–west. These are extended versions of the two east–west runways from the original hexagram. 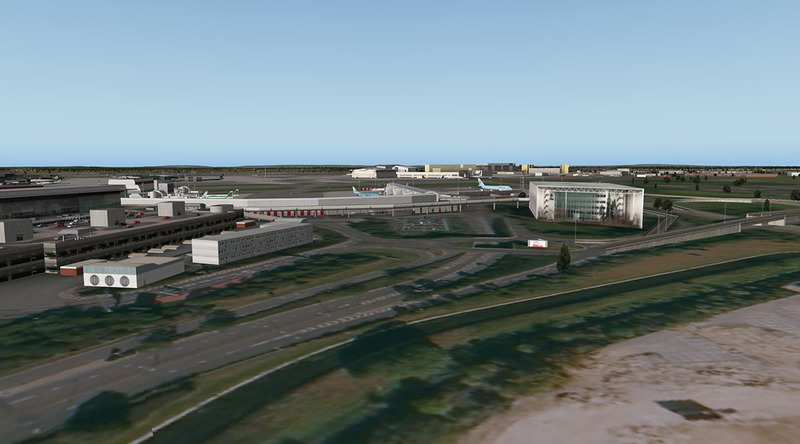 From the air, almost all of the original runways can still be seen, but incorporated into the present system of taxiways. 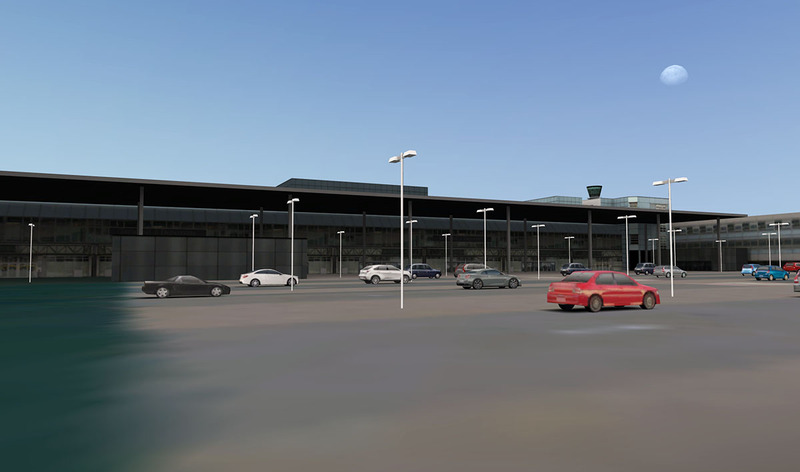 North of the northern runway and the former taxiway and aprons is now the site of extensive car rental outlets and car parks. 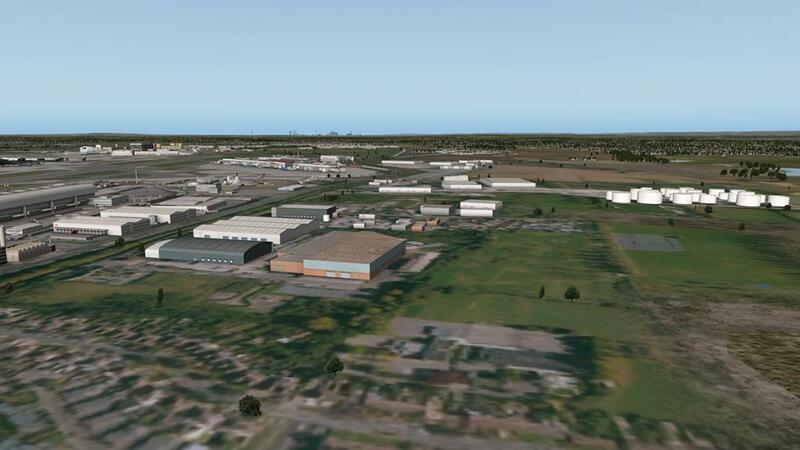 Aerosoft have created an extensive scenery over a wide area. Like most sceneries they can be confusing from a distance, but as we go through the various areas it is quite easy to see where and what is included into this scenery. 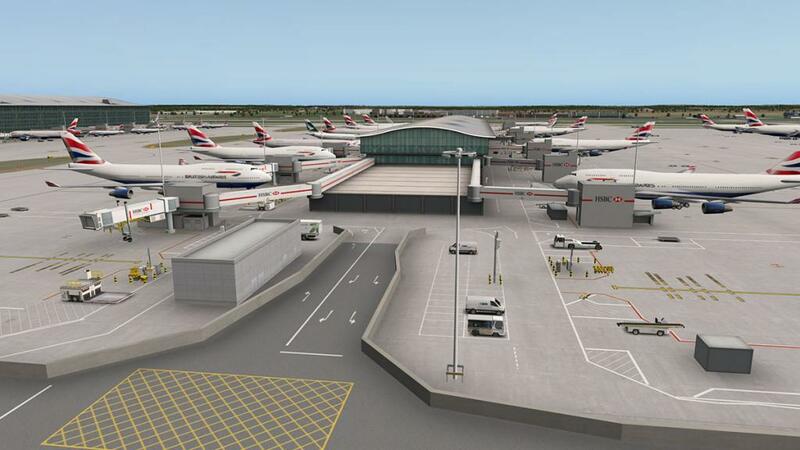 Only portions of the original "mega" Flight Simulator scenery was actually used for the X-Plane release because there has been so many changes to EGLL - Heathrow since the original FS scenery was created for FS2004 with its release in Sept 2007. The current FS version is the "Extended" version of this scenery. 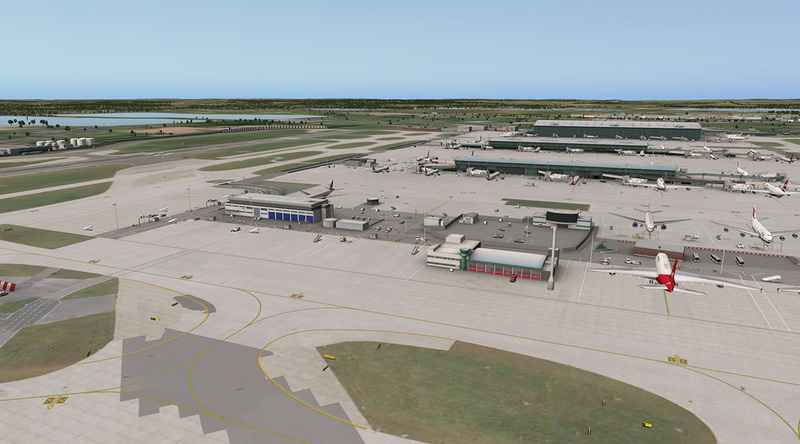 If you were nosey enough to look closely at the X-Plane free inserted Aerosoft airports, then EGLL - Heathrow was quite limited and was quite an old layout with just really the central area in any actual form (not even T5?). So this extensive scenery here is totally different in context and even form. Listing of the Terminals and areas are noted by their location and not by their position in history. Terminal history is noted in the terminal area details. 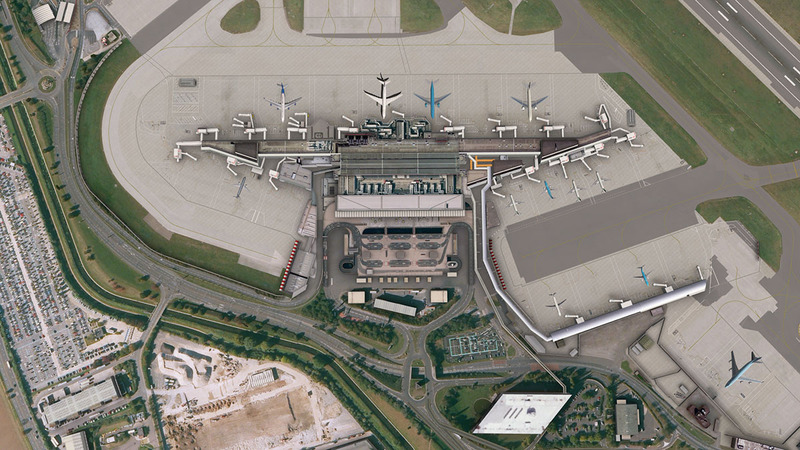 Terminal 5 is a complex of one receiving terminal (A) and two island terminals (B and C). 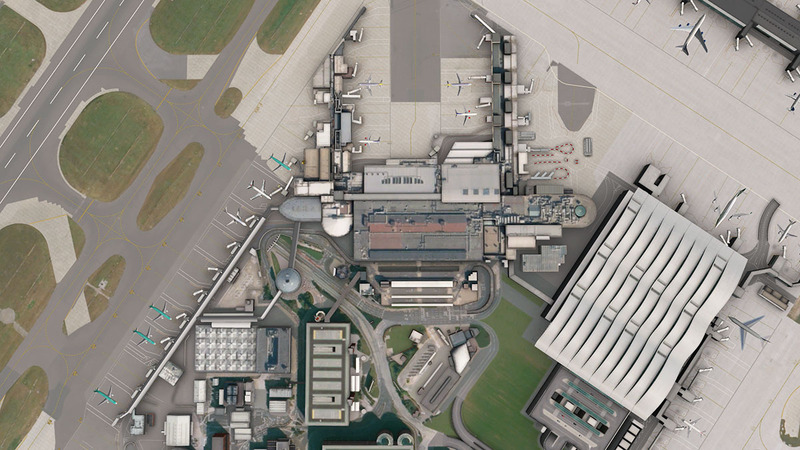 Leading architects the Richard Rogers Partnership designed the monolithic T5 Terminal from 1989, but construction didn't begin till September 2002 (with eight years of committees blathering in between). 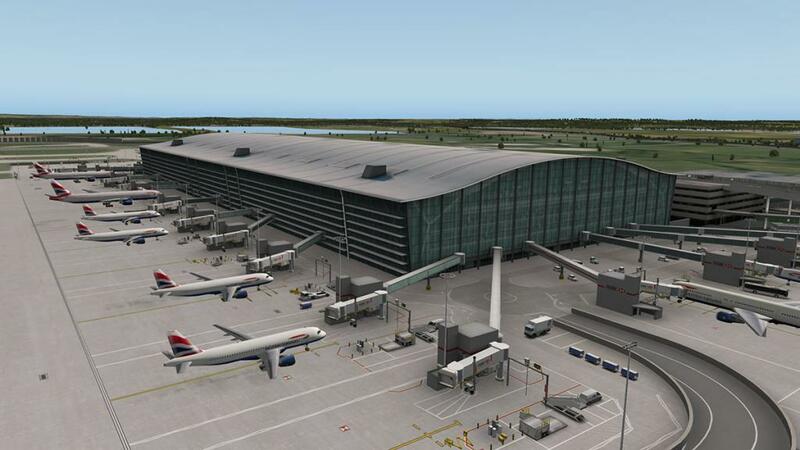 Queen Elizabeth II officially opened Terminal 5 in a ceremony on 14 March 2008. 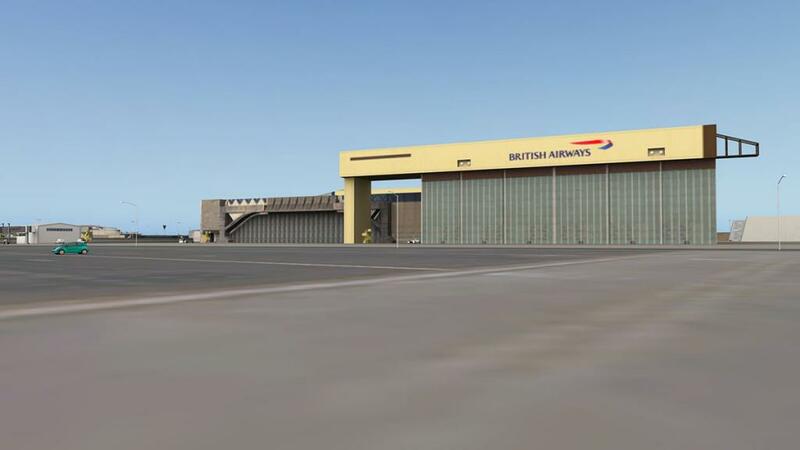 It is used exclusively by British Airways (and now IAG (Iberia)), the terminal opened for passenger use on 28 March 2008.... then abruptly in the following 10 days some 42,000 bags failed to travel with their owners, and over 500 flights were cancelled. 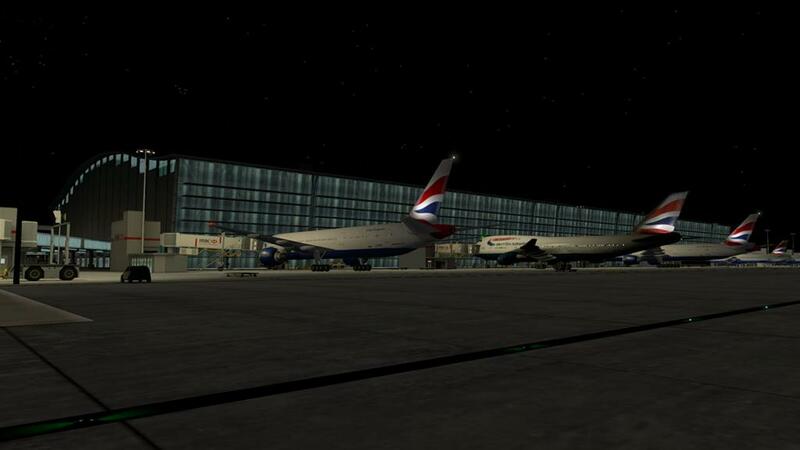 British Airways was not able to operate its full schedule from Terminal 5 until 8 April 2008 and had to postpone the transfer of its long-haul flights from Terminal 4 to Terminal 5. The difficulties were later blamed on a number of problems with the terminal's IT systems, coupled with car parking problems. When finished I was not sure if this huge hen house deserved the accolades and awards that was thrown at the architects and engineers. I mean it is just really a big huge box like structure with a swoopy roof. 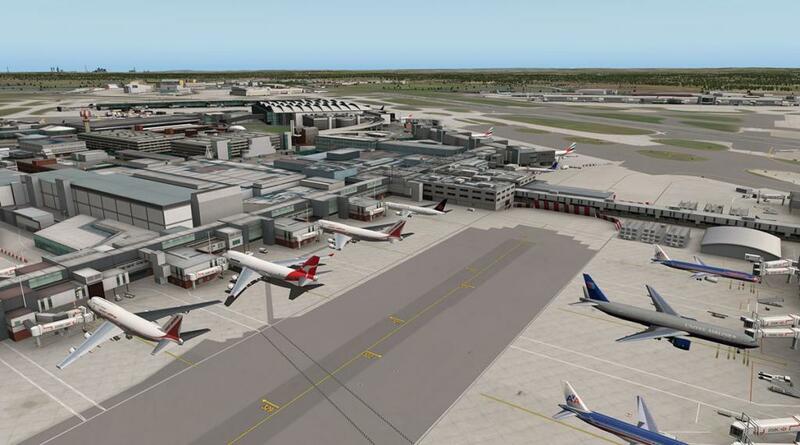 Middle Eastern and Asian airport design was getting more stylistic and futuristic and all the British committees could come up with is four walls and a roof? The idea was how it looked from the inside and not out. It was to be big and airy and try to convince people that England didn't have the worse inclement weather on the planet. But to a point today the T5 Building has come to represent the iconic face of a modern Heathrow Airport, and with the other islands sections of Terminals 5B and 5C now completed there seems to be a more cohesion to the madness, but a pretty building or design I still don't think T5A is? Imposing however is a different perspective, as it is to be functional and not a statement of architectural prowness. 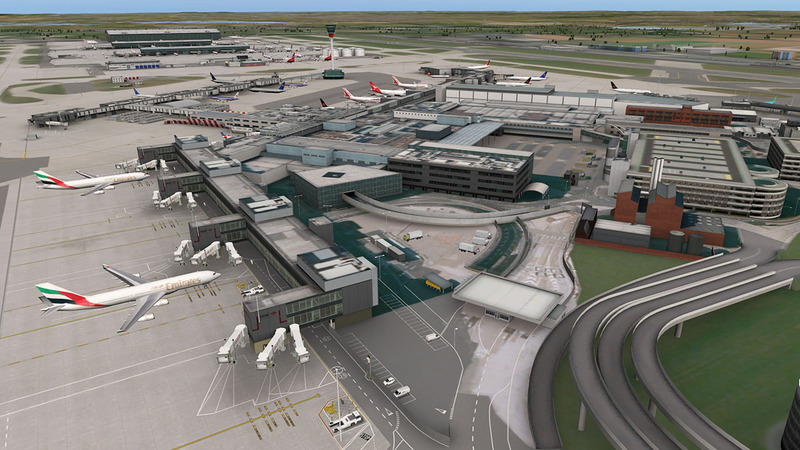 At 396 metres (1,299 ft) long, 176 metres (577 ft) wide and 40 metres (130 ft) tall, It is the largest building in the Terminal 5 complex and is the largest free-standing building in the United Kingdom. 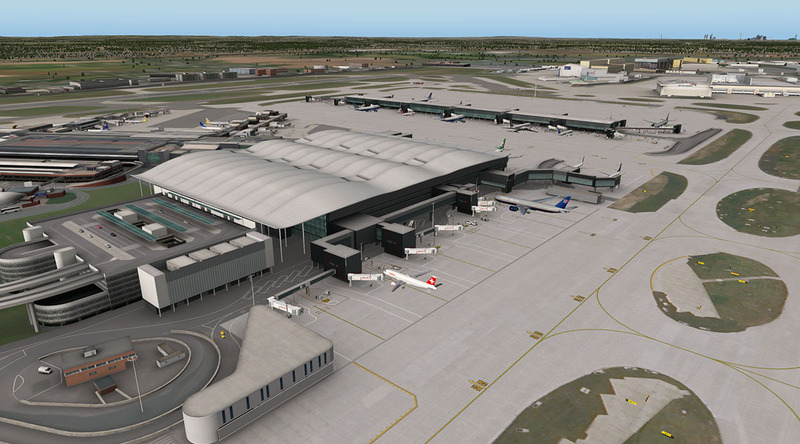 There is no doubt that the Aerosoft version of T5 is simply outstandingly good. As we will find throughout this review, the one feature that is a really exceptional in this scenery are the glass textures (Day and Night). Not just in being glass but the way the depth is created and the internal structures are represented in the textures. 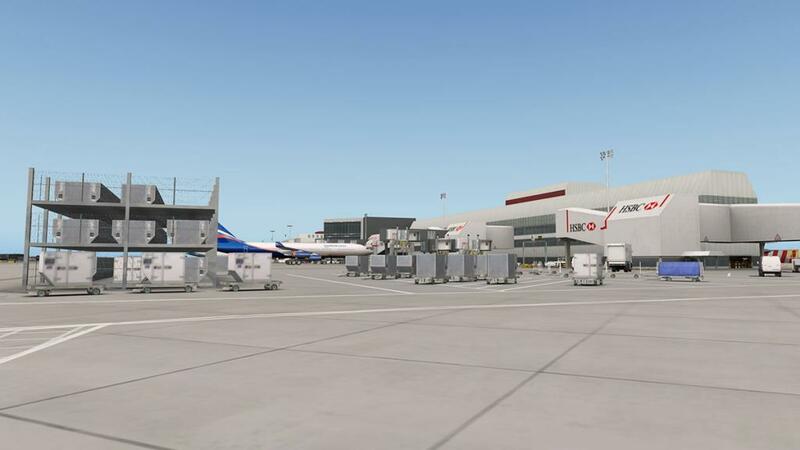 This is what you pay for in payware scenery, great detail and realistic textures... and you really get your money's worth here as it is stunning. Gates A1–A23 internal and 501-523 external with 524-527 as remote stands. All stand fixures are absolutely perfect, about as real as you could possibly get. taxiiway and ramp signage is perfect, but you have to watch that some gates through out the T5 complexes have double usage, and that the same gate can be used for a single-aisle aircraft with one airbridge or as an twin-aisle aircraft with two or three airbridges, and usually noted by their L/Left or R/Right listing (548L). However the arrival side is well done but the ramps and smaller detailing are quite sparse, signage is good, but very little vehicle or passenger traffic. 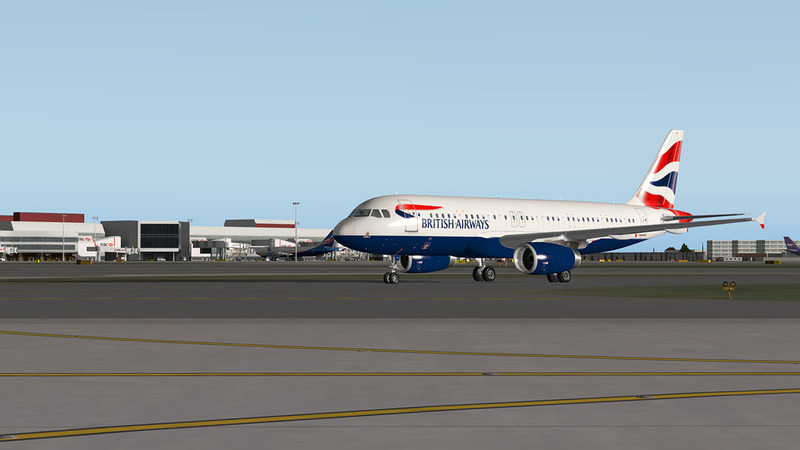 T5A is mostly used by single-aisle BA aircraft for local and European routes. 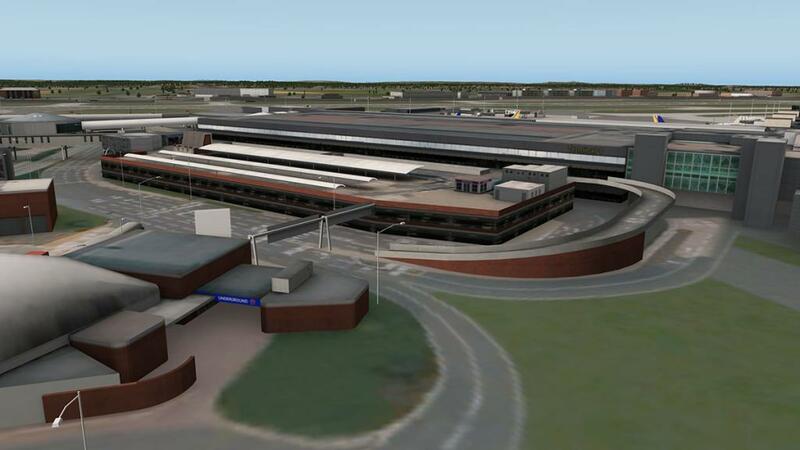 Terminal's 5B and 5C are satellite island terminals connected to T5A via an underground people-mover (not to be confused with the fast people-mover pods in the carparks) and long tunnels. The 5B design is similar to the T5A shape but a lot longer and smaller. Gates are noted internally as Gates B32–B47 internal and 531-548 (R/L) external. 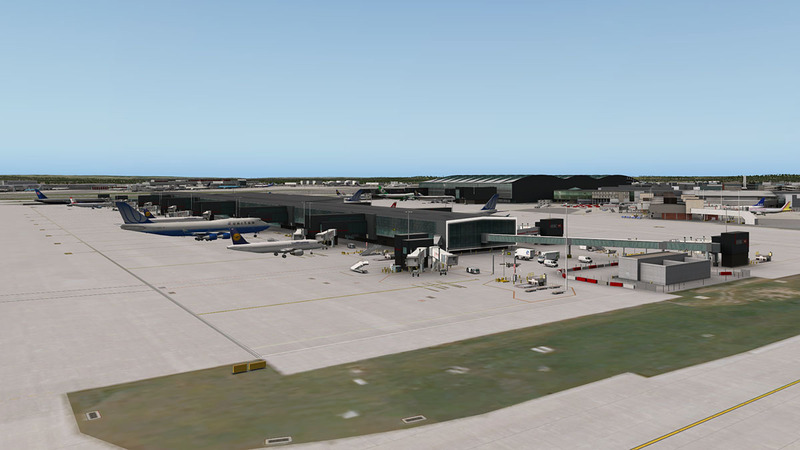 T5B is an international terminal with mostly twin-aisle aircraft. 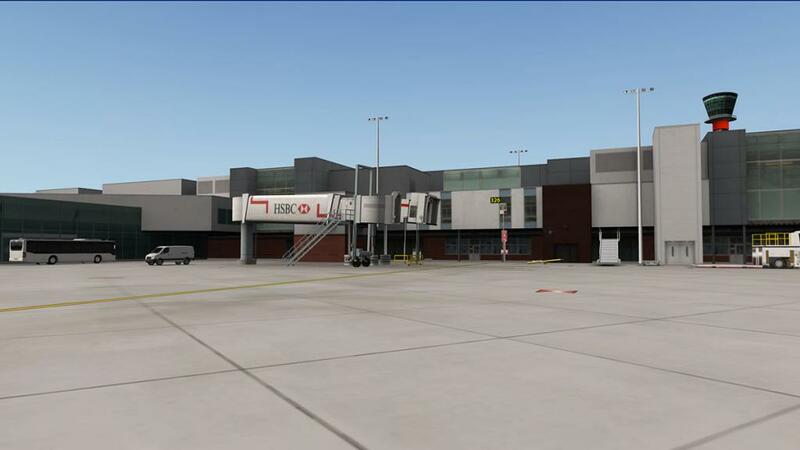 Externally in design T5B is very much the same as T5A with full fixtures and well prepared gates. 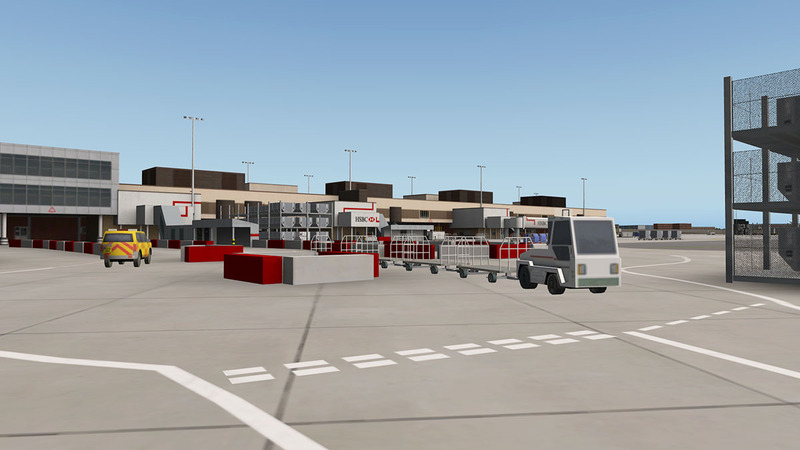 the Terminal itself is faultless with excellent vehicle animations running all around the inbound areas. 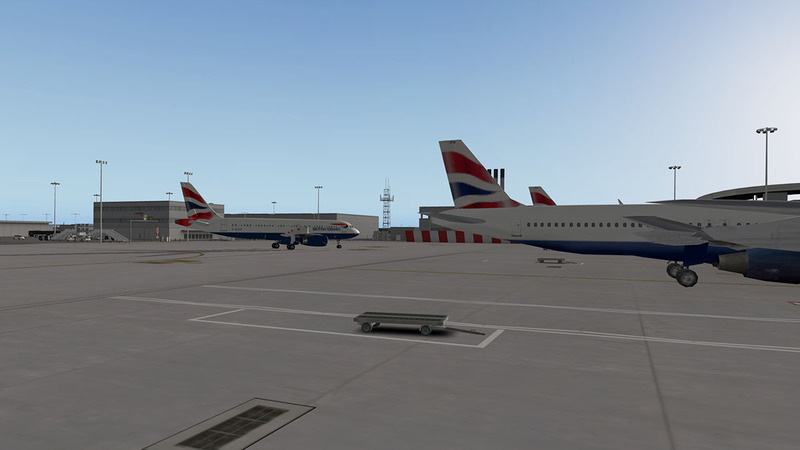 T5C is set up almost identically as T5B, but it is the BA Airbus A380 terminal as well as the standard international routes. Gates C52–C66 Internally with 558-561 external. 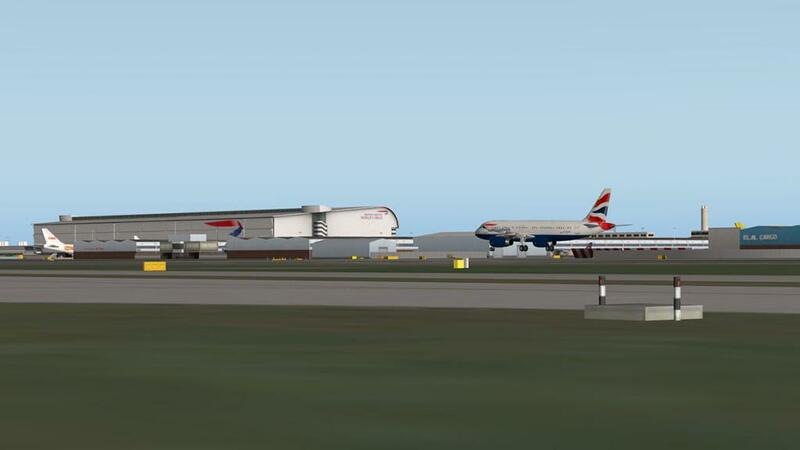 External 591 to 595 and 558 to 596 are all A380 stands. 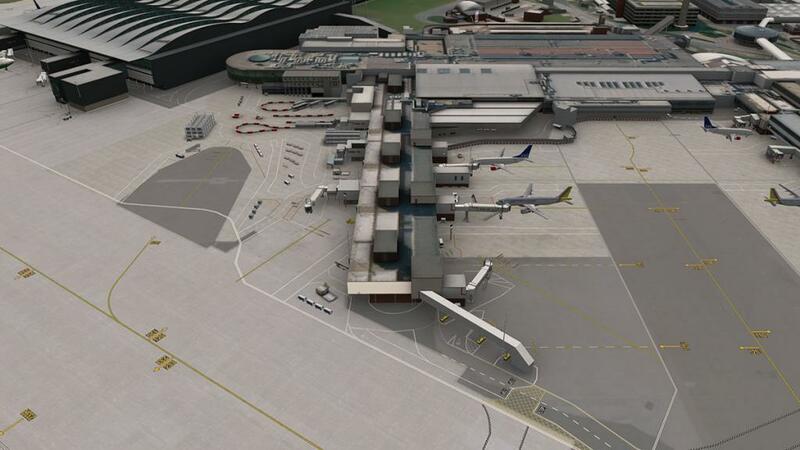 And the terminal like T5B comes with full fixtures and well prepared gates. 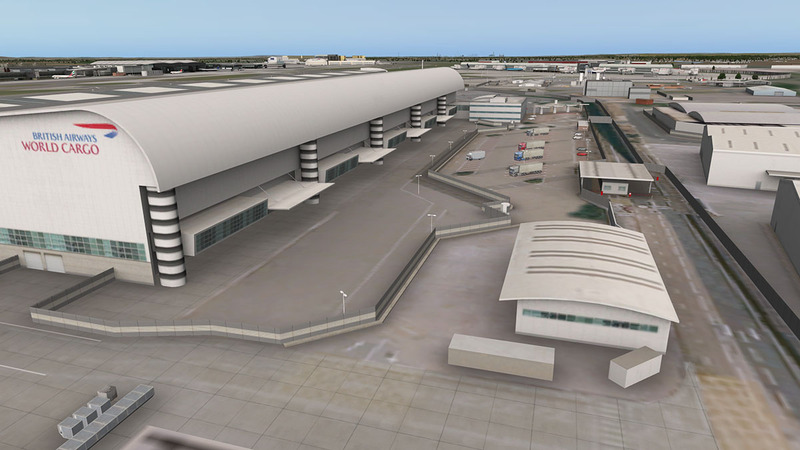 To dock your A380 at this terminal you would need to remove a few A380's from the extra static aircraft feature. 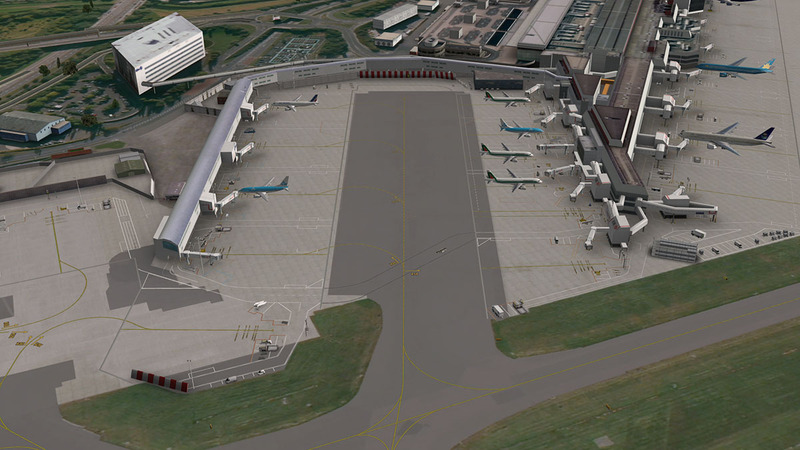 Part of the Terminal 5 complex is a central remote parking area. 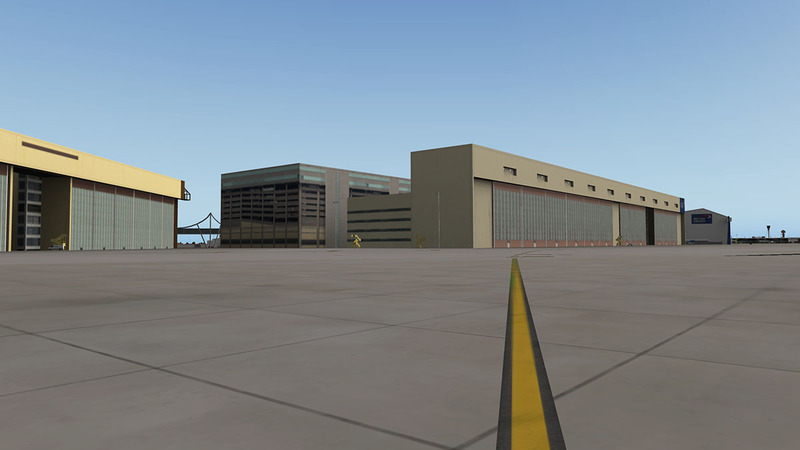 Remote stands 572 to 596 (13) are great for preparing or parking aircraft. 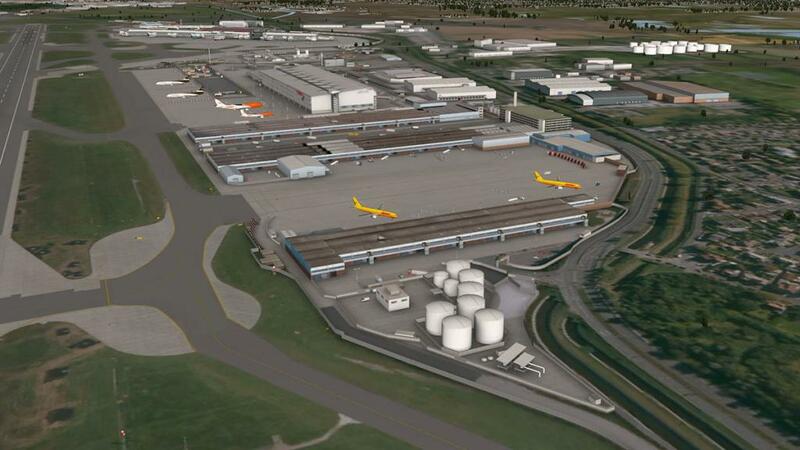 A fuel storage area is on the north section, and a fire station mid-section. 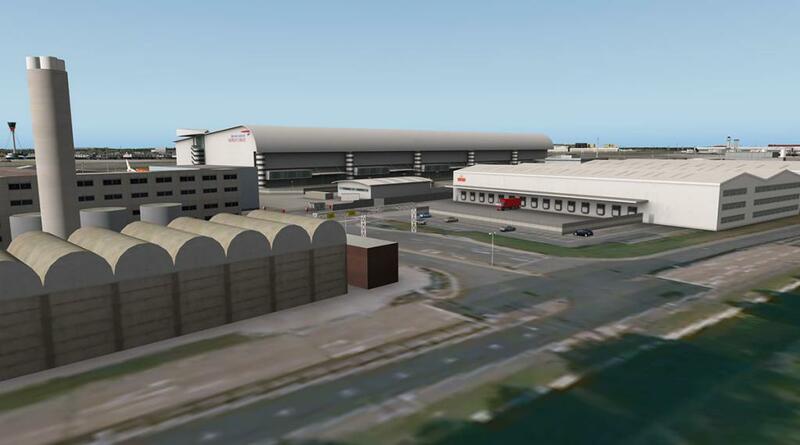 There is a significant admin BA building in the southern section and it is surrounded by well filled ramp and vehicle equipment storage yards. 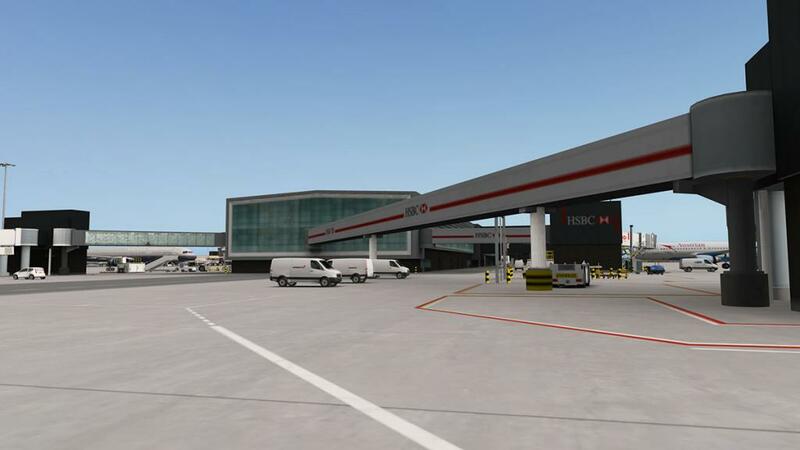 Great detailing is supplied here, and very realistic viewpoints if arriving and parking (passing through Heathrow for fuel) or aircraft flight preparation. Terminal One looks like the oldest terminal at Heathrow, it is not as that now is Terminal 3 and the older now demolished Terminal Two/Queens Building. 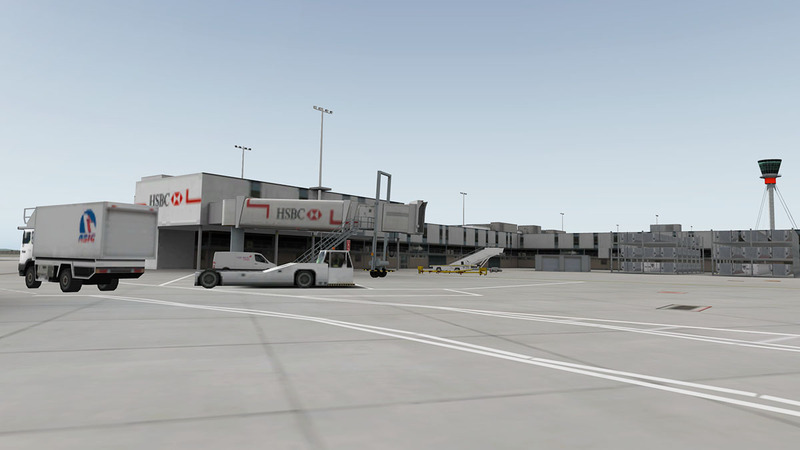 Terminal 1 was opened in 1968 and was formally opened by Queen Elizabeth II in May 1969. 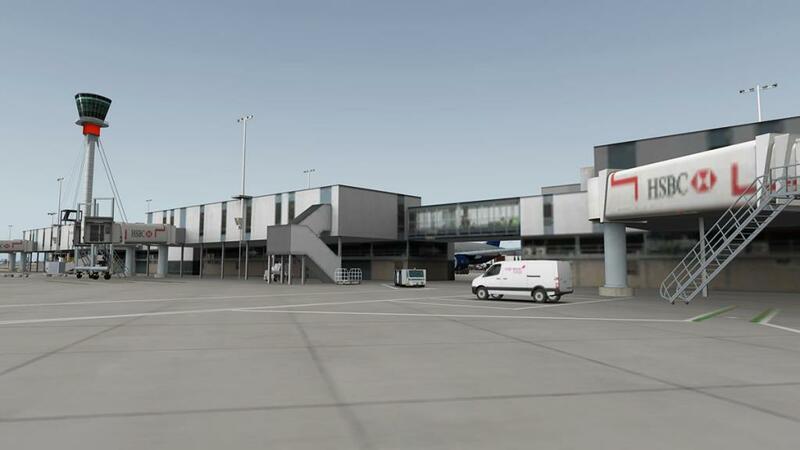 At the time Terminal One was the biggest short-haul terminal of its kind in Western Europe, and this was the area the BEA Tridents and Viscounts flew their European routes from. 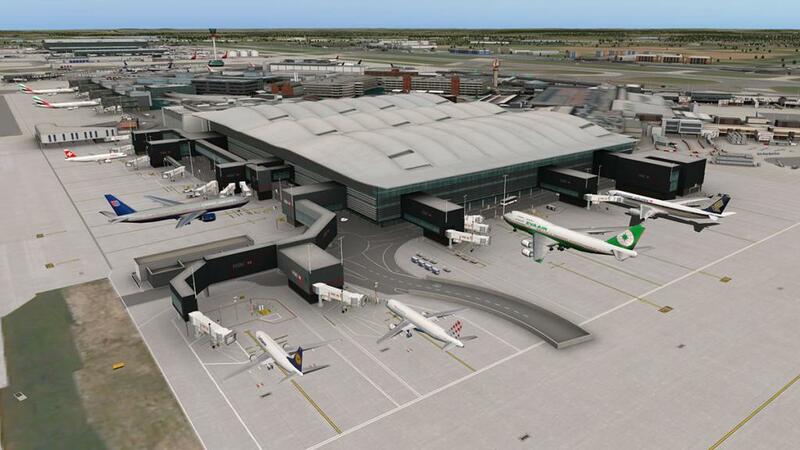 Terminal One is the earlier Heathrow of my youth but it won't be there much longer as it will be closed on the June 30 2015 for the extension of the Terminal Two complex. But for now in this scenery it still lives on. 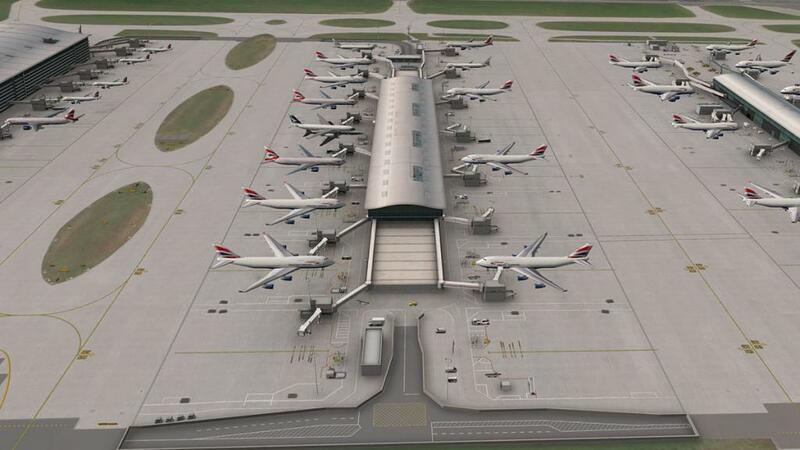 A lot of Heathrow was like an added on jigsaw in the central area, The airport would call on some contractor and say "I do want another 8 gates going that way my good man" and the contractor would come in and say "No problems there guv'ner" and was simply added it all on in a none-orthodox fashion. 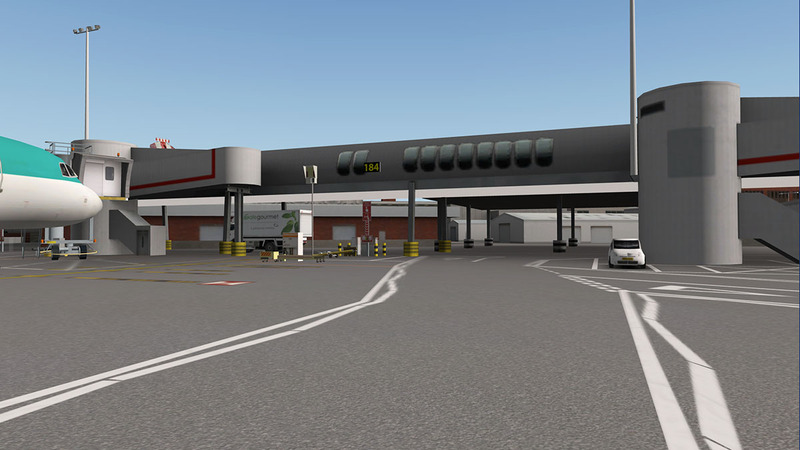 Land at Heathrow and you went through long tunnels to places connected to other places until you came out the other end at a terminal building and sometimes not at the terminal building you actually gated at? 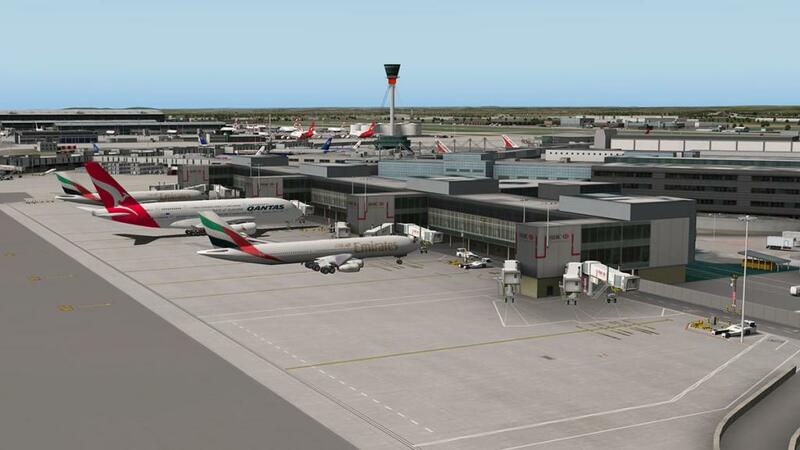 Lovely place is Heathrow. The Central part of Terminal One has two piers in Pier 3 and Pier 4 which look now very old but very authentic Heathrow, situated off the north end of the terminal is a newer extension called the "Eastern Extension" or Pier 4A which was opened in 2005. 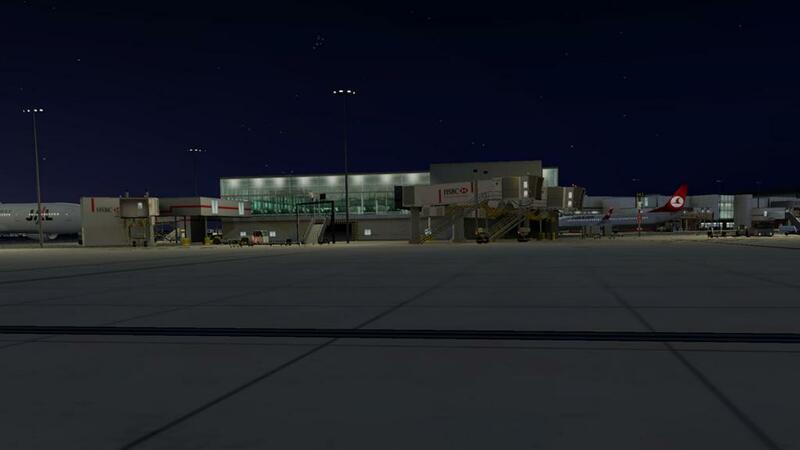 You have a real mish-mash of styles in Terminal One in old, newer and modern, but all very reminiscent of an age now gone by. 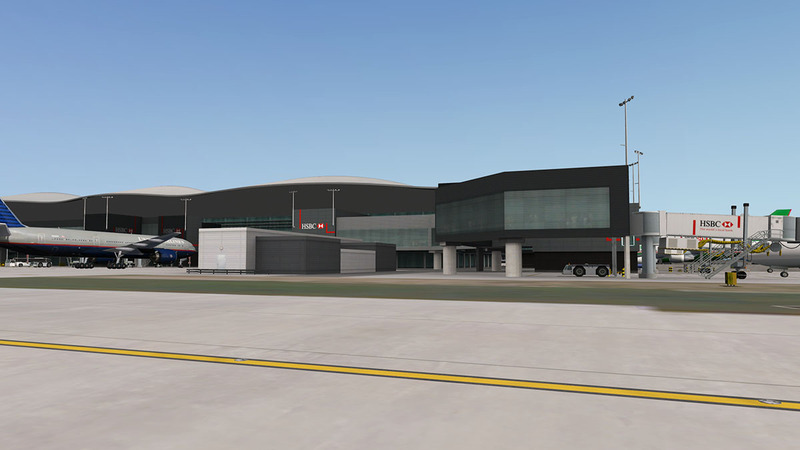 Detail work by Aerosoft is first rate as it really captures all the different building eras, for character then Terminal One stands out. 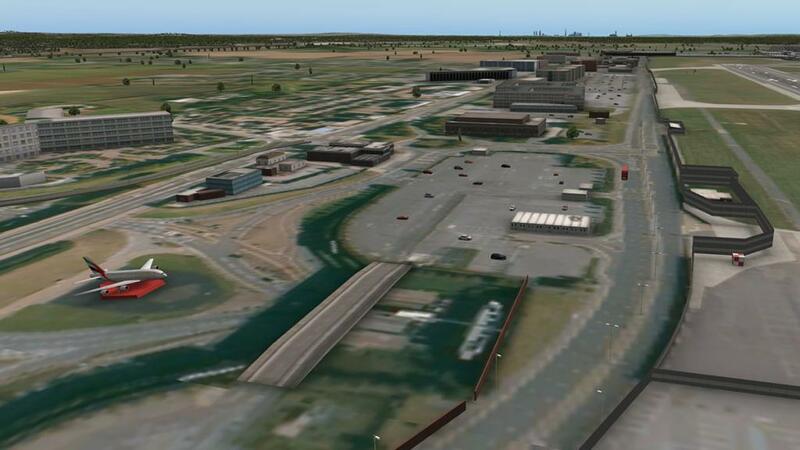 Great animations flow around the different sections in one complete flow of passing vehicles. 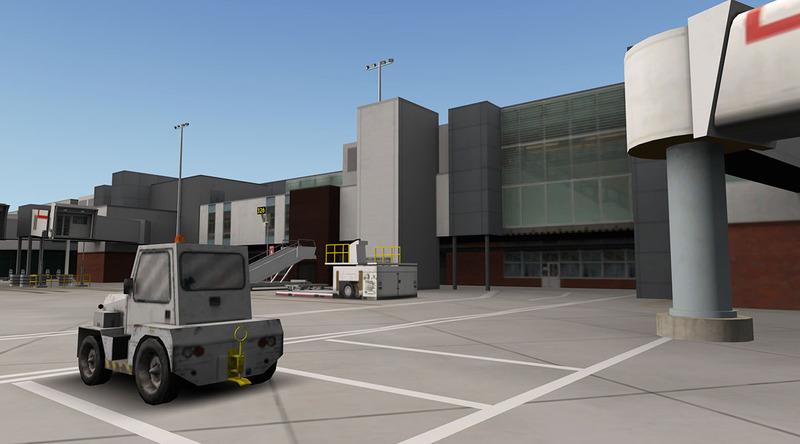 Arrival side of Terminal One is perfect, and just as I remember it, but the area is however quite blank of cars and people and no animations are activated in the central area so it looks totally boring including the central bus station (it does have a couple of buses). 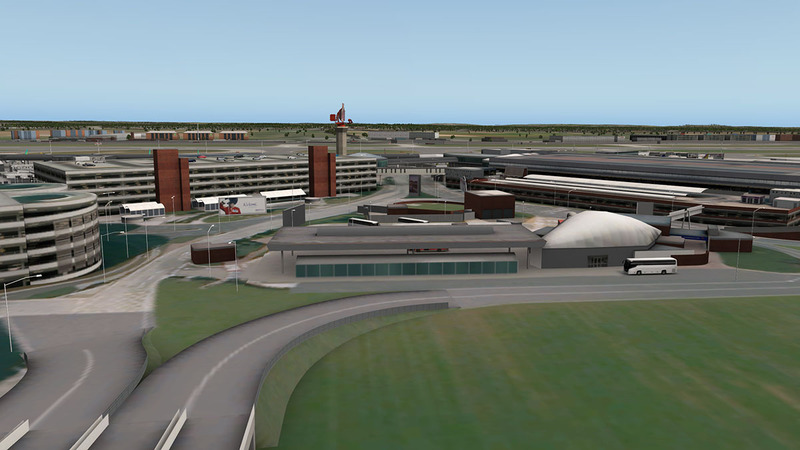 The main central iconic control tower is now gone (along with the central canteen), but everything else is still here and the maze of buildings and central carparks are very well recreated. The main ground radar is there as well, but it does not revolve? A real waste of an opportunity to give a great animation to the scenery... it is notably noticed from any view of the airport in its stationary position? The original Terminal 2 opened in 1955 as the Europa Building and was the airport's oldest terminal along with the Queens Building which was the airport administration building. 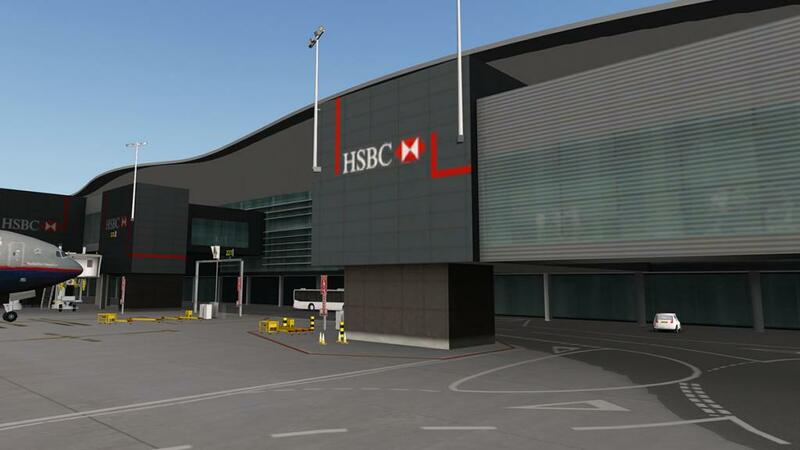 Terminal Two the building became increasingly decrepit and unserviceable and so a grand plan was created to build a brand new terminal to replace it (and the Queens Building) designed by Luis Vidal + Architects (LVA) and Terminal 2 opened on 4 June 2014. 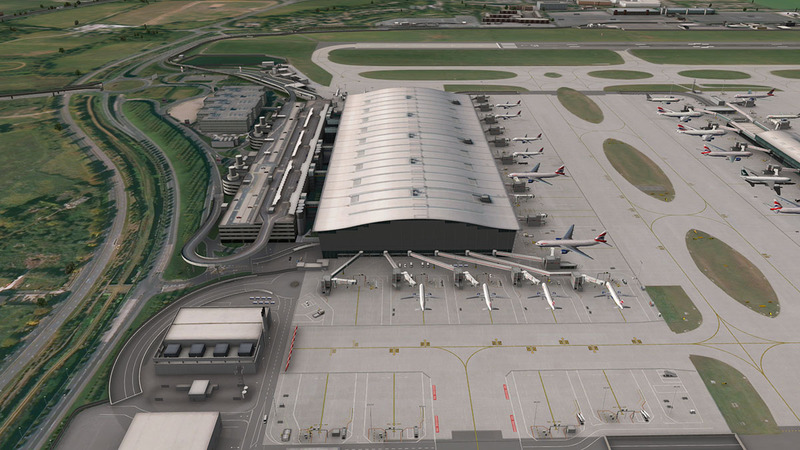 The new terminal does change the whole feel of Heathrow from the past to the future. 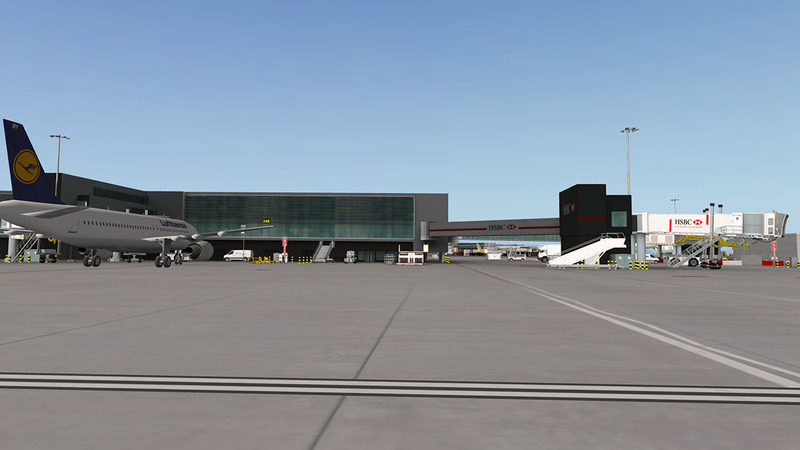 Called the "Queens Terminal" it has a satellite island terminal attached like the T5 and T5B/T5C complex called T2B. 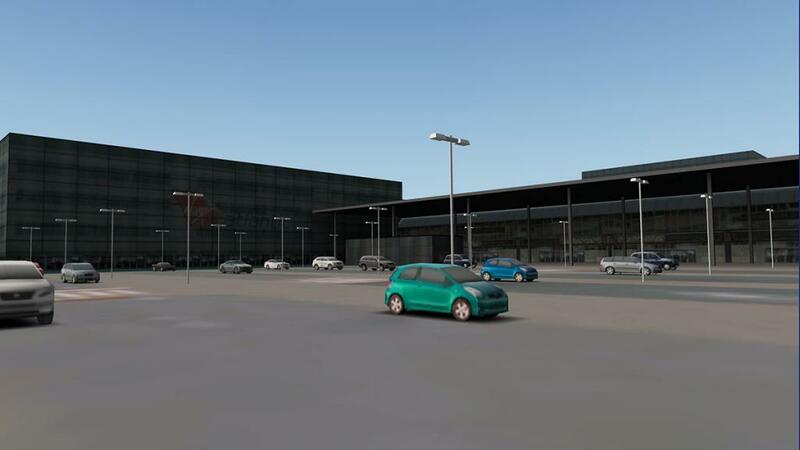 T2 certainly compliments the T5 philosophy but moves it forward in design, it is a dark building but quite attractive in its own way and very distinctively modern in that British modern design. Again the outer building and glass textures are simply extraordinarily good. look at the glass panels and see the people set out behind the dark green tint of the windows, the dark panel facades are gorgeous and so is the waves of the distinctive roof, it is modelling at its best. 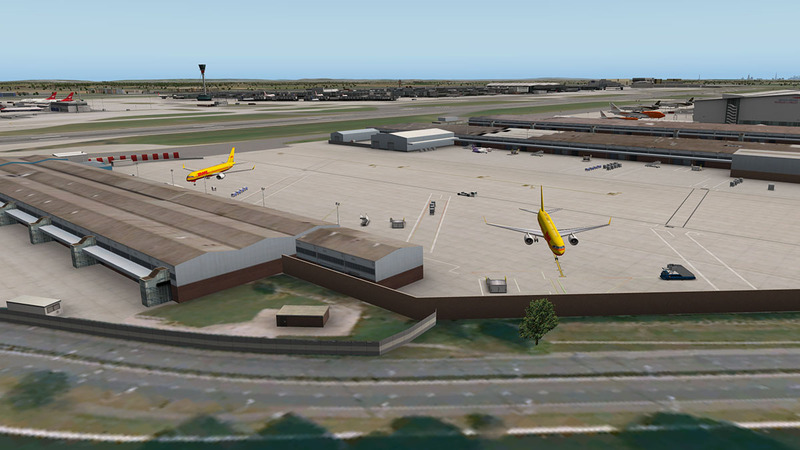 Terminal 2(A) Gates are 3-26 internal and stands 216-226 external... stands 218 and 221 are L/R parking. 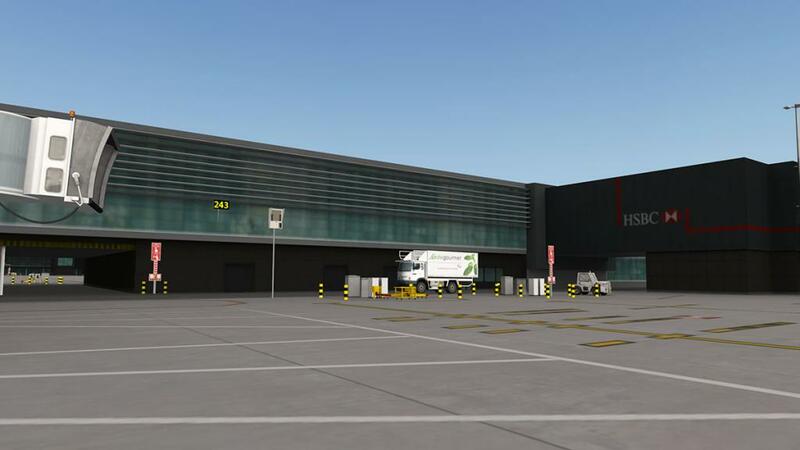 Terminal 2 is Star Alliance operators with code shares Germanwings, Icelandair and Aer Lingus. 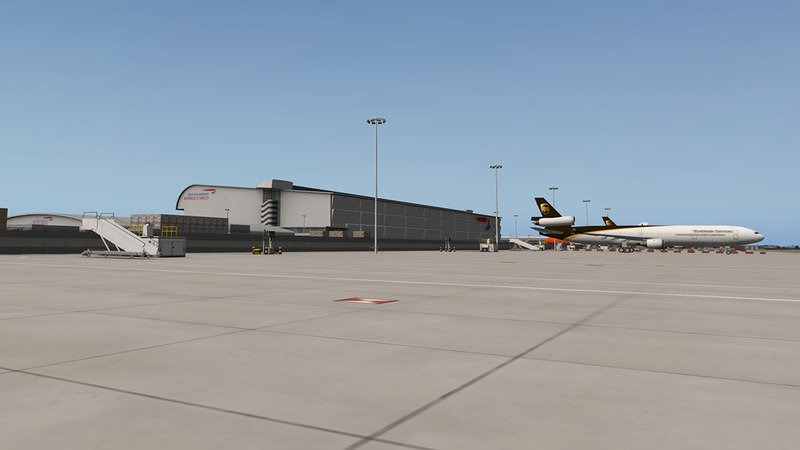 Singapore Airlines and Thai Airlines use the A380 at gates 218/221. 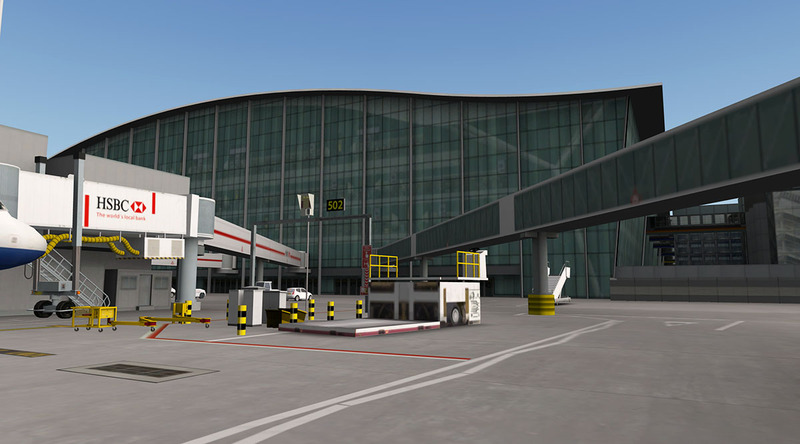 Gate 216 is a non-airbridge stand. 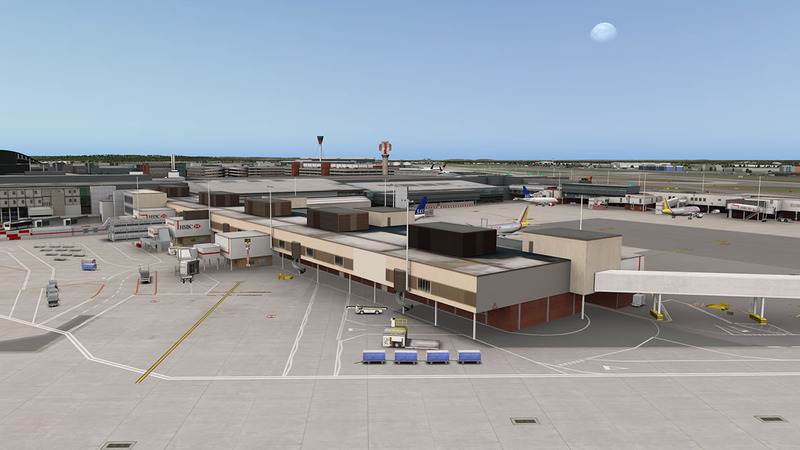 At this point access to Terminal 2B via a temporary "bridge" from Terminal 1 (and will continue to do so) until the T2(A) extension is completed, but the "bridge" is not shown in the Aerosoft scenery. Again the facade theme is like T2A, and it is again exemplary to look at. 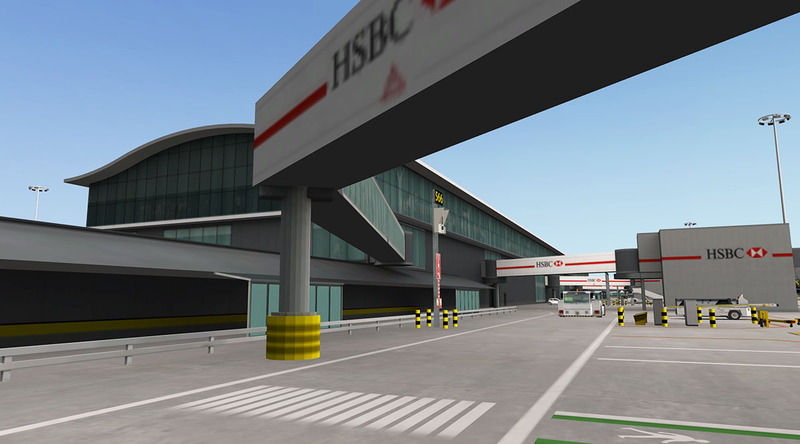 I have my texture resolution settings set on "very high" and the textures are perfect at that setting... some of the HSBC signage is slightly blurry, but otherwise it is all very good. 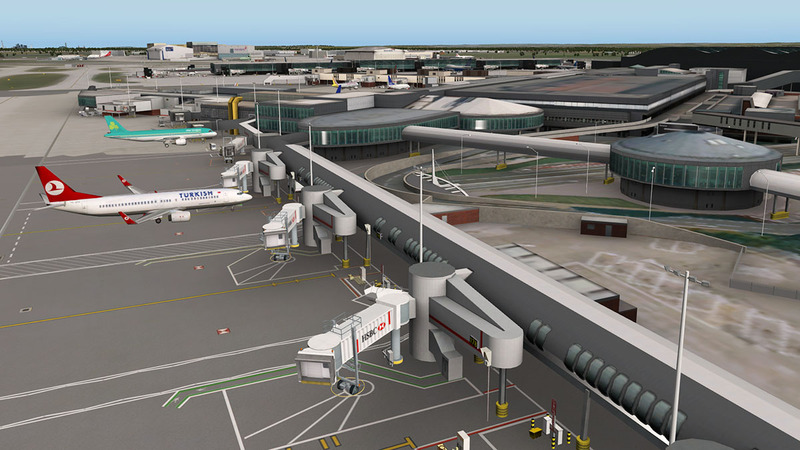 Terminal modelling and airbridge links are perfect. 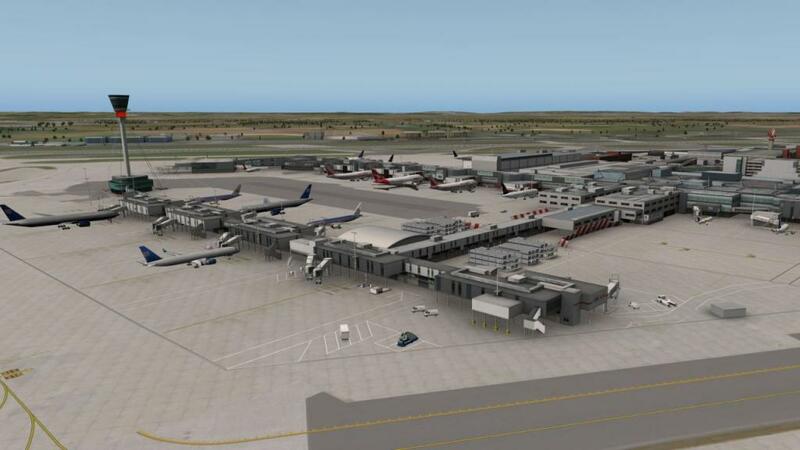 And ground fixures and equipment is also as good as every other terminal area. 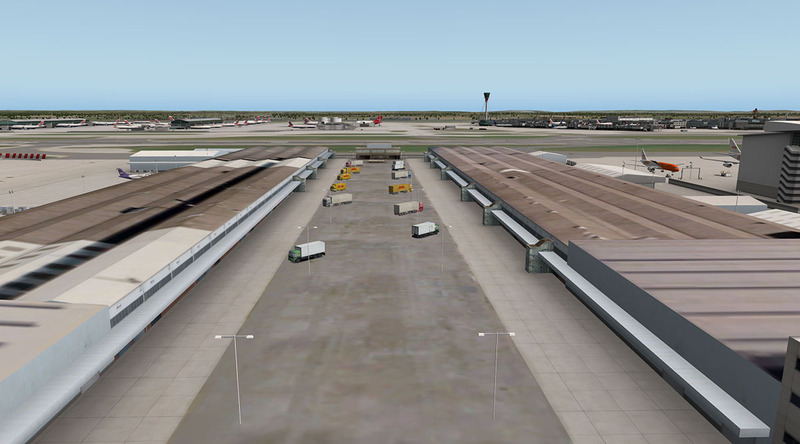 To the east of the Terminal 2B facility is a line of remote stands 251 to 258 with 253, 254 and 258 with L/R Parking. Terminal 3 is certainly an hodge-podge of various piers and areas, but no doubt it is well represented here in all its glorious forms. 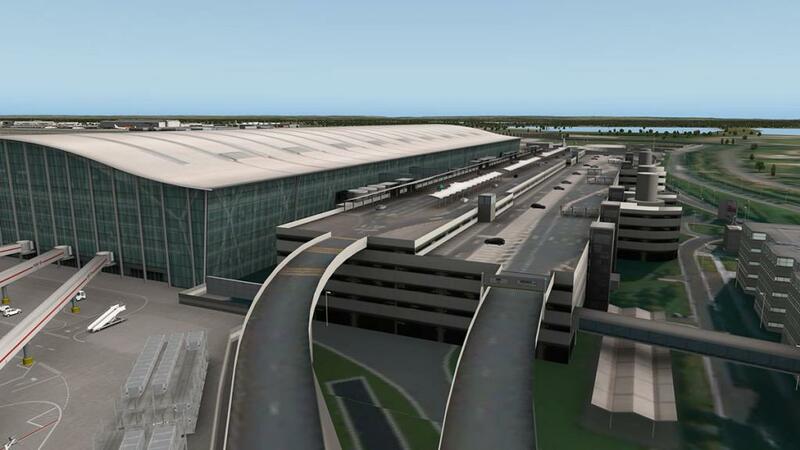 Basically the huge terminal had originally three piers in 5, 6 in a line and 7, until Pier 6 was redeveloped and turned east towards the new T2 complex. 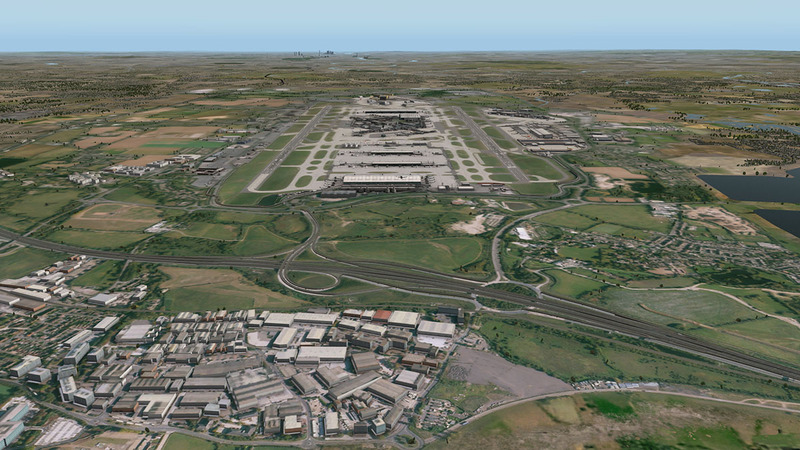 Terminal 3 is even if hidden below all that change is still the heart of Heathrow. 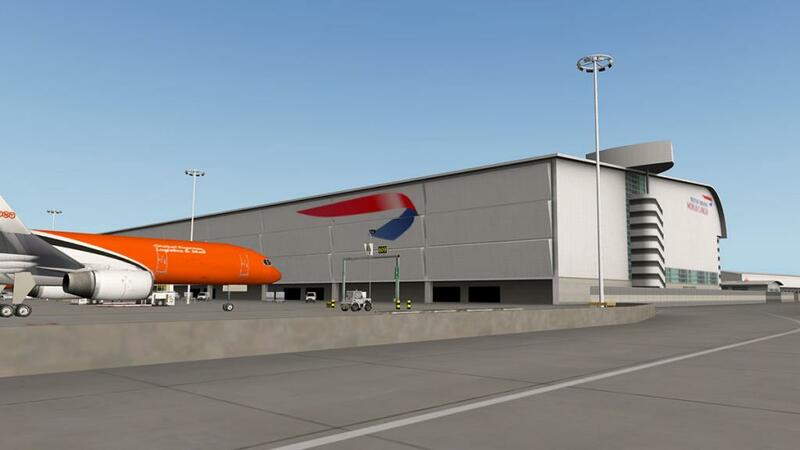 It is today the base for the "Oneworld" carriers including American Airlines, Qantas, Cathay Pacific, Japan Airlines, Virgin Atlantic and many others. In most cases if you arrive at LHR from overseas then there is good chance you will pass through T3... from a simulation point of view then T3 will give you an authentic (meaning old) feeling to arrive at Heathrow from another far off continent. 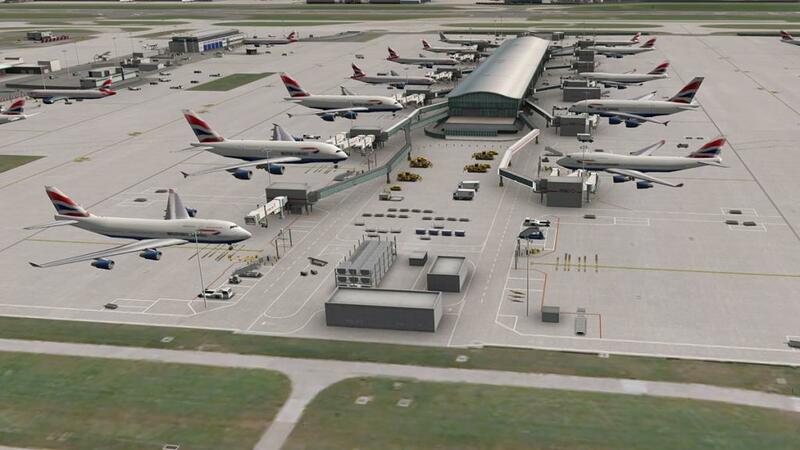 Note that all BA departures for the US will still depart from T3 and not T4 (from Oct 2015). 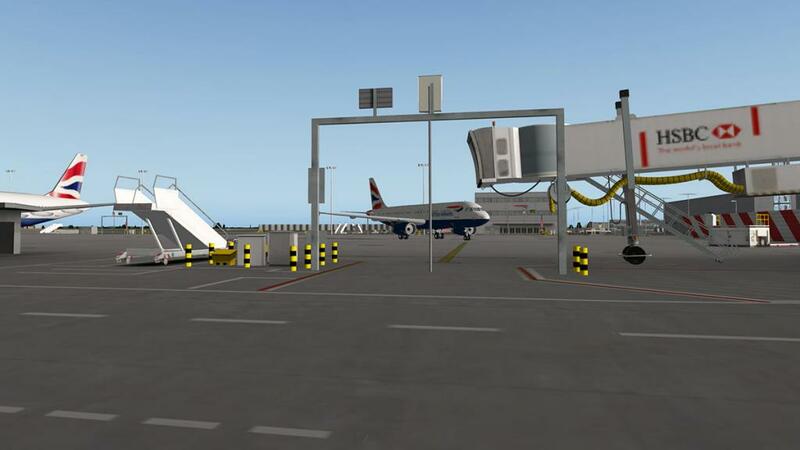 Pier 5 are Gates 23-42 Internal and Stands 323 - 342 External with remote stands 351 - 355. 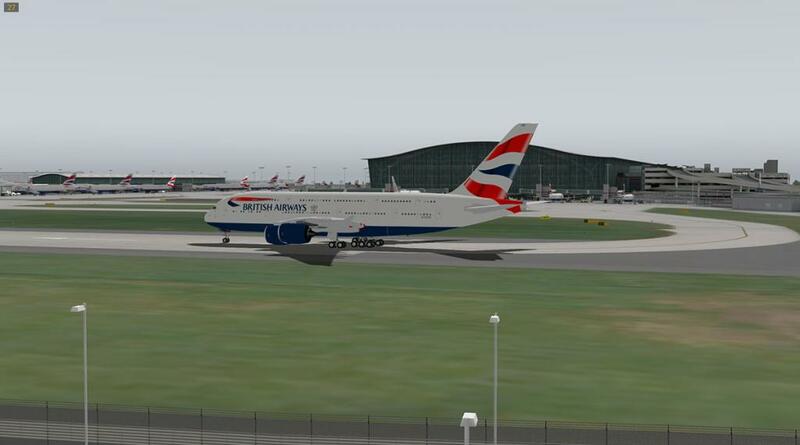 (S342 is A380). 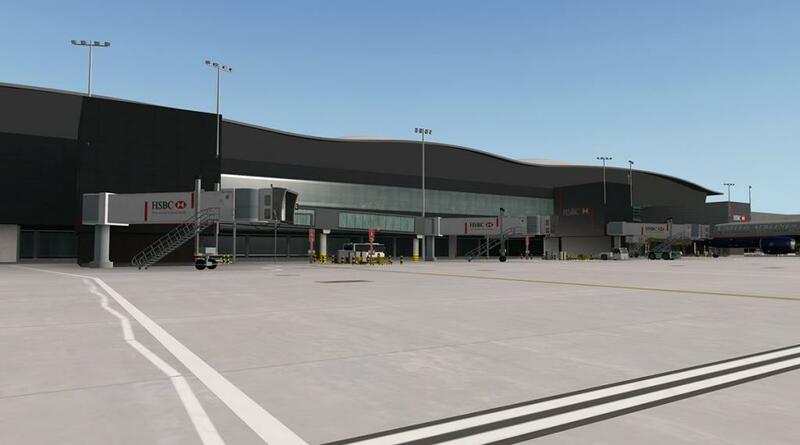 Pier 6 (below) are the new gates 1 -11 Internal and Stands 301 - 311 with 305 and 303 L/R Parking (A380). Pier 6 was completed in 2006 for the introduction of the A380 aircraft, The building has the same sort of style as the newer T5 and T2 complexes in the evolution of creating the darker boxy design, and Aerosoft have been faithful in getting the details perfectly correct. 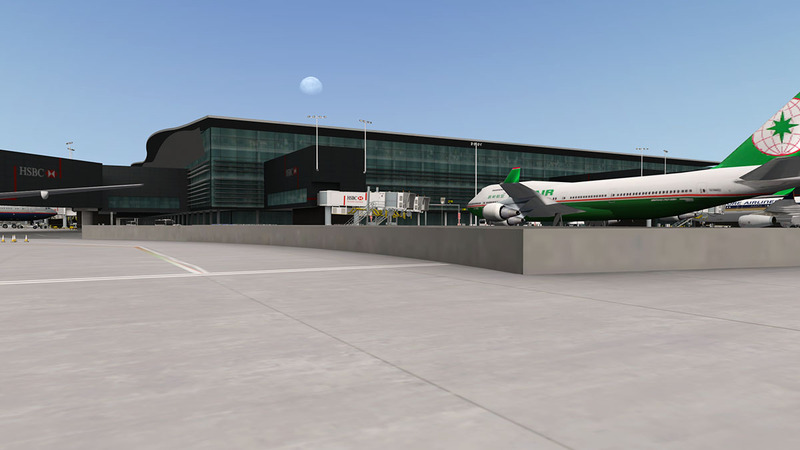 Pier 6 feels new of which it is and again the ramps and stands are gloriously complete, and arrive here from a long-haul and you will get your achievement of an arrival in the UK. 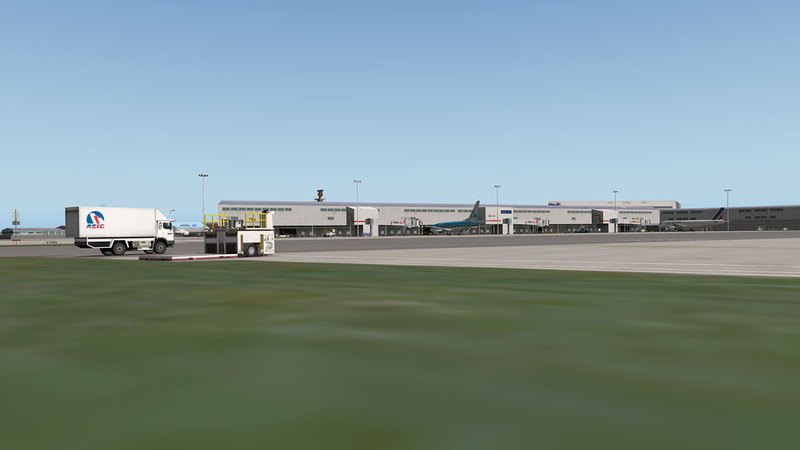 Pier 7 are Gates 13 - 22 Internal and Stands 313, 316 - 322 and 363 - 365. 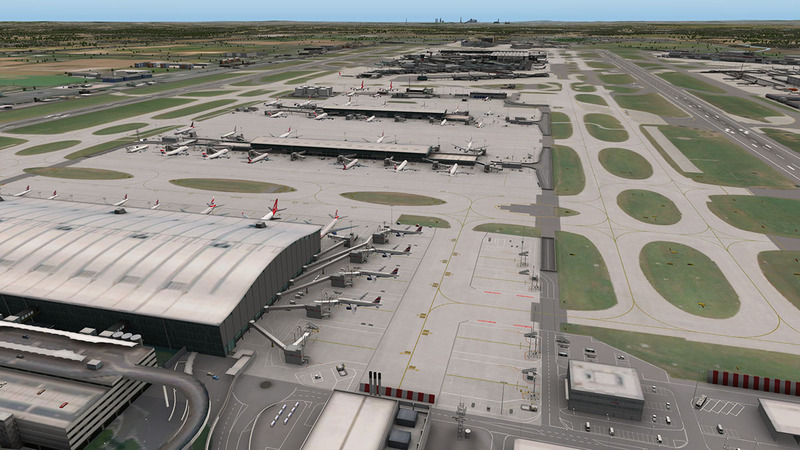 Arrival side of T3 is as it always was the face of Heathrow International. The area does have a few cars in the drop off area, but everyone knows that this area can be controlled chaos on most days. 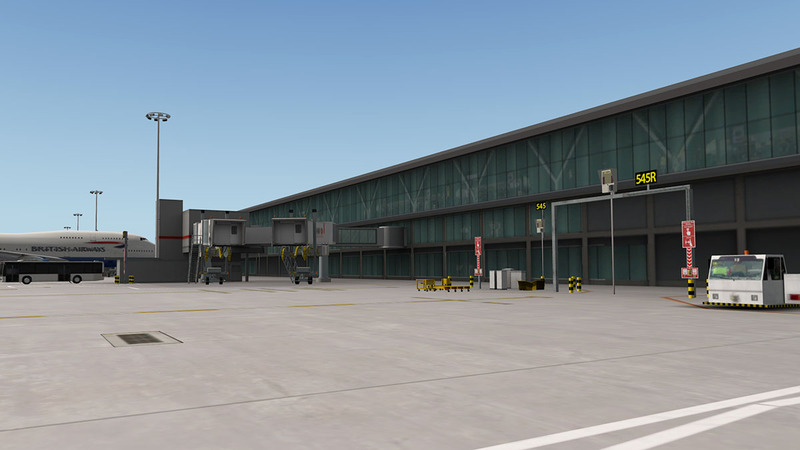 Again Aerosoft has done a superb job in representing this iconic terminal, it is a complex building, but it has been reproduced faithfully here. 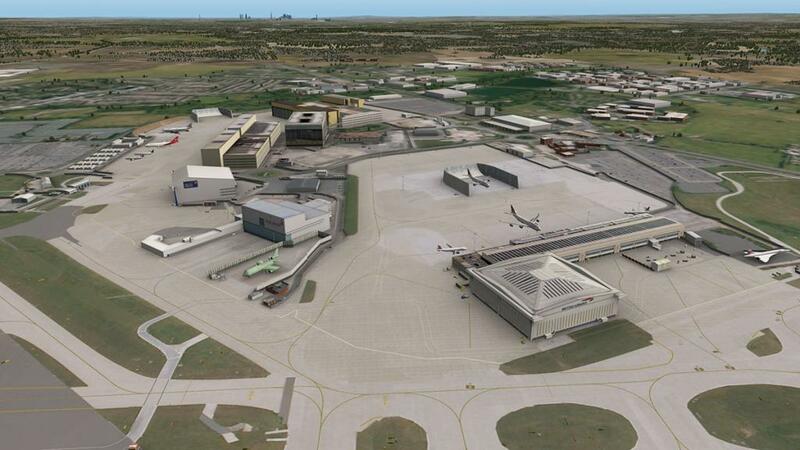 To build the new Terminal 2 complex then the old original control tower building had to go. 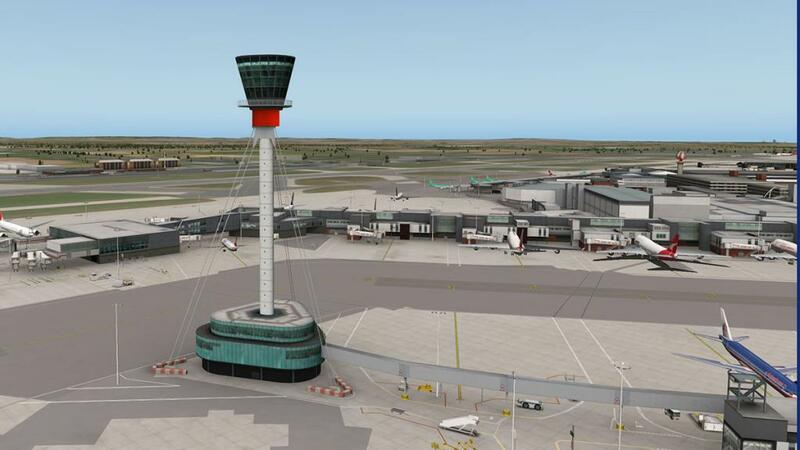 So this new modern Control Tower was built and completed and handled its first flight early on Saturday 21 April 2007. The tower is 87m high – the tallest tower in the UK. It is more than twice the height of the old tower which has served Heathrow for over 50 years. 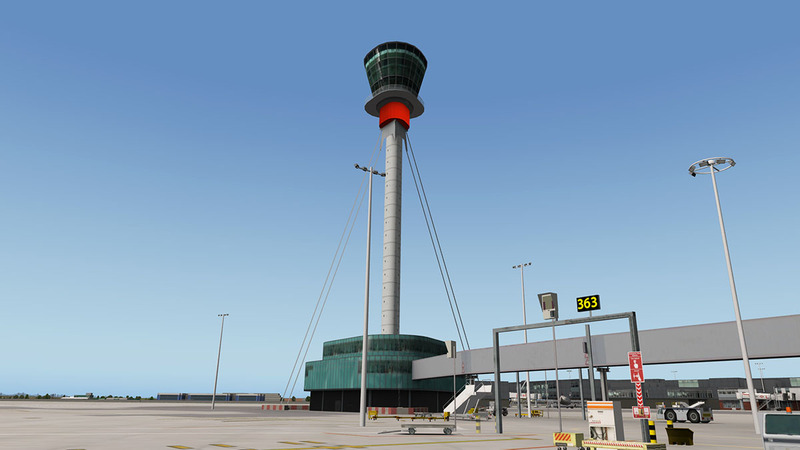 The tower was designed by Rogers Stirk Harbour and Partners and engineered by Arup. 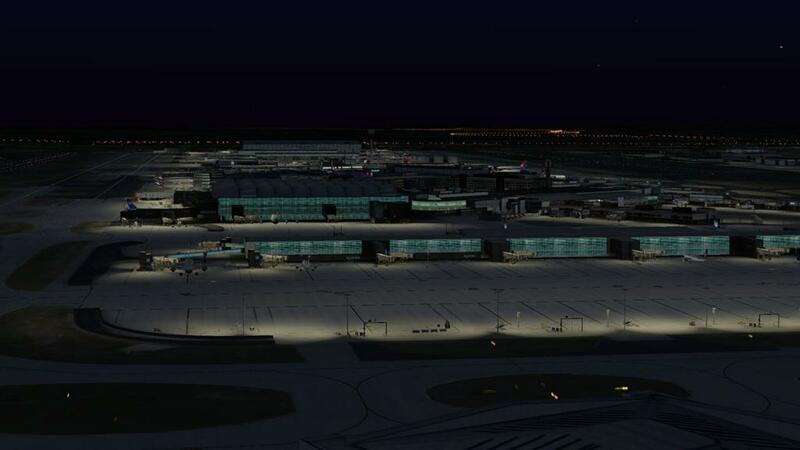 The tower was constructed on site at the world’s busiest airport. 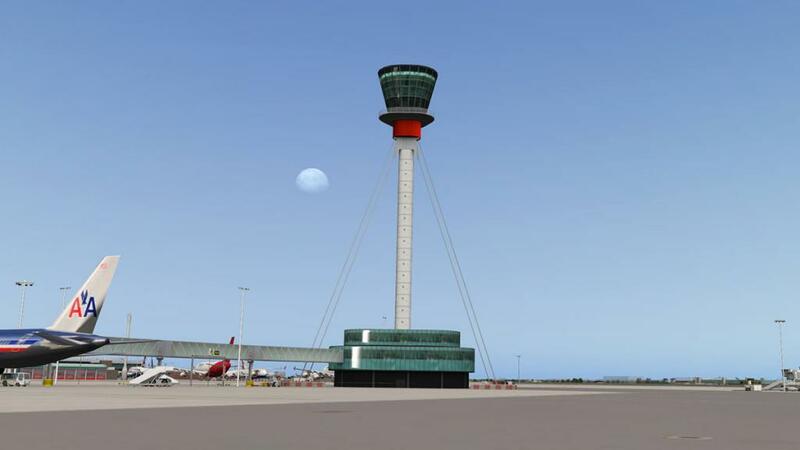 The 30m high cab at the top of the Tower is equivalent to six storeys and weighs more than a jumbo jet. 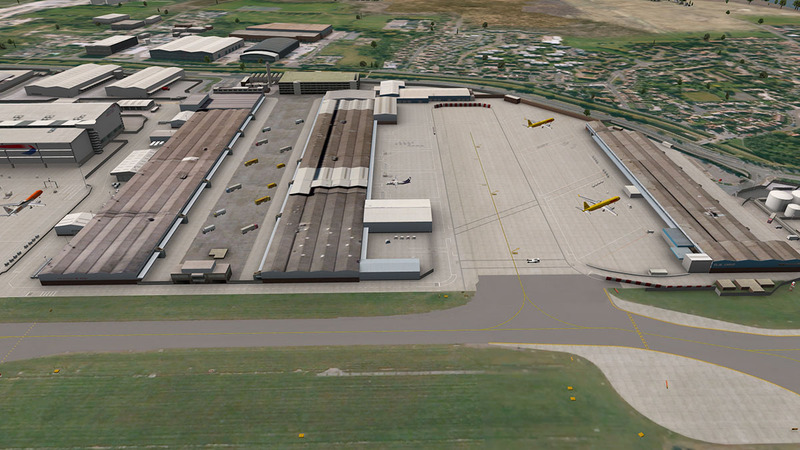 It was built on the airfield perimeter, on the 29 October 2004 it was moved 2km overnight to its final location. 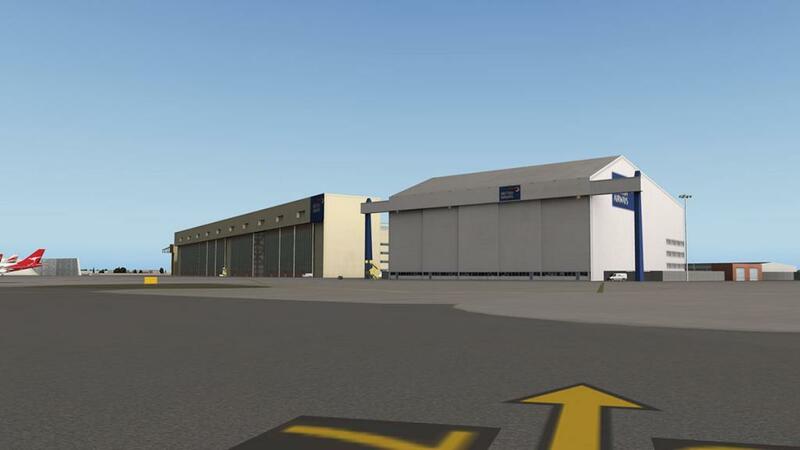 Over a 12 week period, the structure was raised by jacks; six steel mast sections each 12m high and 4.6m in diameter were progressively slotted into place. The tower was finally anchored to the ground with steel cable stays. (There is cable Discovery show of the whole construction process). 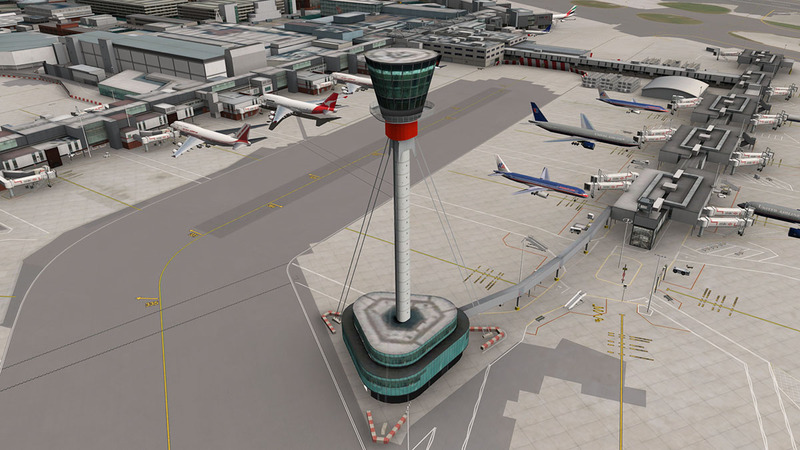 The new control tower was always going to be significant to the scenery, and no doubt here it is. The design is excellent and the tower looks and feels very realistic. 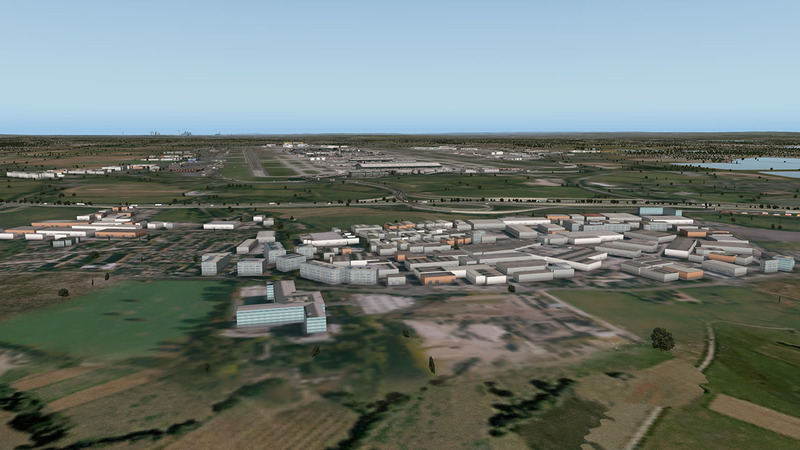 Tower view is excellent as well, with all the areas and runways of the airfield covered with no obstructions. 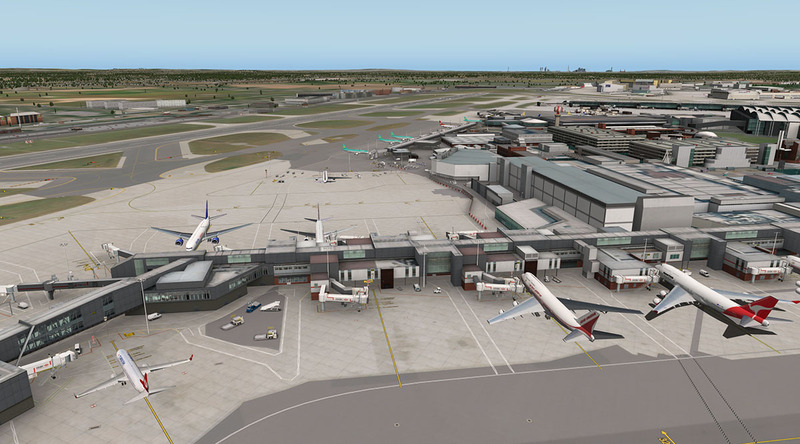 Opened in 1986 on the site of a former farm or farms called Mayfields and Mayfield Farm, Terminal 4 is situated to the south-east of the southern runway next to the central cargo terminal and is connected to Terminals 1, 2 and 3 by the Heathrow Cargo Tunnel, and is now home to the SkyTeam alliance, as well as some unaffiliated carriers. 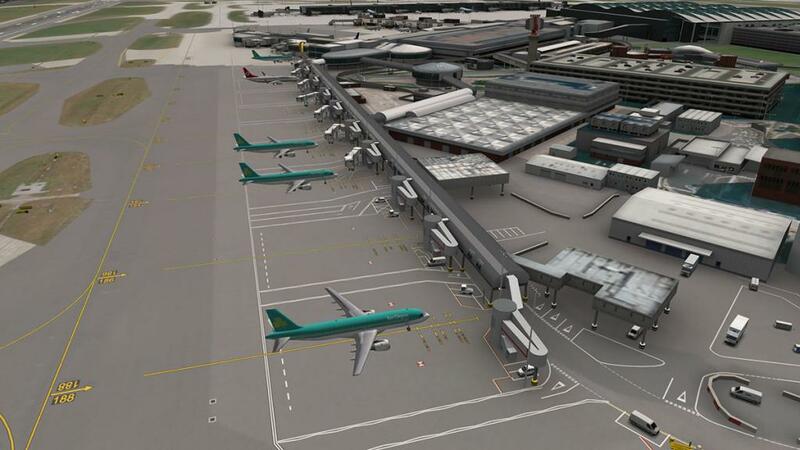 Terminal 4 has recently undergone a £200m upgrade to enable it to accommodate 45 airlines with an upgraded forecourt including two new stands to accommodate the Airbus A380 with Malaysia Airlines and Qatar Airways now operating regular A380 flights. 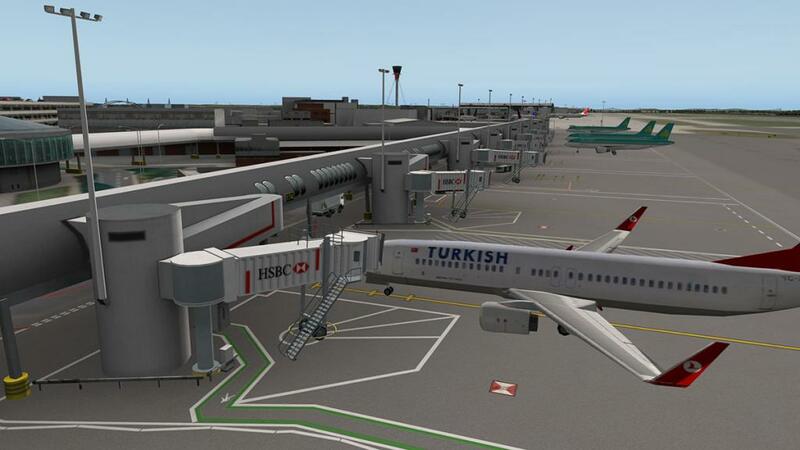 (Malaysia Airlines may soon with draw their A380's as they are leasing them to Turkish Airlines). 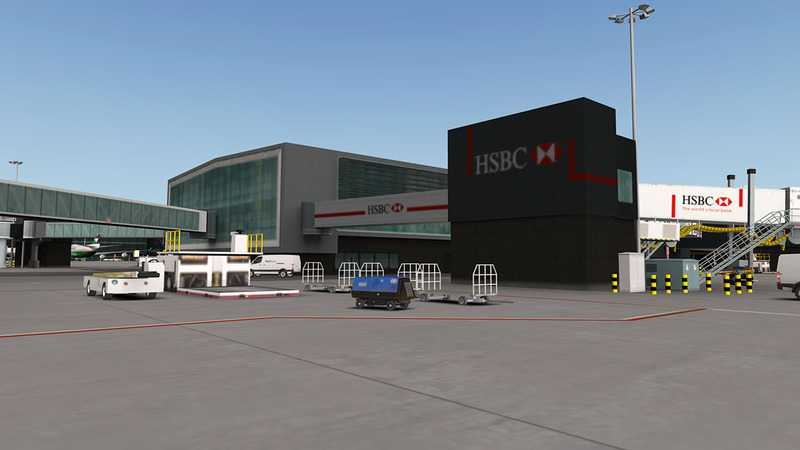 Aerosoft have updated the scenery to take in the changes at Terminal 4 and so you get your A380 gates and updated lounges (as viewed from the ramp). 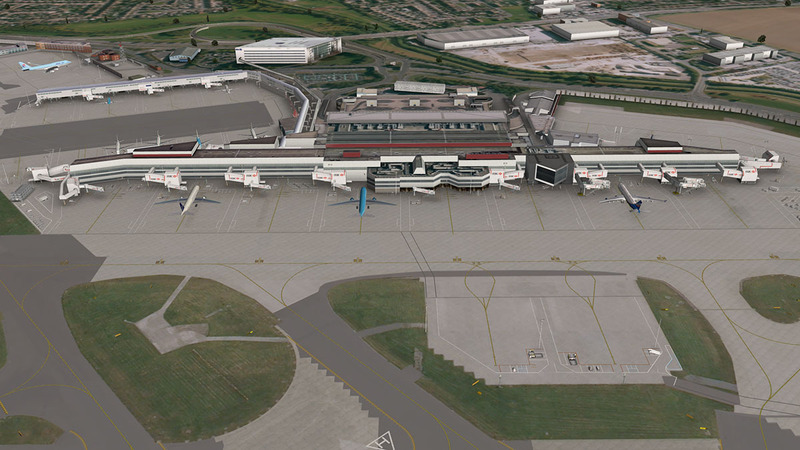 In some ways T4 is a very conventional terminal with the arrival building central and a pier going out each end. On the northern end it goes into a large U section with a pier at the eastern point. The pier is not noted separately but as part of the northern extension. 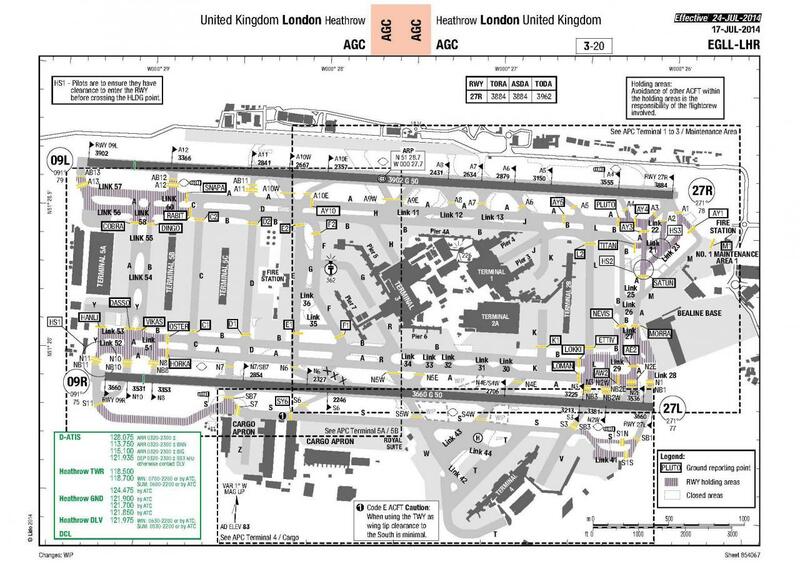 T4 Gates start south-east 1, 1a,1b, 2, 3 then loop around the front of the building to the north 4 -12 with 5a/5b and 6/6a being the A380 gates. At this point you go around the U infield with Gates 14 - 25. Stands follow the same course with 401 - 403 then 405 - 412 and in the U 414 - 429 there are three remote stands behind the U 430 - 432. 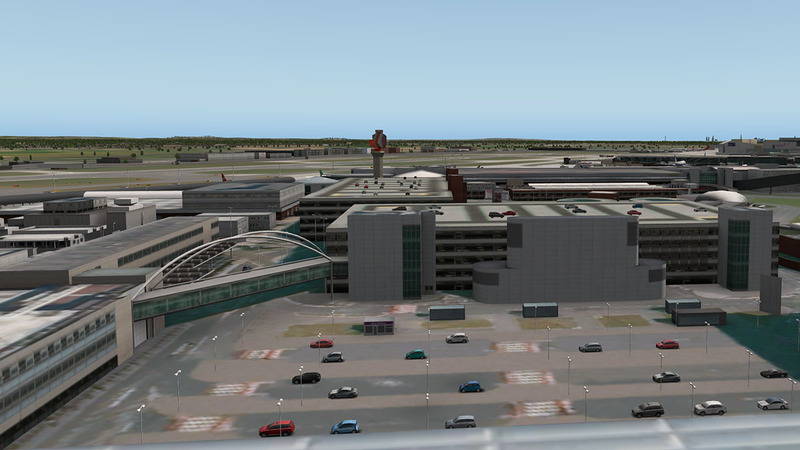 Stand 406 is noted as 461 and Stand 429 is a non-airbridge stand close to terminal access. The terminal is again an excellent replication of the current buildings and piers, stands are full to brim with ramp equipment and vehicles and other areas are detailed well with used and stacked empty cargo containers. So authenticity is very evident while moving or parked in the areas. 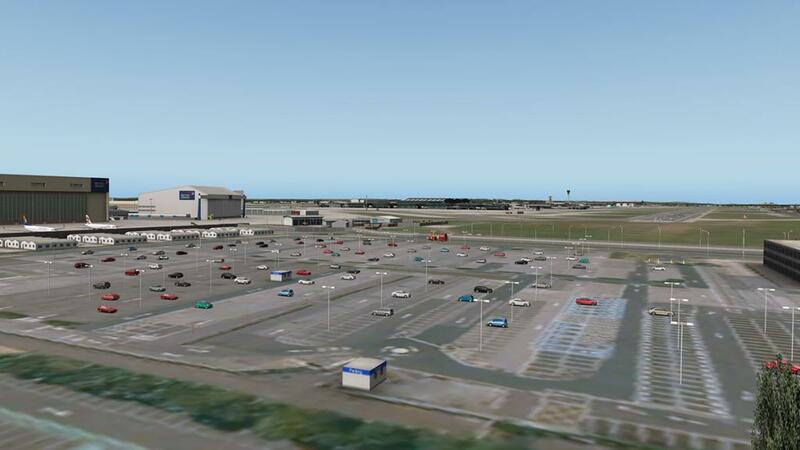 Carparks and all arrival areas are very well done with (not a lot of cars) positioned correctly. 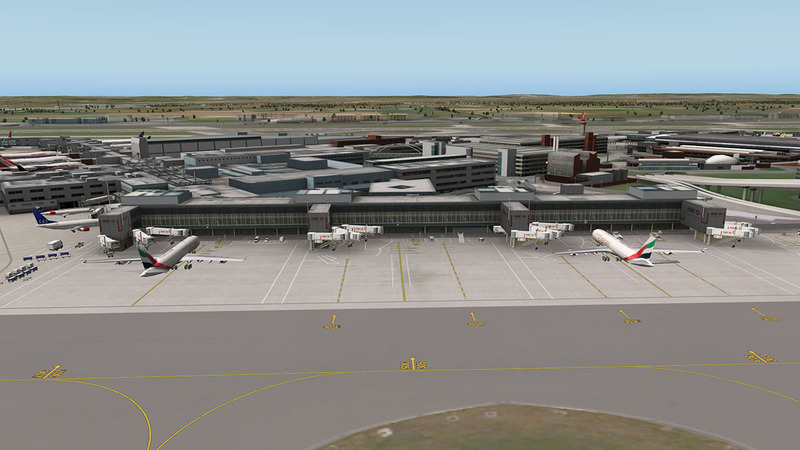 There is a Hilton hotel situated in front of the terminal, but it is quite average? Here it is represented just as an angled box with textures on each side, when in fact the front is a folded in design, and quite striking. To do the fold design was quite an easy thing to do? 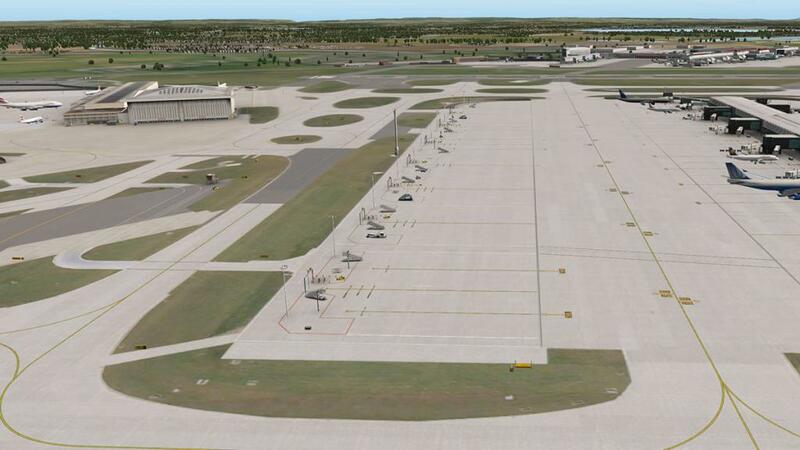 Directly opposite T4 is two remote stand/parking areas, in one central and one aligned along taxiway W. Both are good for refueling or aircraft flight preparation. 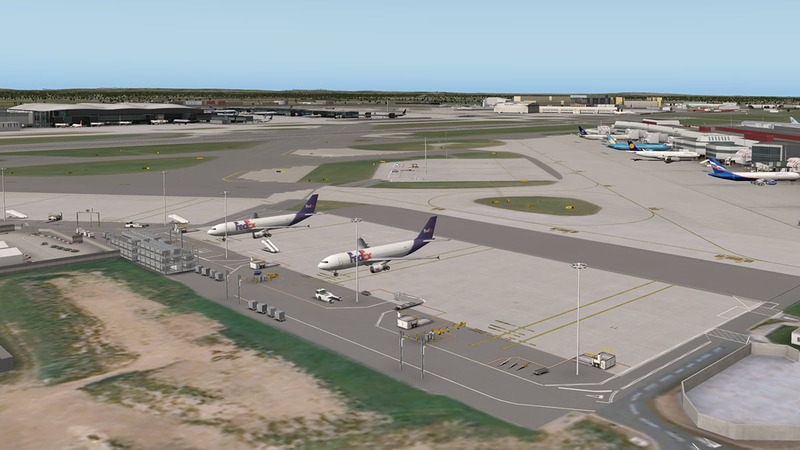 There are a few FedEx aircraft here with the static feature, but these stands are too far away from the Cargo area to be really effective unless for parking. 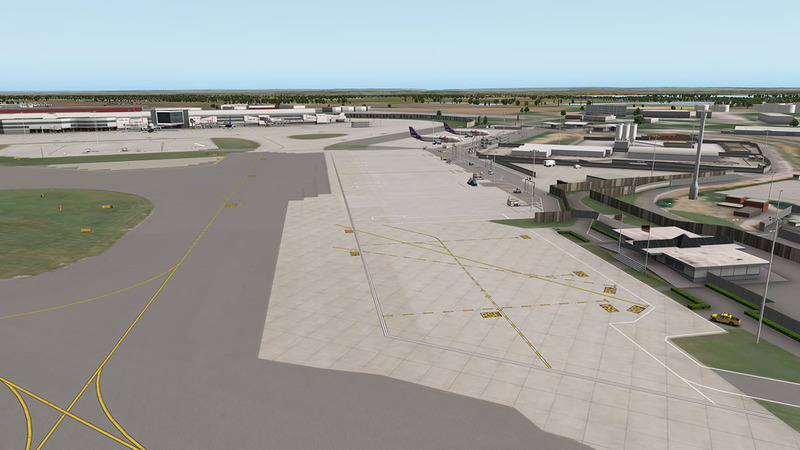 Central remote stands are 440 and 441, W taxiway stands are 449 - 456. There is a Royal Suite and VIP receiving centre that was run by that upper-crust snotty nosed woman in the reality show. So a great place to deliver your special guests or Royal charters as the ramp area and building is very authentic. The flags don't fly however? no flapping "Flags of the World" here? 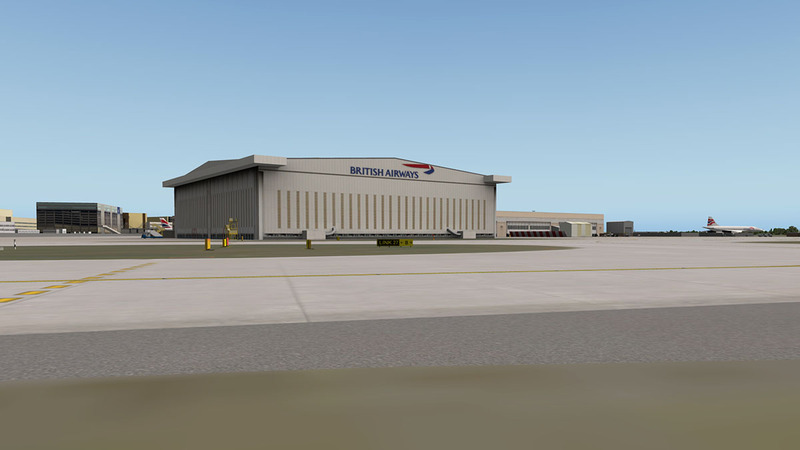 The Heathrow "British Airways World Cargo" building is a very distinctive C - Curved design that was built in 2008, and Aerosoft have done a brilliant job in recreating it. 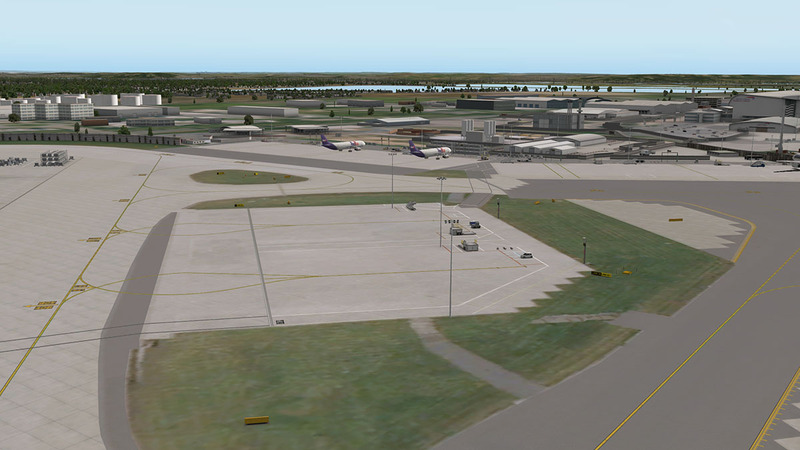 And any landing or taking off on Rwys 09R/27L will love the view aspect of a pure Heathrow design. All the correct Heathrow cargo elements are set out correctly here and the cargo area is very detailed and well represented along the (very empty of vehicles) Southern Perimeter Road. 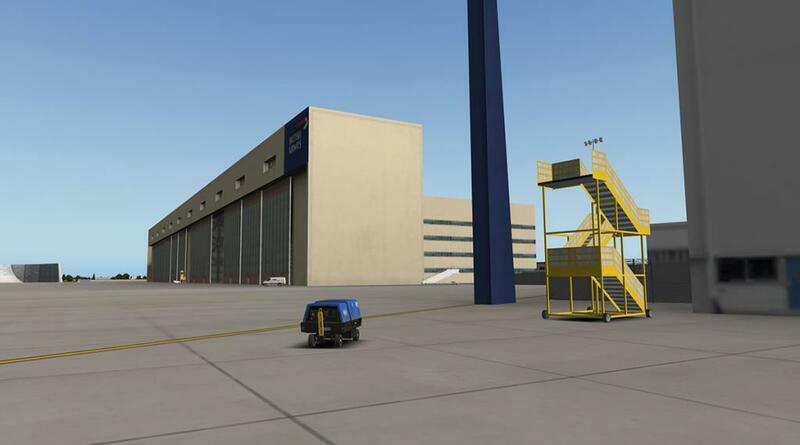 Any serious hauler arriving or departing from the Cargo area would not be disappointed in their surroundings, it is here as good as it is going to be. The older warehouse style piers are noted by their building numbers 577 or 582 along Sandringham Road. And are very authentic with great worn rusted roofing and skylights and tired brick bases (very British) and very well done here, and there is a cargo fuel depot situated far west. 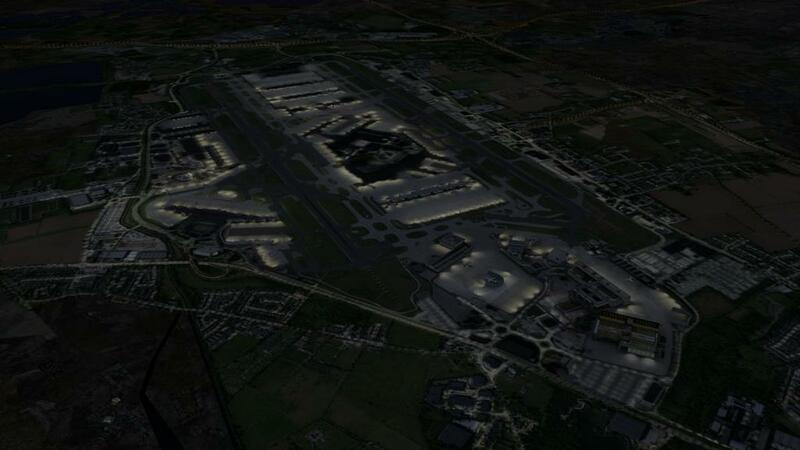 All of the far eastern areas of Heathrow and the covers of the approaches of Rwys 27L and 27R is the large maintenance bases of British Airways and Virgin Atlantic. 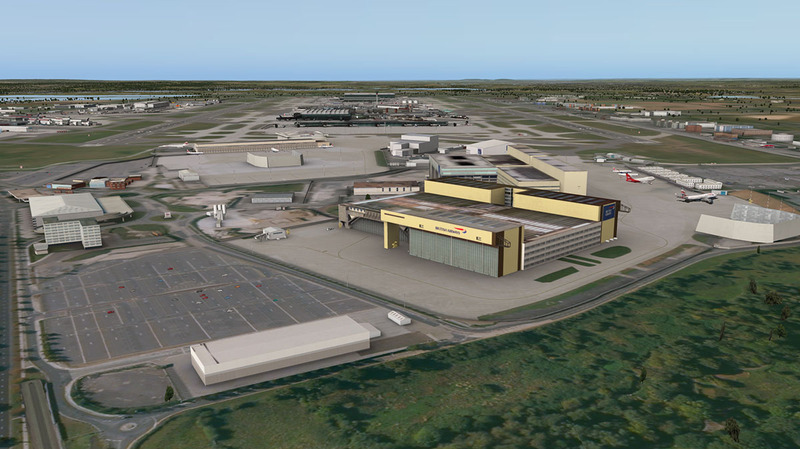 For many these areas are as famous as the airport itself, as most aircraft launches including the famous Concorde were done here. The BA base is huge, but once they were two areas for both BOAC and BEA, one area is still known as BEALINE Base even though the airline has been merged now into BA for decades. 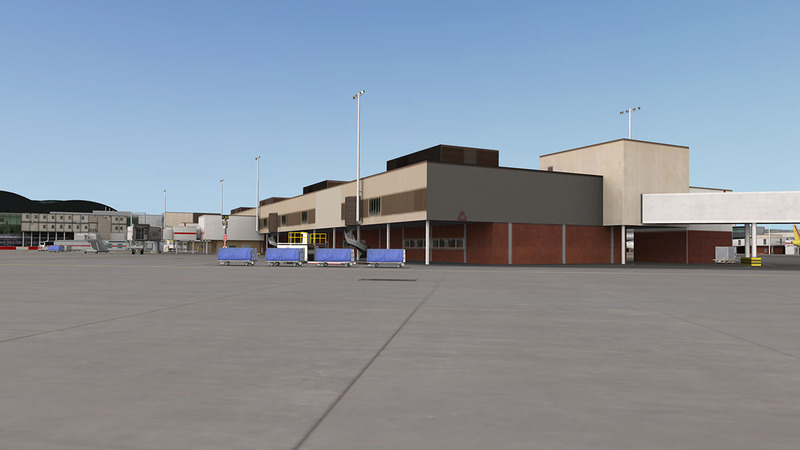 Aerosoft have recreated buildings that still look the same as passed by them everyday back in the 70's, certainly there has been a few new logo signs here and there, but mostly it is still the same. 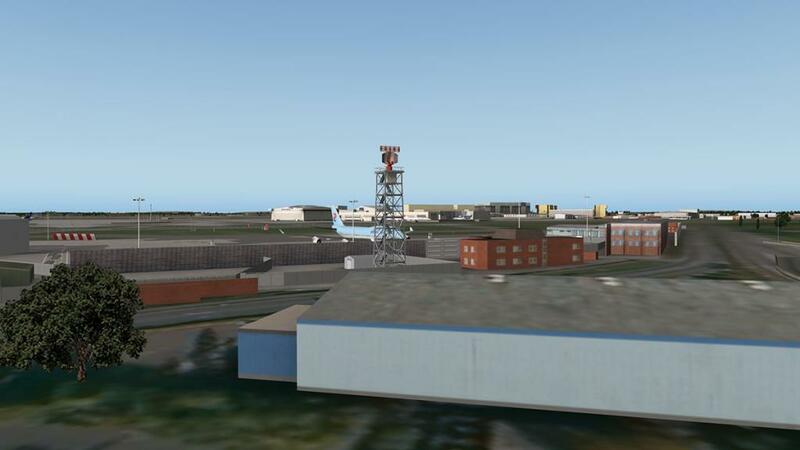 The buildings are very realistic and familiar which is the very point of good scenery. 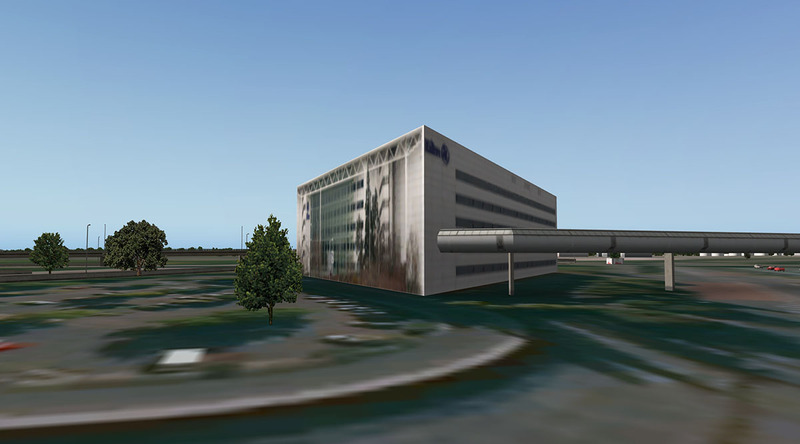 But the area feels very empty on the ramps around the buildings, There are few details but a few more items here would have not gone astray. 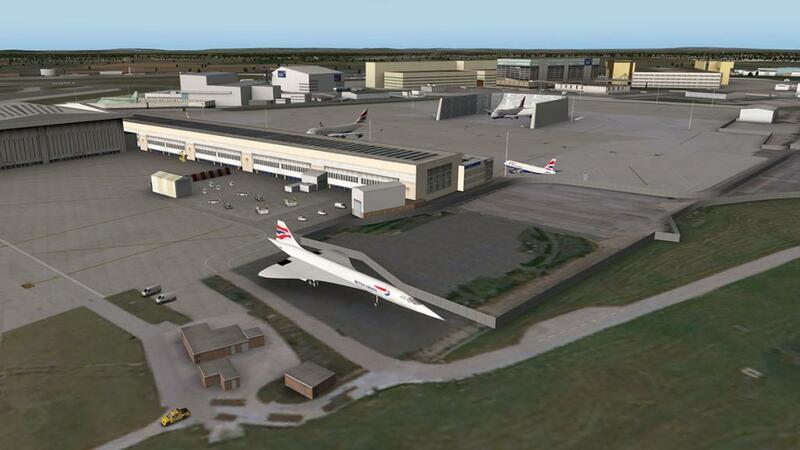 Concorde BOAB is situated in the old Concorde engine test bed (tied down so it won't fly away or up) on the approach to runway 27L, the Old BEALINE engineering building is behind the aircraft. The iconic Virgin Atlantic maintenance hangar is well represented as here, with its distinctive shape. 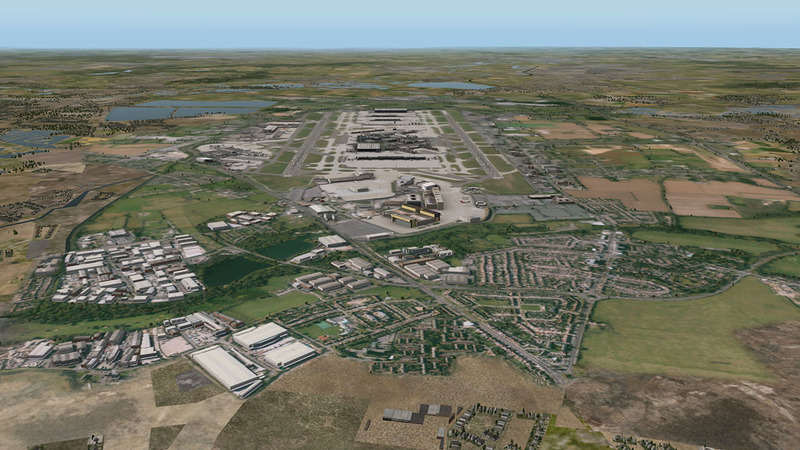 One of the biggest fears I had with any Heathrow scenery was not with the actual airport, but with the areas along the north of 09L/27R or the North Perimeter Road. 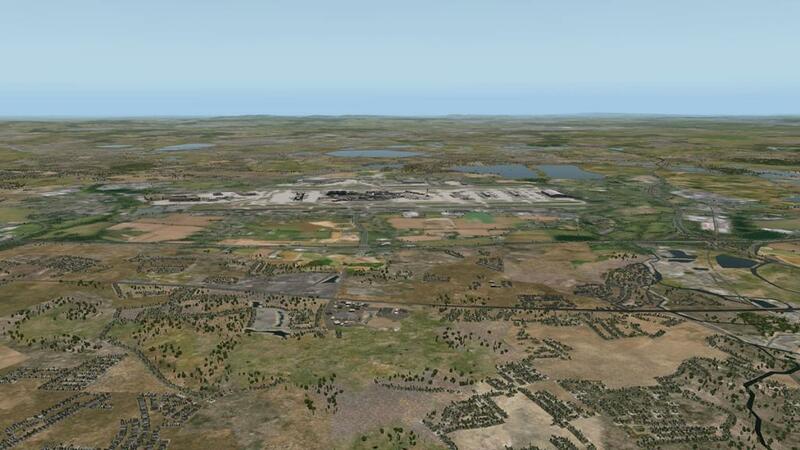 Here we fear not, as any view when landing or taking off is well filled out to the north. 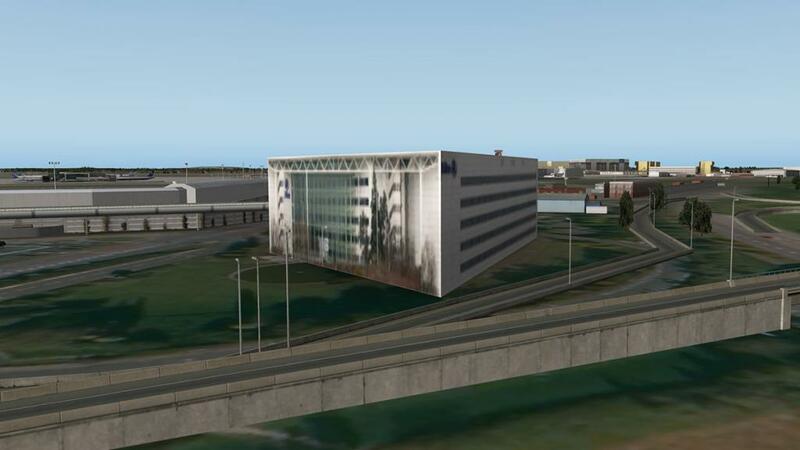 The area mostly consists of car rental offices, car parks and hotels including the Renaissance London Hotel that rents room out for great views of Rwys 09L/27R. 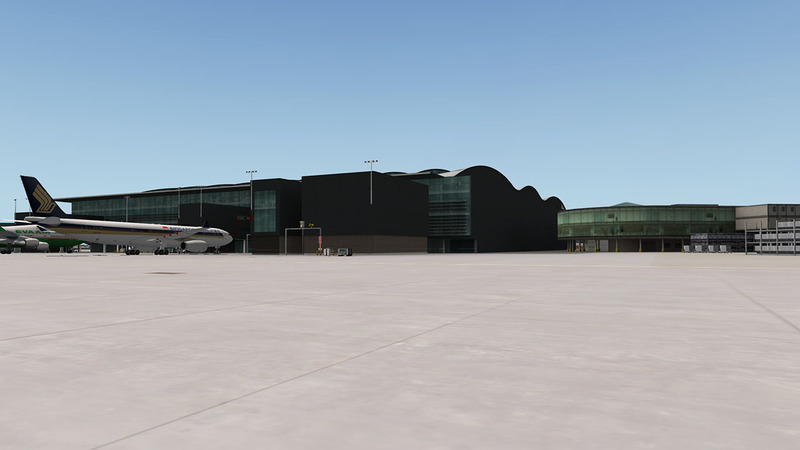 There is HM Customs house here as well with the main entrance to the airport. Most of the areas have been reproduced well including all the car rental offices and hotels, but the rental car parks are quite thinly filled. 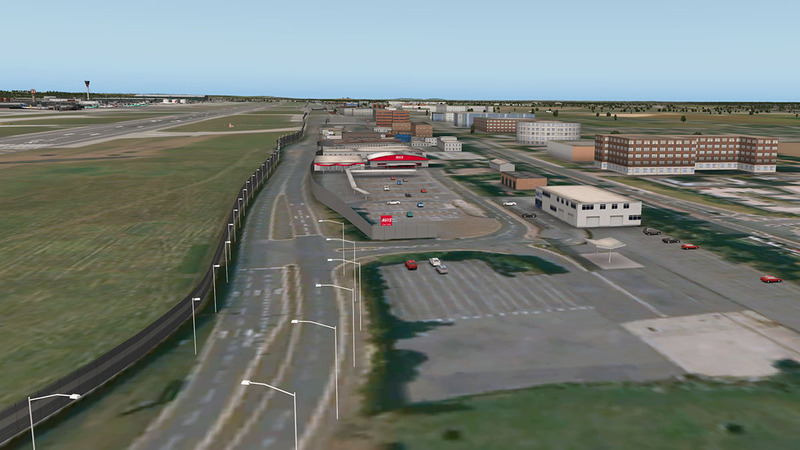 The area looks quite empty mostly because the underlying photo images cancels out the X-Plane traffic roads feature, as it does at other various areas around the scenery. So any movement or traffic activity around Heathrow except for the M25 in the west is mostly lost. 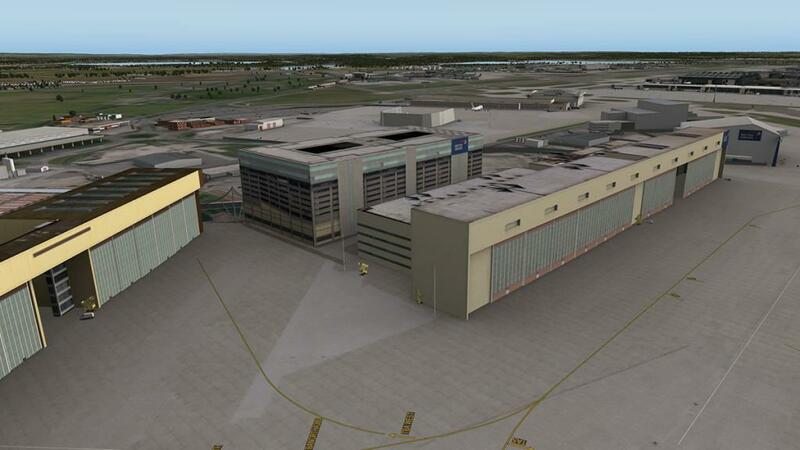 There are basic building items in groups set out beyond the outer airport boundaries, they are not really anything of detail, but basic building forms, but they do go a long way in building up a complete picture of the airport area, and they are very good. 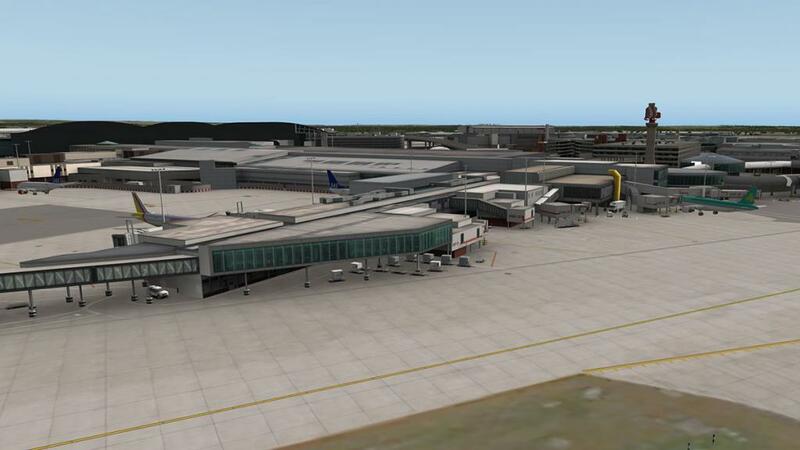 But there is no interaction with the X-Plane autogen scenery and so you still get a blank area between the Aerosoft scenery and the default autogen and makes the outer areas slightly dead. Lighting is good, but only a single tone. 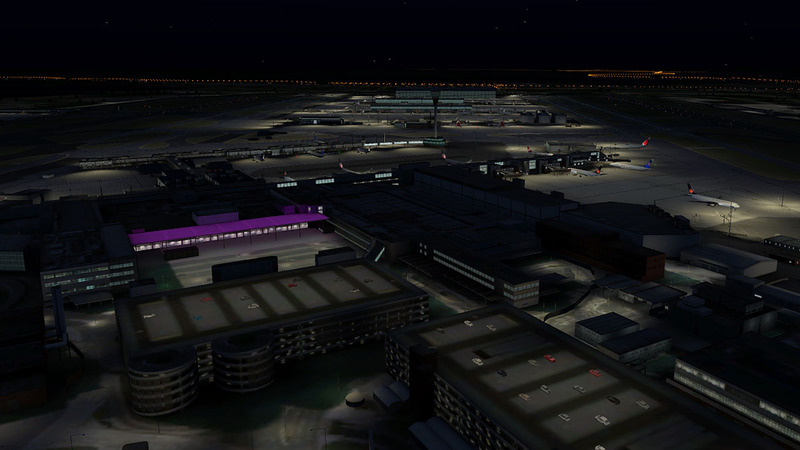 So although the areas are very well lit, there is not a lot of variation or very different types of light sources like you see in carparks and various off ramp areas. It is not boring, but could have been better. 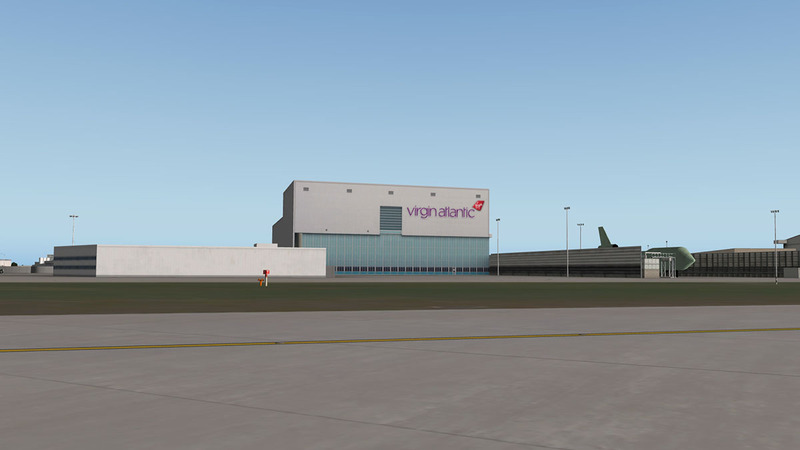 The Virgin Atlantic T3 entrance stands out from the single tone in a bright Branson style purple. 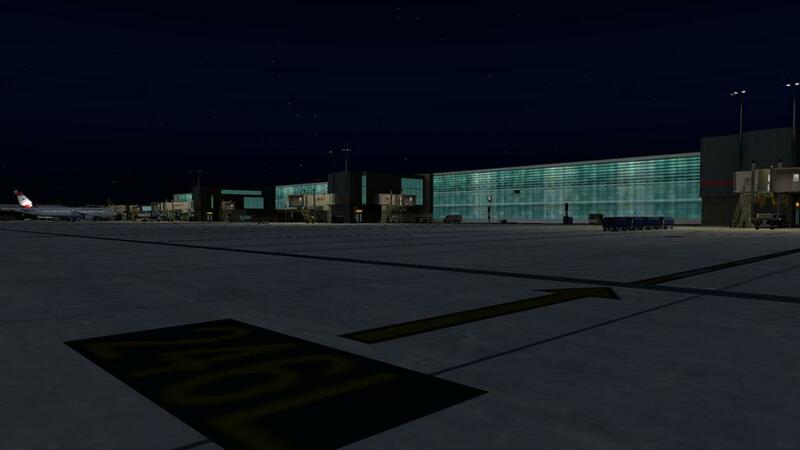 Get in close to the terminals and the glass textures again shine brightly (sic) They are beautifully created to give a realistic feel to the airport. 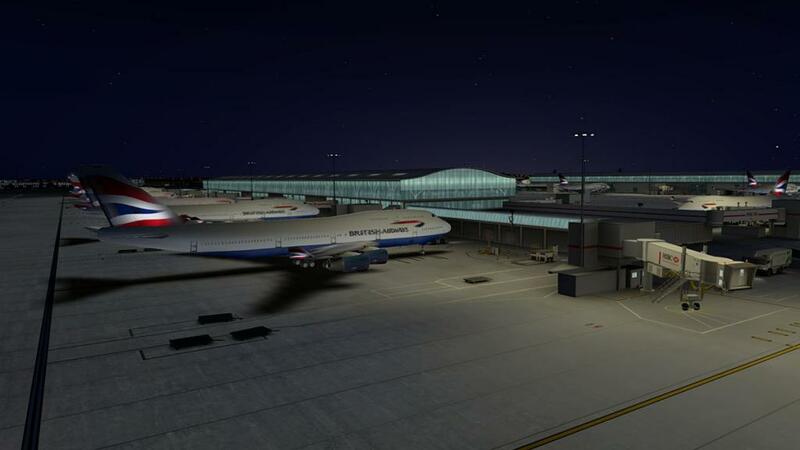 T5 mega building glows like a jewel with the new T2 looking great as well and the ramps are very well lit to work on. 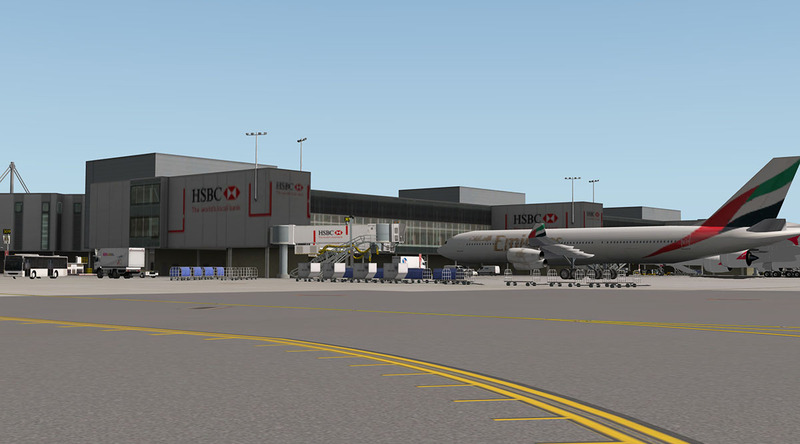 The T3 Pier 5 A380 gate area is excellent with a depth of the internal views that is highly realistic. 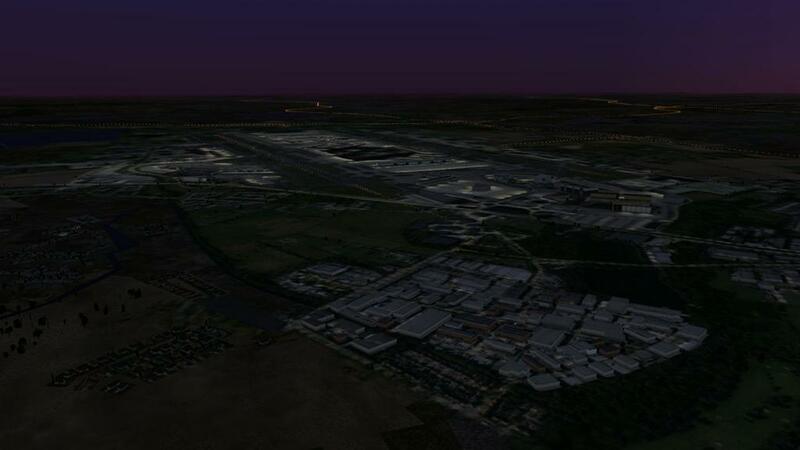 All runway lighting and taxiway signage is first rate, landing at Heathrow at night can be a great experience. At the top of this review we talked about frame-rate and the triple-wammy effect that you get with heavy scenery like EGLL, a heavy aircraft and lots of surrounding autogen. 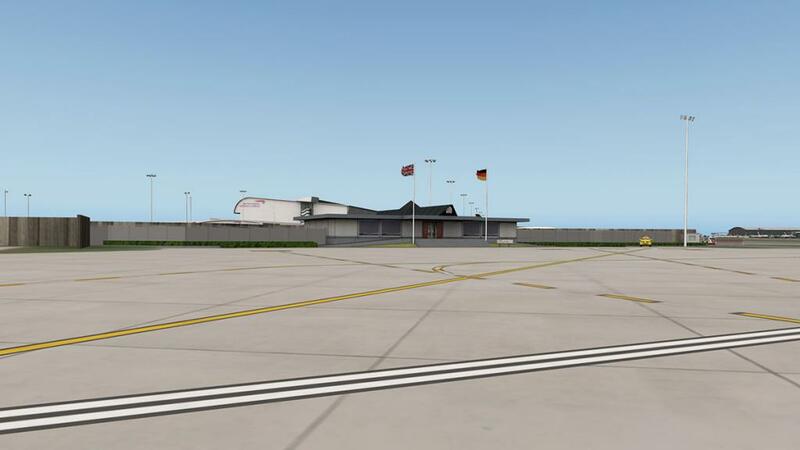 Certainly you want to fly heavy aircraft like FlightFactor's B777 and the excellent JARDesign A330 out of LHR, but one I use quite regularly is Peter's Aircraft Airbus A380. Chances are my frame-rate with this aircraft is usually marginal at best here, and the average is just right on the margin of 18-19 frames. 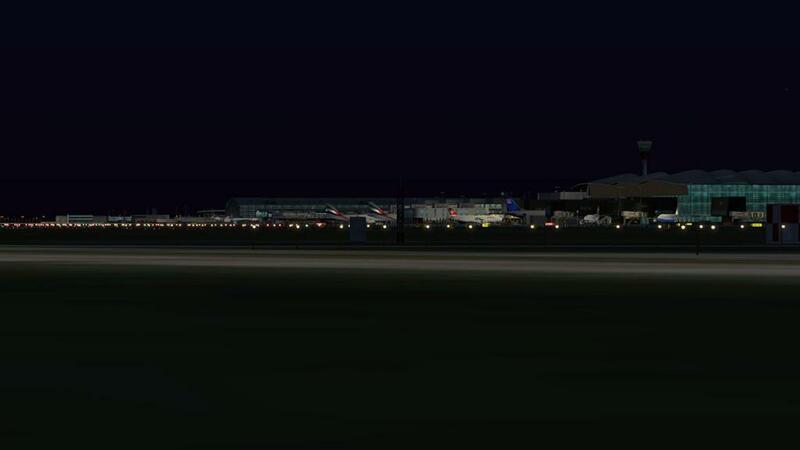 This makes the aircraft a bit of hard work and usually stuttering slowly around the airport is not much fun either. So try this... Most times to reduce your autogen you lower your "world distance detail" to get your frame-rate back up, but it is still marginal? 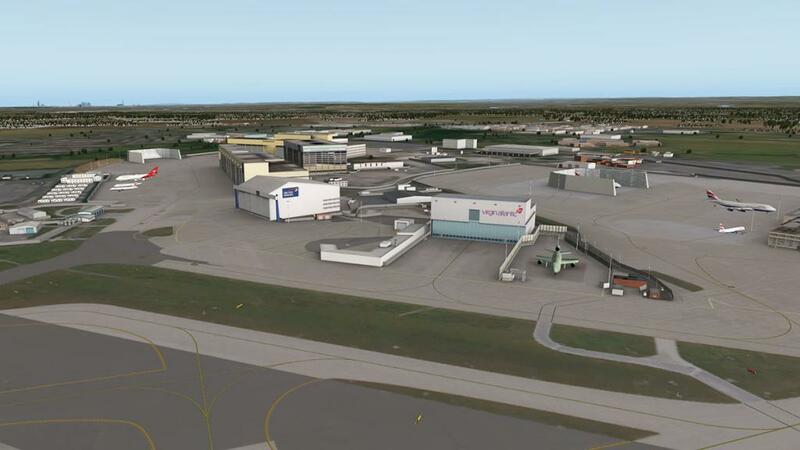 but it is also messy in then X-Plane re-renders the full simulator to readdress the autogen outlay. 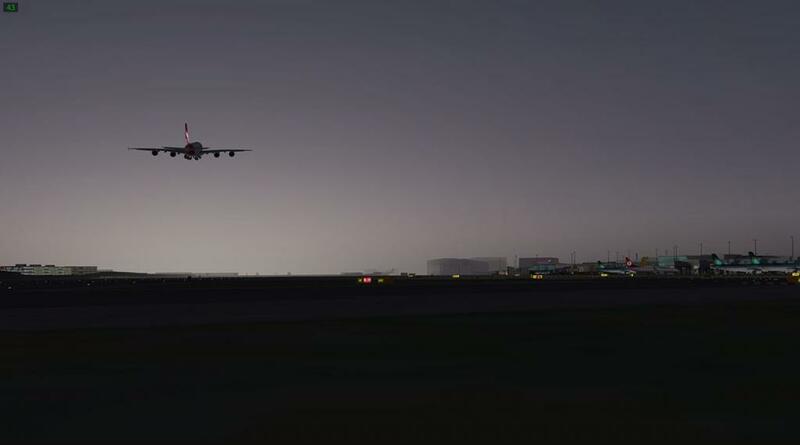 A quicker way is too reduce your visibility distance on the Environment/Weather/Set weather uniformly for the whole world X-Plane menu, 6nm will still leave you with a slight blue sky, but 5nm or less can gain you more frame-rate by blocking out the autogen in the distance. In the A380's case 5-8 frames, not a lot you ask? 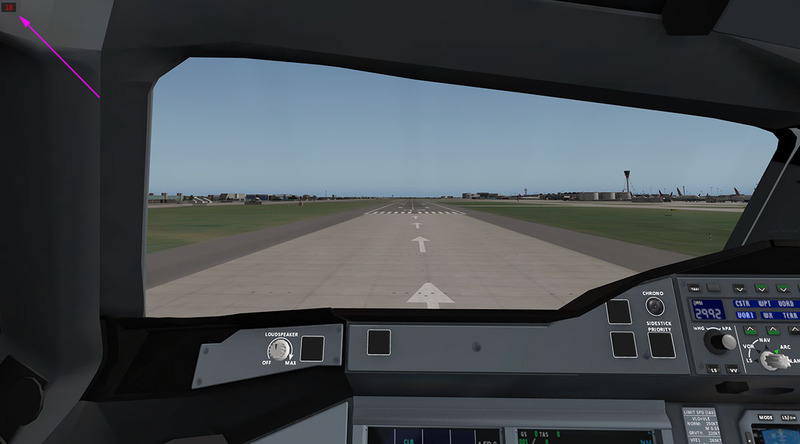 but it still gets you off the borderline frame-rate stutter and makes the aircraft usable. out of the heavy frame-rate killing 3d cockpit and your frame-rate is 25 - 28 frames. It depends on the situation, but I have had as high as 30 frames in this mode and making EGLL and other very heavy scenery airports possible, and adjustment is instant as well with no rerendering. 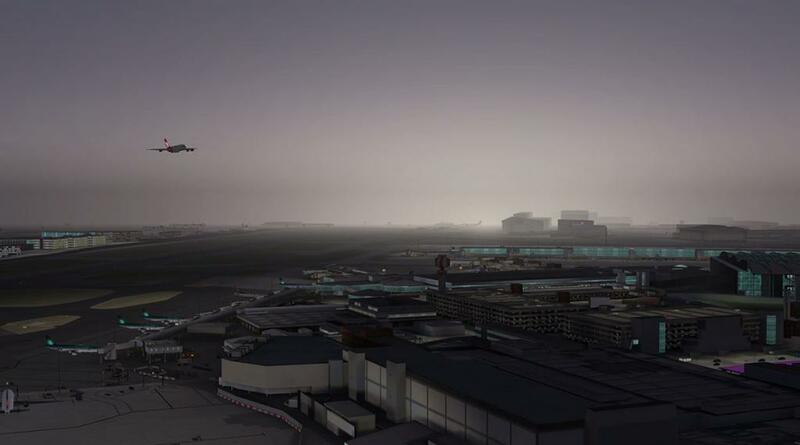 Yes you will get a very misty and foggy sort of view if you pull the visibility back to the lower numbers, but London-Heathrow is that sort of airport, days of bright sunshine and Heathrow don't really fit into the same sentence mostly. 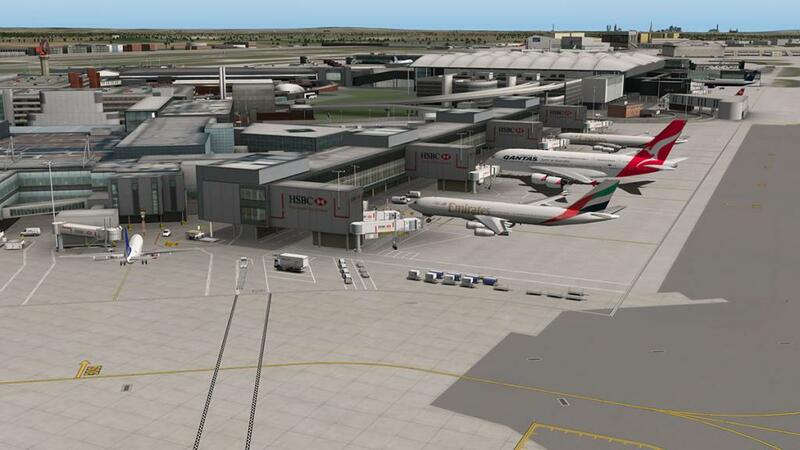 So LHR looks actually more authentic with this setting than it does on bright summers days... Departures can be breathtaking early in the morning as seen by this A388 departure to Hong Kong and with a very nice 43 frame advantage. 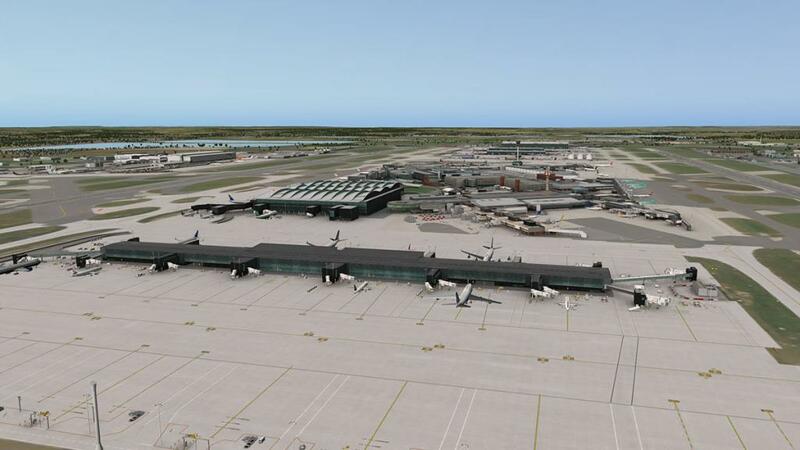 Most airlines and routes run out of LHR, so to list them all would take pages of this review. So basically the terminal complexes are broken down into the alliances and their members, if you follow this guide you won't go far wrong. 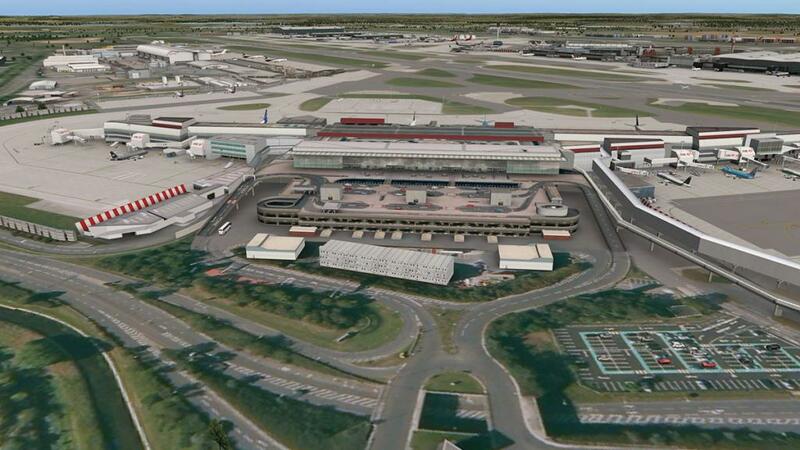 From a distance it does not look as comprehensive as it is, but once inside this Heathrow you will want for nothing. 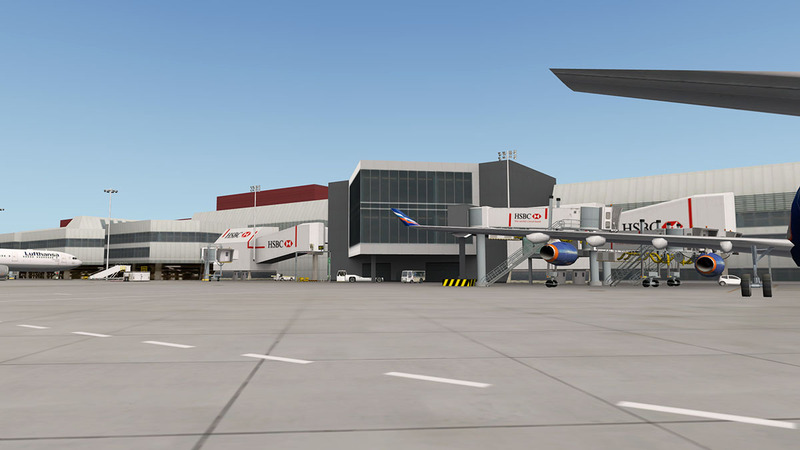 Buildings, Terminals and the total infrastructure are simply awe-inspiring and the texture design is almost an art of perfection. 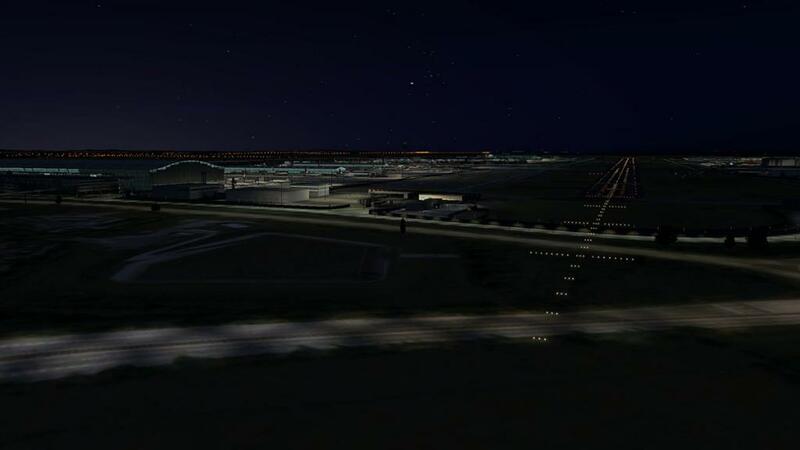 You do look in and not out of Heathrow and in the areas that the aircraft are used you want or view for nothing, but an outward view is a little sparse like in the areas between the terminials and outer airport boundaries. 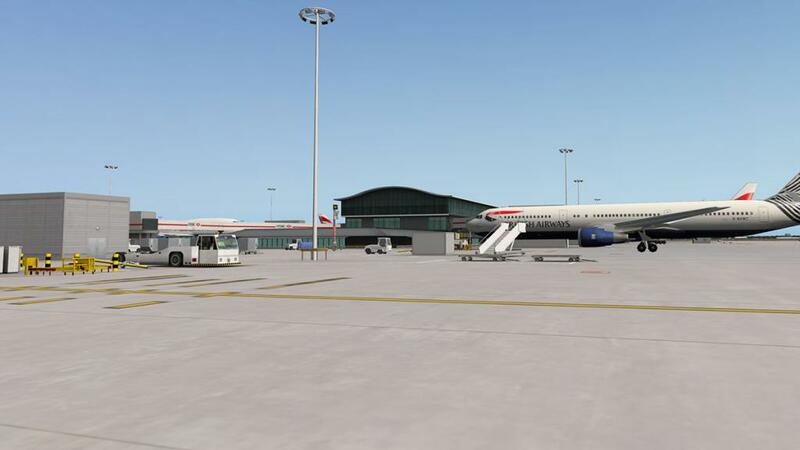 To be fair, you can't install everything and choices have to be made to allow the scenery to be used, but carparks can be filled and more animations to cover blank areas would fill in a lot of space. The non-rotating radars are a noted oversight. 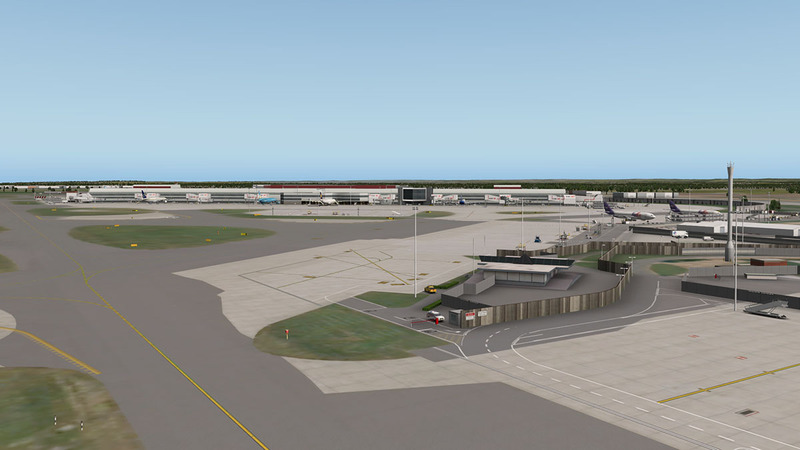 Animated apron traffic is a highlighted feature, and you have "safedock" but no actual moving gates (just a few would have been nice) actual taxiway layout with new rapid runway exits and taxiway links is complex and very realistic. 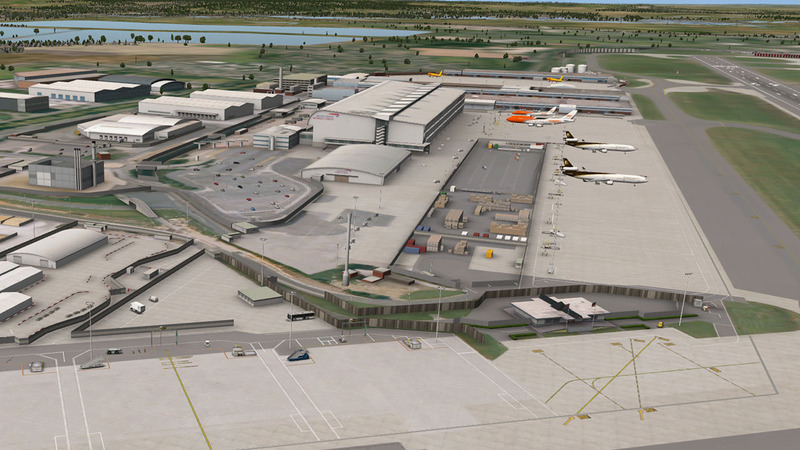 And London Heathrow with near airport surrounding areas is about 42 square kilometers in total. 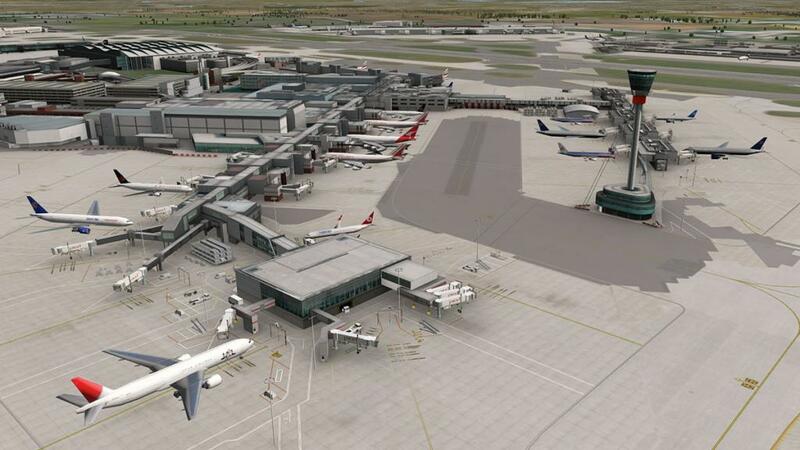 The airport is right up to date with all the T5 and T2 complexes available and great representations of the older and more familar terminals gives the airport users a great choice between old and new facilities. Overall EGLL London Heathrow Airport is a significant scenery, well delivered by the award-winning team sim-wings and a extremely good investment for the X-Plane simulator. 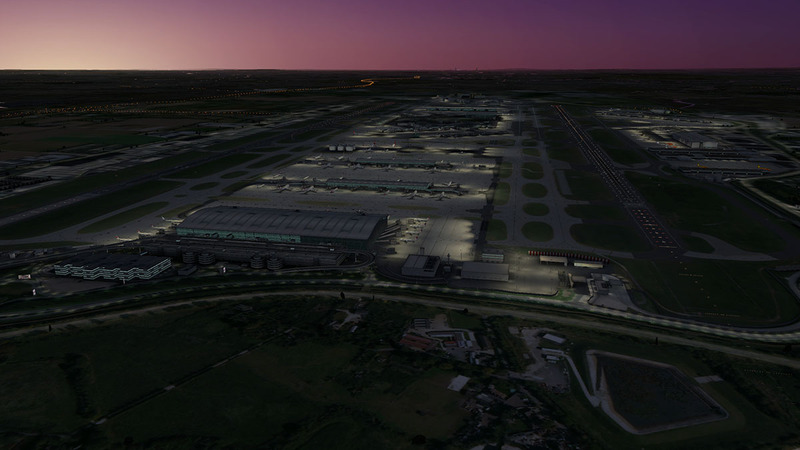 If you run your routes and Europe is your hub, then you can't really not have this LHR missing from your collection, with a few extra updates to cover the few minuses, it could be one of the best large airport sceneries available for X-Plane... It is that good. Installation : Download is 880.20mb and installed to 2.47gb and the scenery is placed in your Custom Scenery folder. "Static" aircraft add-on can be downloaded from the Aerosoft site - (Free Payware extension) EGLL - Statics a little editing is however required. 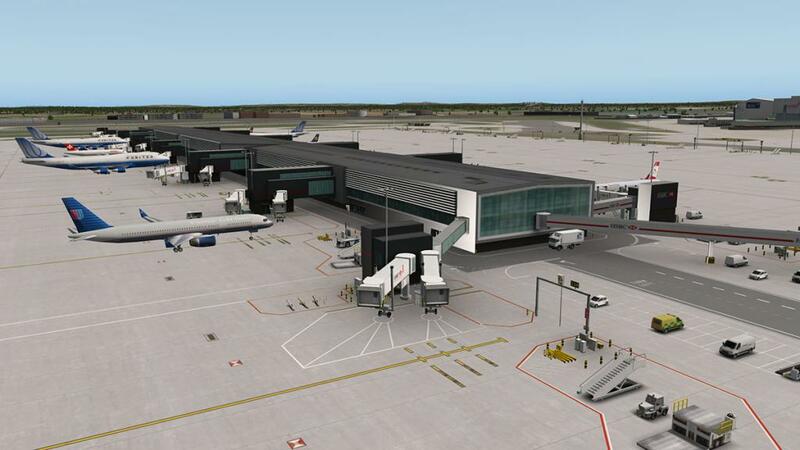 Aerosoft provide their own installation application with the scenery and a serial number is required. The installer will insert the scenery into the main X-Plane "Custom Scenery" folder and remove the "Global Airport" default EGLL version. The "safedock" feature is off in the install. 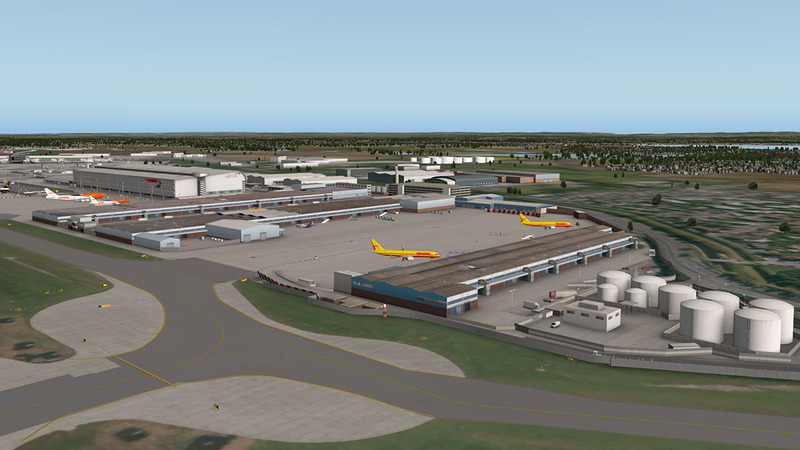 To activate the "safedock" align parking you have to switch over the supplied .dsf (tile) files. The image shows how your files should look when changed over and the safedock is activated. You take the installed +51-100.dsf and label it "+51-100.dsf.no_safedock" and remove it from the +51-100 tile folder... and the file noted as +51-100.dsf.safedock is then changed by removing the "safedock" text so it shows just +51-100.dsf and is then placed into the +51-100 tile folder. 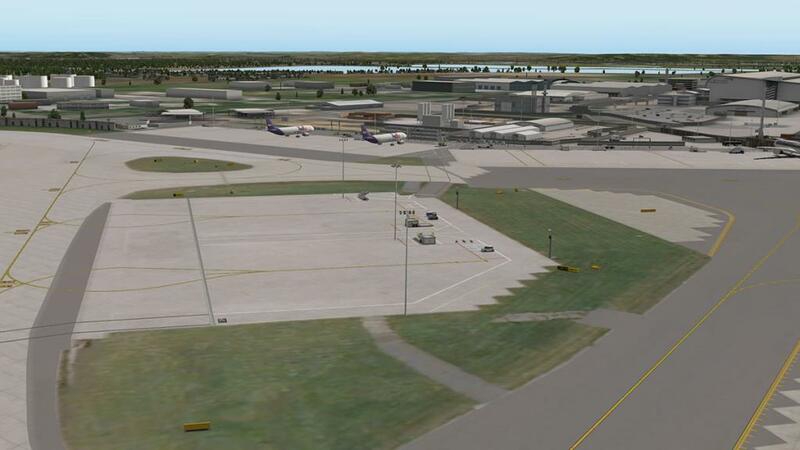 Once you run X-Plane the safedock pylons and system will guide you into the ramp areas. Fully customized high resolution aerial ground textures (about 30cm/pix) with custom detail textures for taxiways etc. 3D video card with at least 1 GB is required! YOU MUST HAVE OPENSCENERYX INSTALLED FOR STATIC AIRCRAFT TO APPEAR. Just wanted to say thankyou. I've just ponied up my 35 Aussie dollars on the strength of your extremely thorough review. 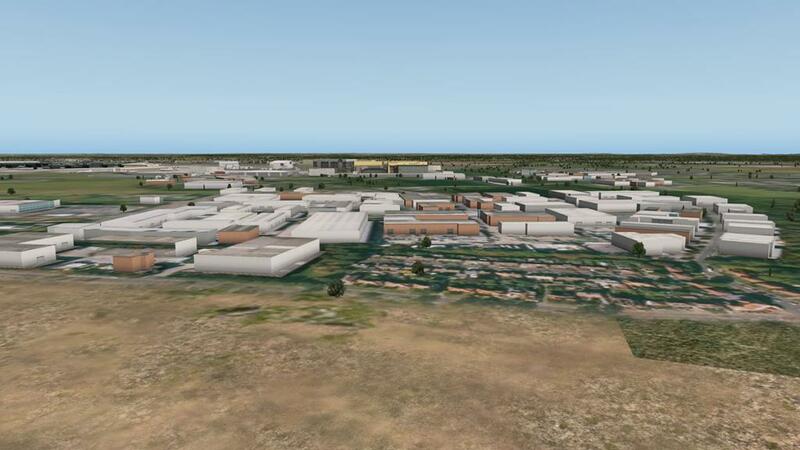 Like you, I'm really impressed with the extraordinary level of detail, and I was particularly pleased that Aerosoft have included the link to the (optional) static aircraft file - I think they add as much to the overall experience as the buildings themselves. 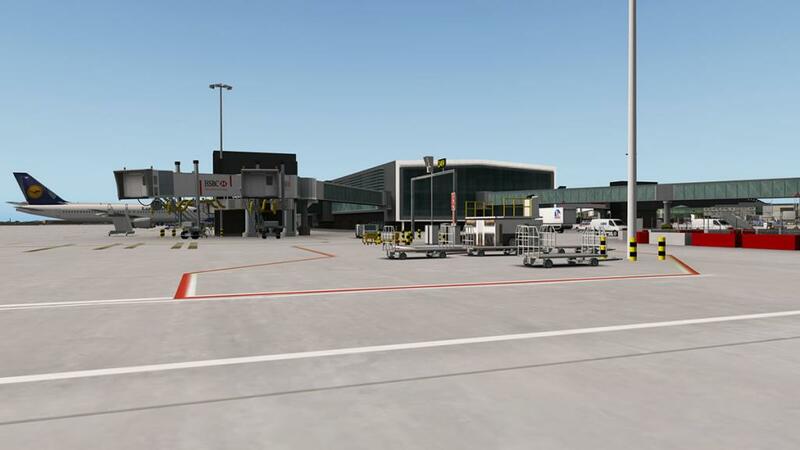 Also like you, I'm rather disappointed that there are no animated gates - just the few gates that don't have static planes at them would have been good. 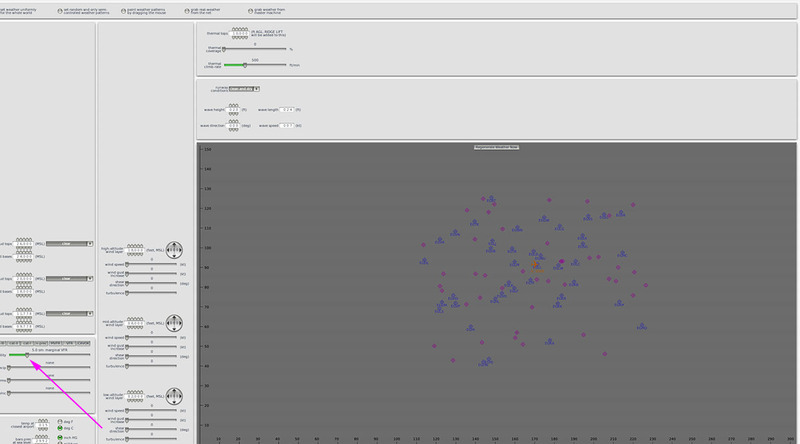 Also, I'm quite disappointed that the central radar isn't animated. 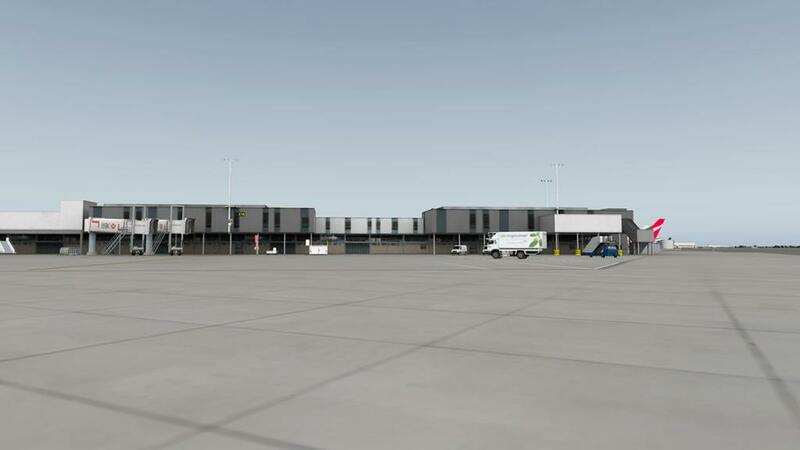 In the context of a huge project like this, you wouldn't think it would be difficult to do, and it's the single most distinctive moving feature of the entire airport. Overall, though, I'm really pleased with EGLL. Well thank you, I appreciate the feedback... Like I mentioned in the review a lot of scenery is not cheap, the idea is to what is a good investment and what is not. Scenery and money is wasted to a point if you buy it and don't use it. 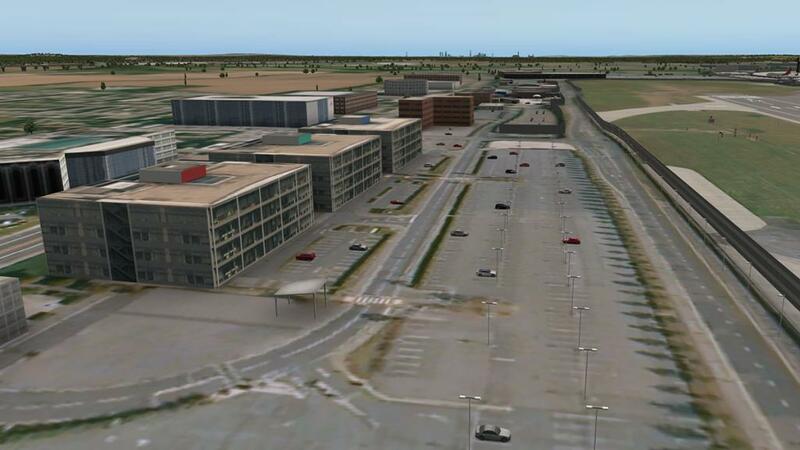 So not only is the actual quality of the scenery important, but the position and use for your routes is important as well, I tend to focus on this in my reviews to give users the very best use of a scenery and to get the best out of their investment... 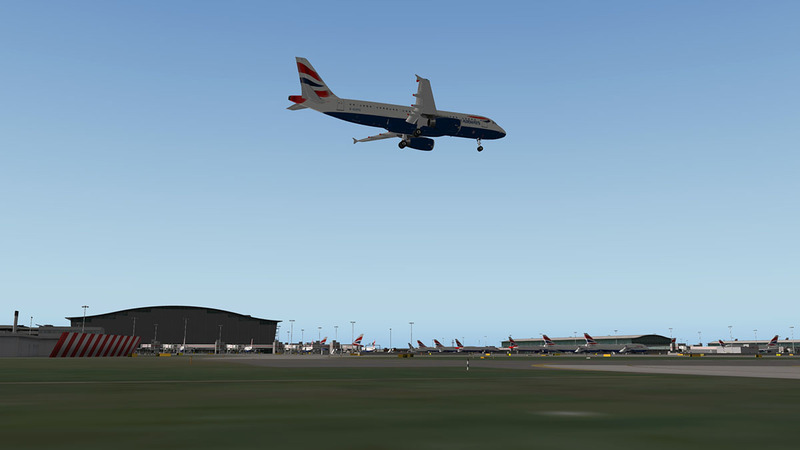 Overall there is nothing more exciting than landing at a really great quality scenery, and like you mentioned EGLL -London Heathrow certainly delivers in that context. I think this is a good scenery, even if it appears a bit "flat" (for example in the runways textures) and also too much polished...everything seems almost new...and Heathrow it is not clean and new. For this I think the price is a bit high even if the effort for developing it was for sure hard! 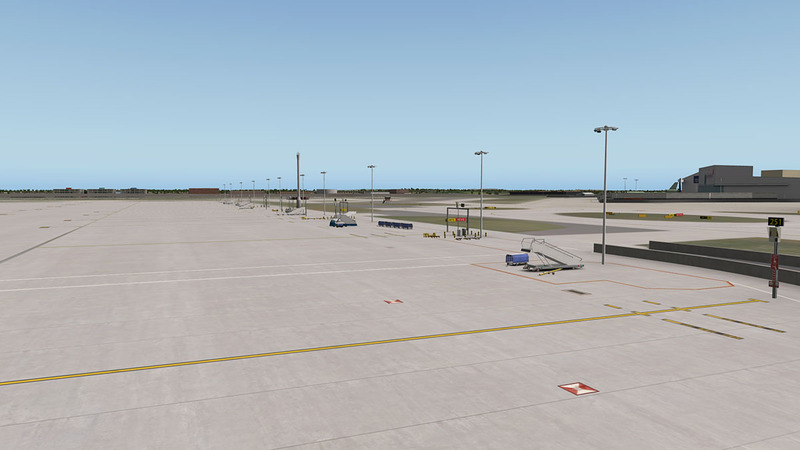 I've put some decals also on the ground textures and on apron/taxiway textures and all seems a bit more real...you should try this!